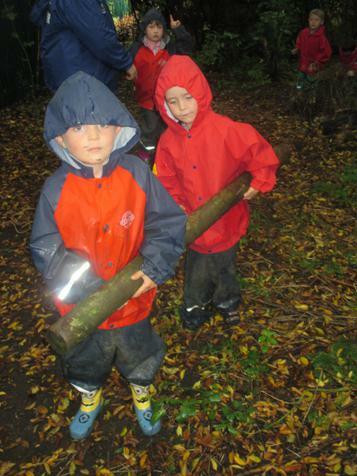 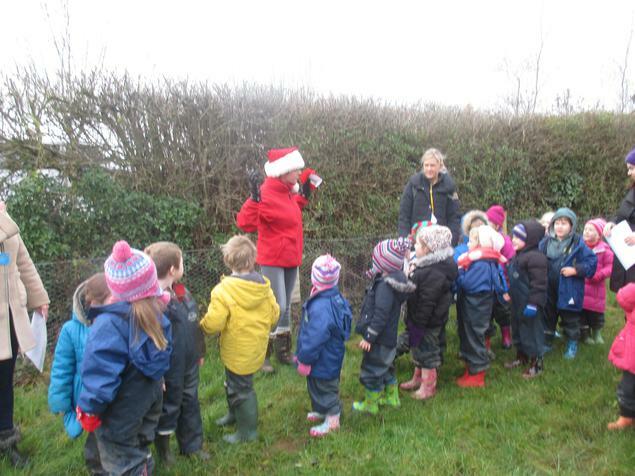 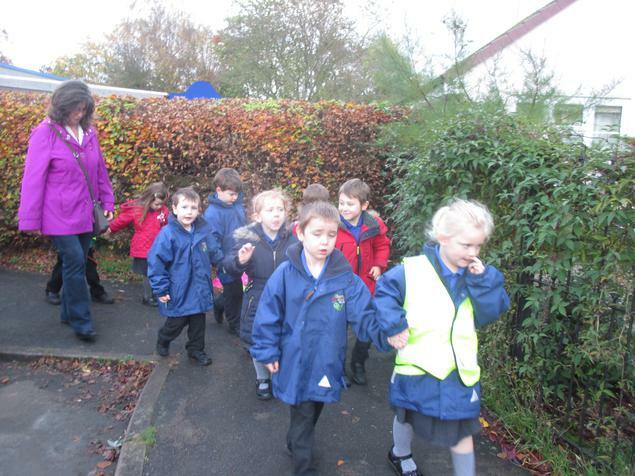 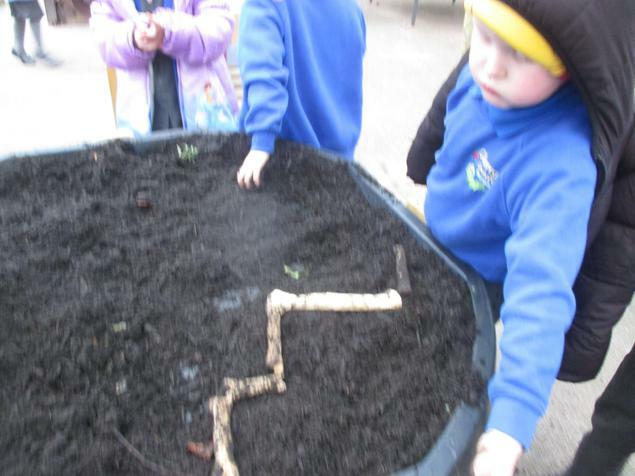 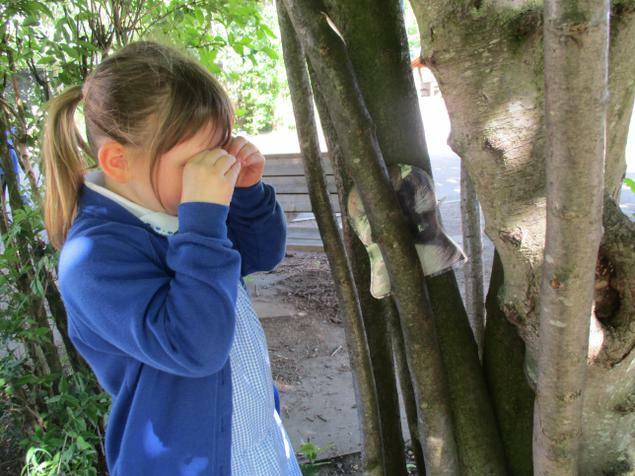 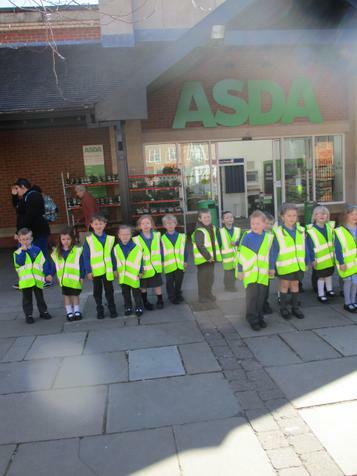 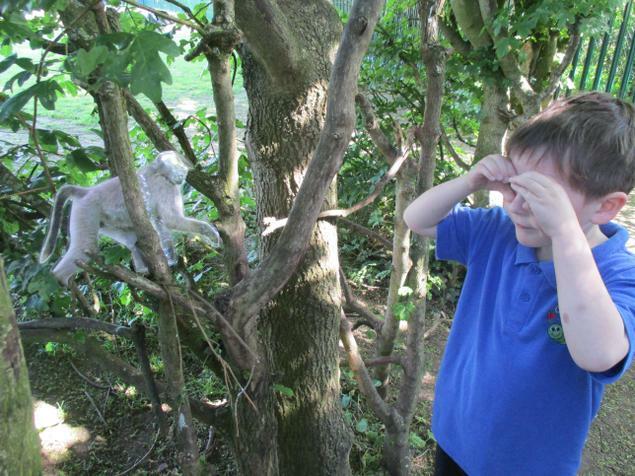 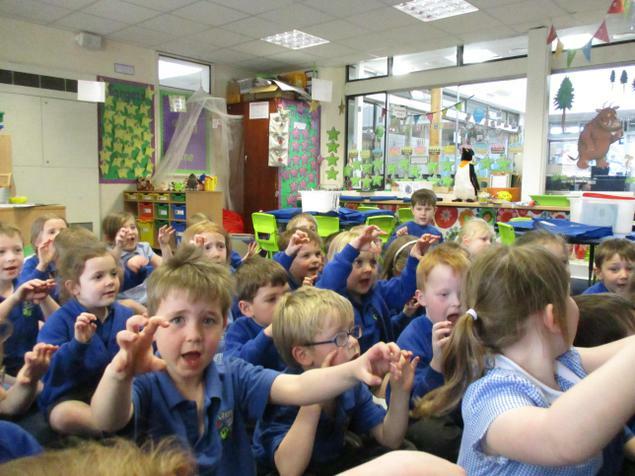 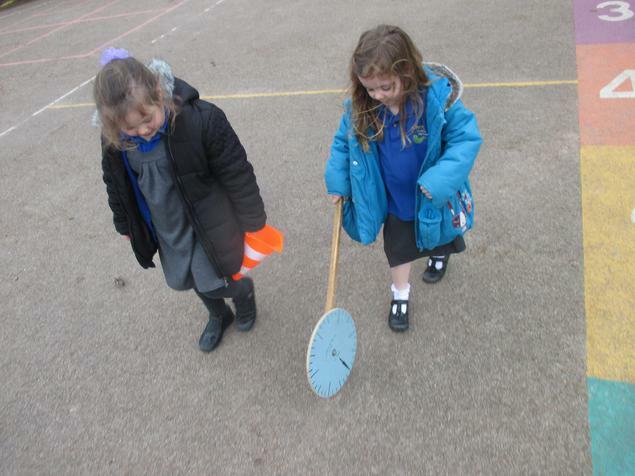 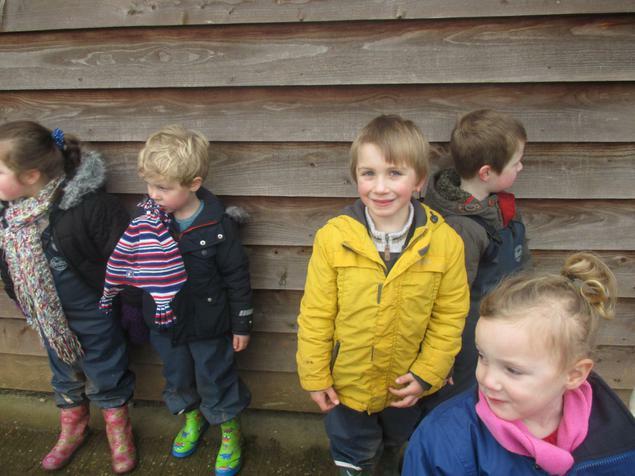 Reception will need to be intrepid explorers if they are going to safely return the penguin to his rightful home. 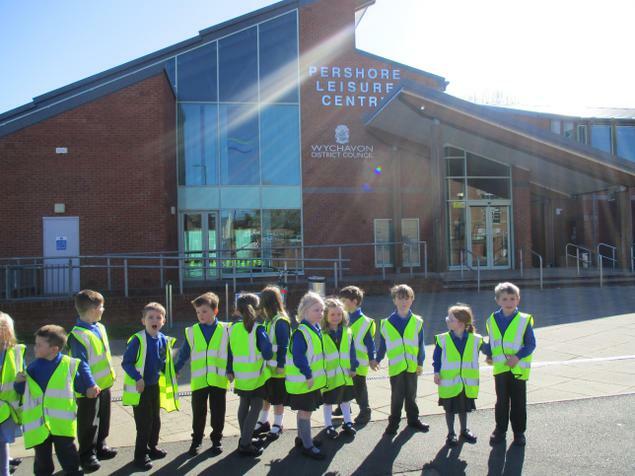 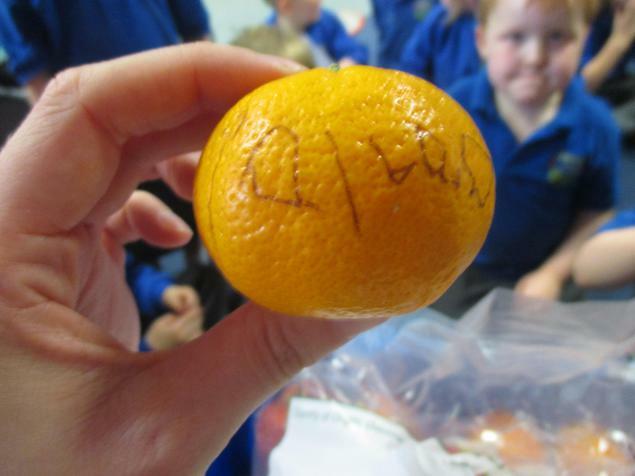 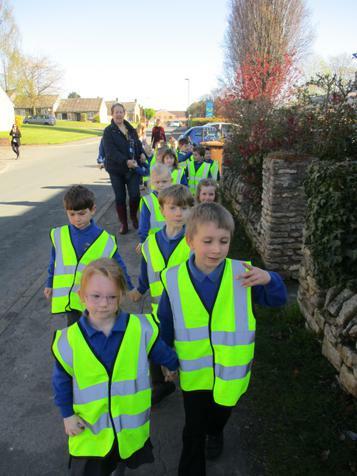 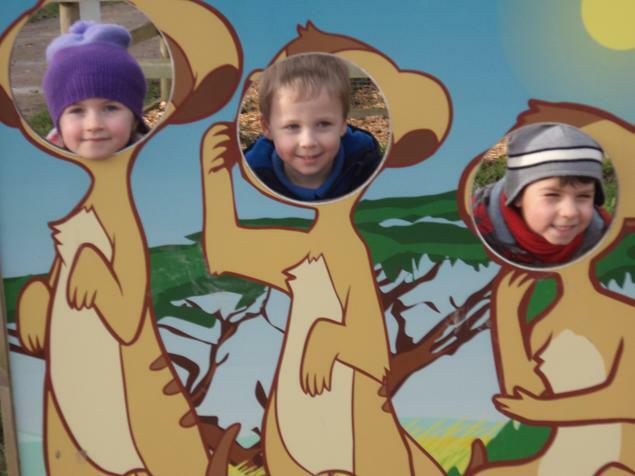 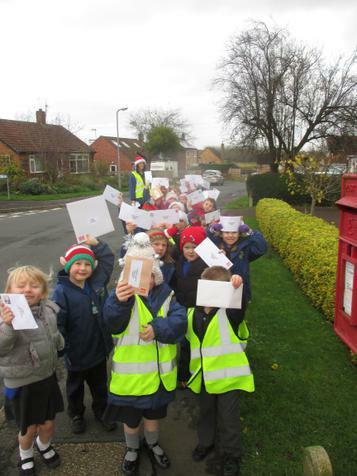 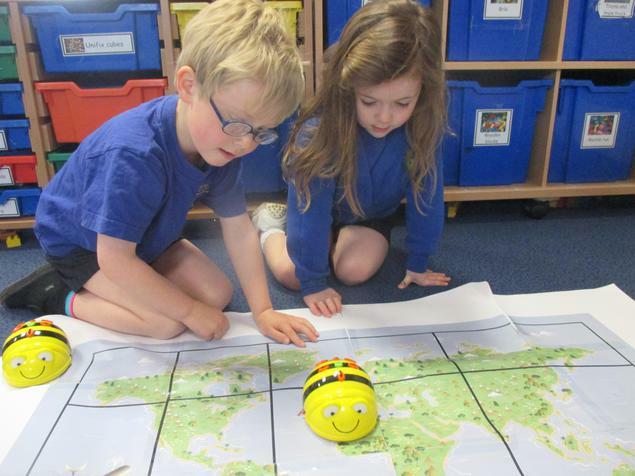 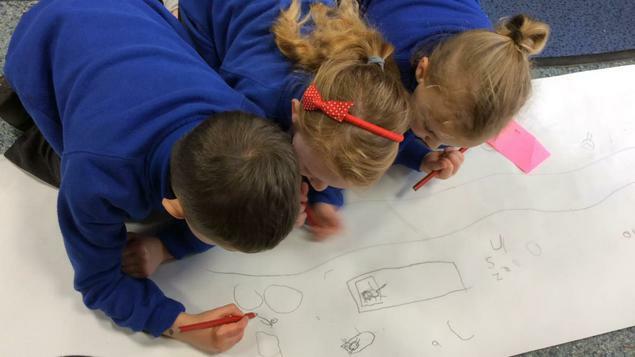 Reception will need to decide what to take, plan the route and make all the travel arrangements for our once in a lifetime, seven week whistle-stop tour of the world! 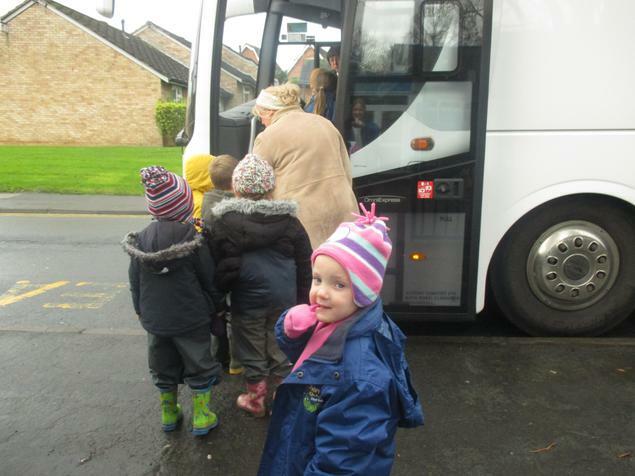 Don't forget your passport! 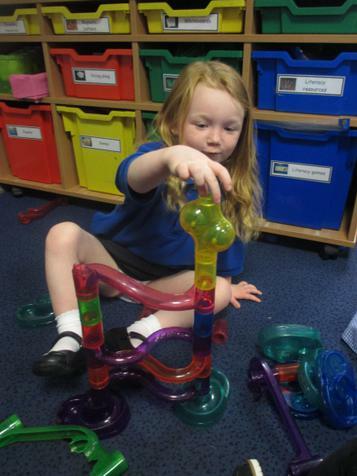 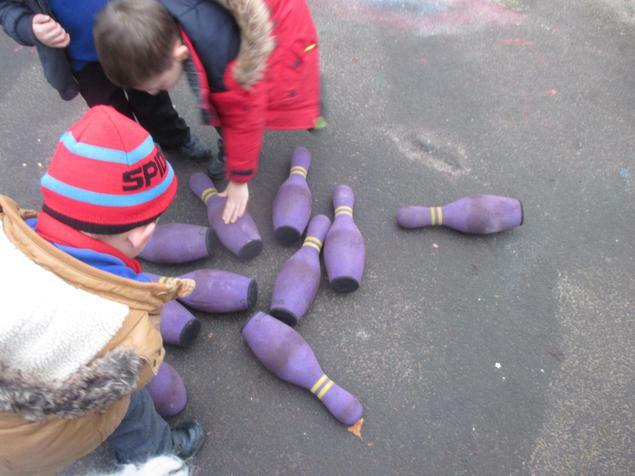 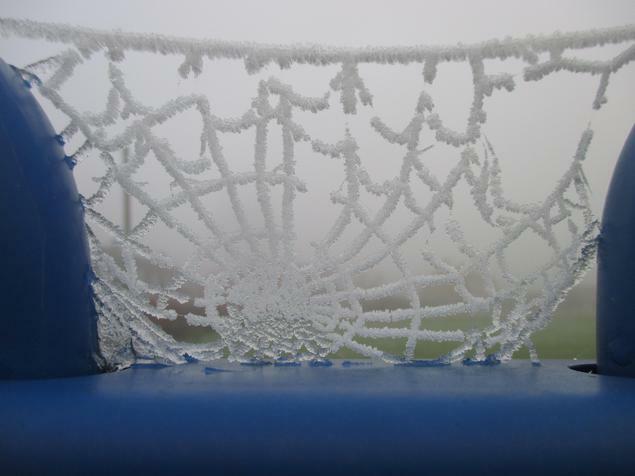 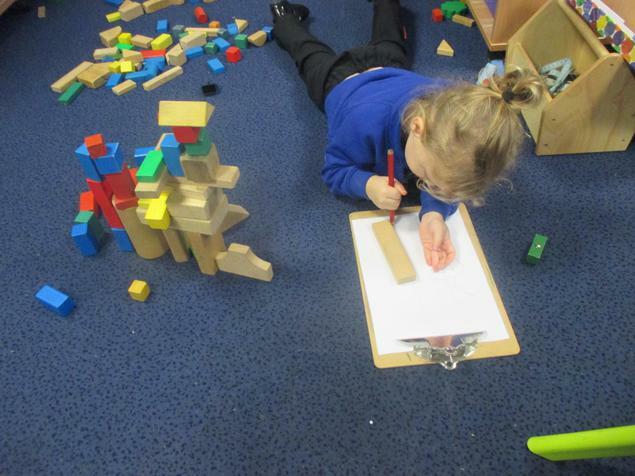 Shapes and colours, they are everywhere you look! 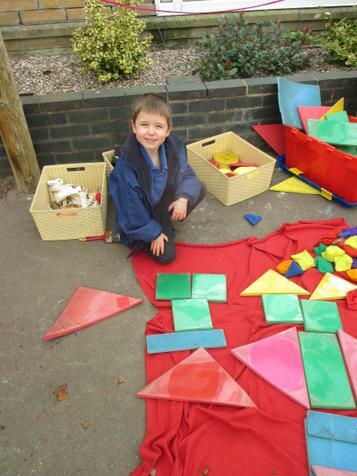 But is a shape always what it seems? 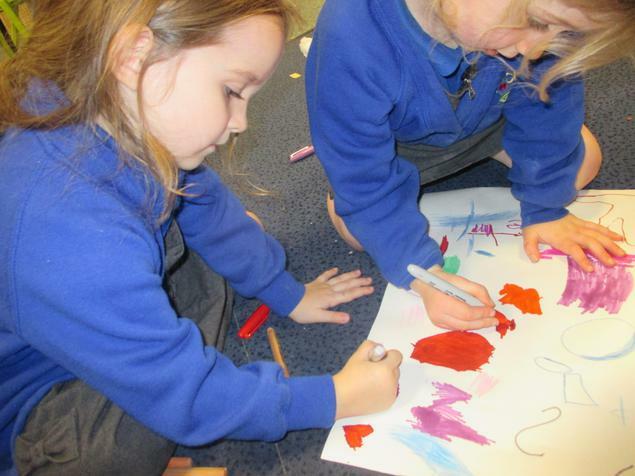 Is a colour just a colour? 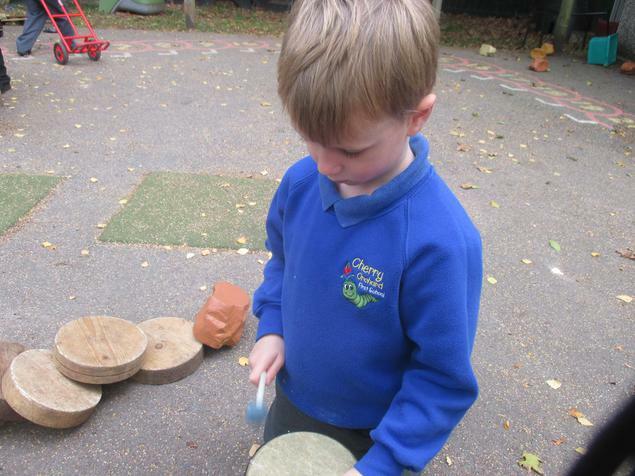 Can a shape or colour be a feeling or a musical note? 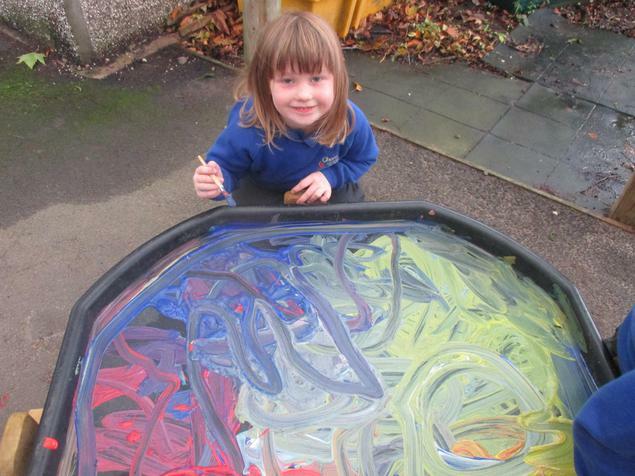 What colour is angry? 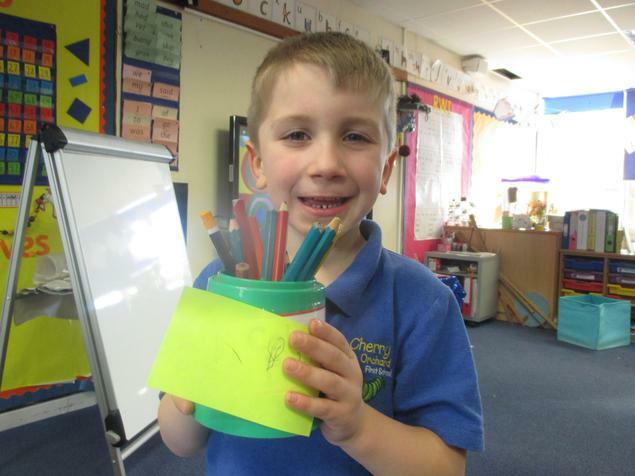 What does happy look like? 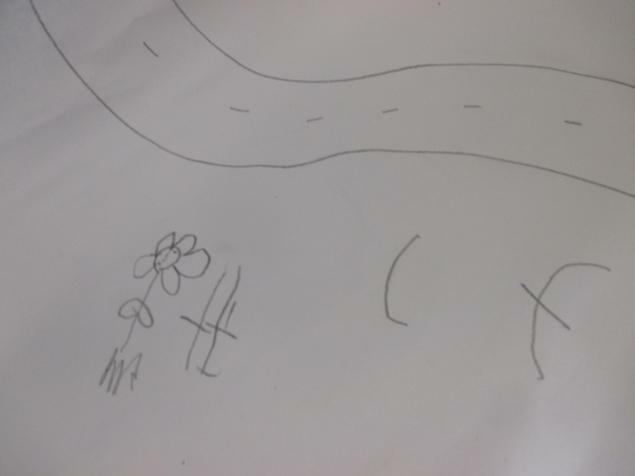 What does sad feel like? 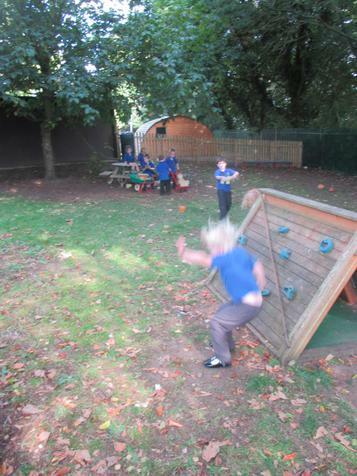 What does excited sound like? 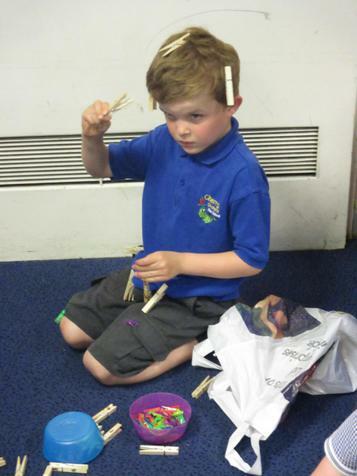 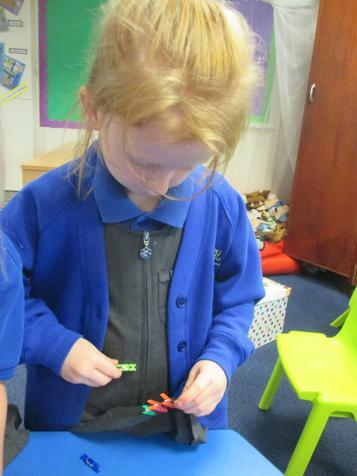 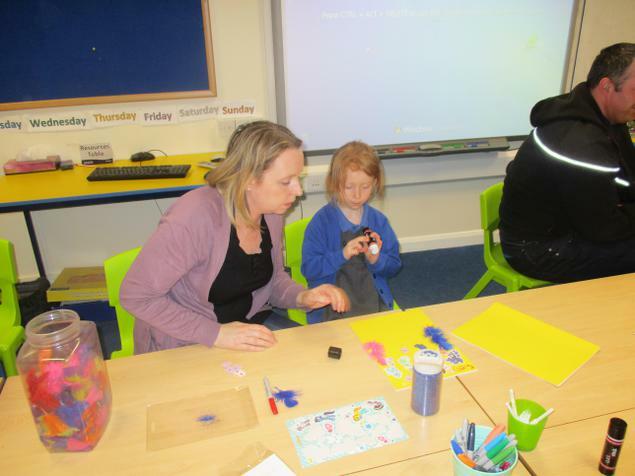 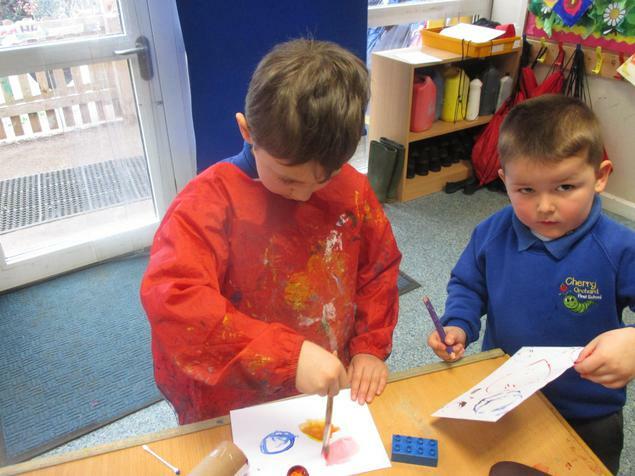 This half term Reception will have to think outside the box as we explore the abstract artwork of Kandinsky. 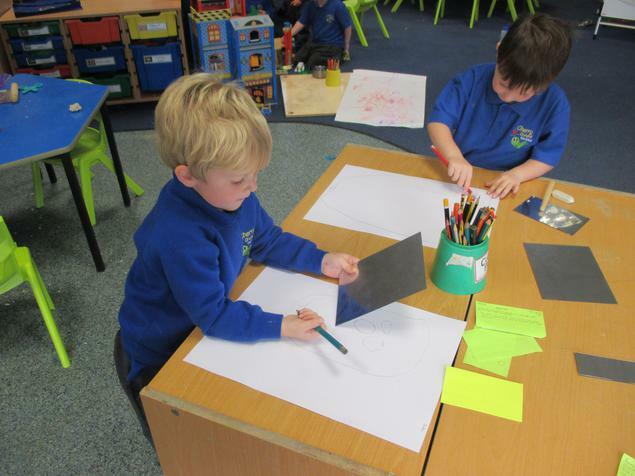 We will explore what abstract art is focusing particularly on Kandinsky’s work ‘Squares with Concentric Circles;’ as well as explore his idea of art as a means to express a visual representation of emotions and music. 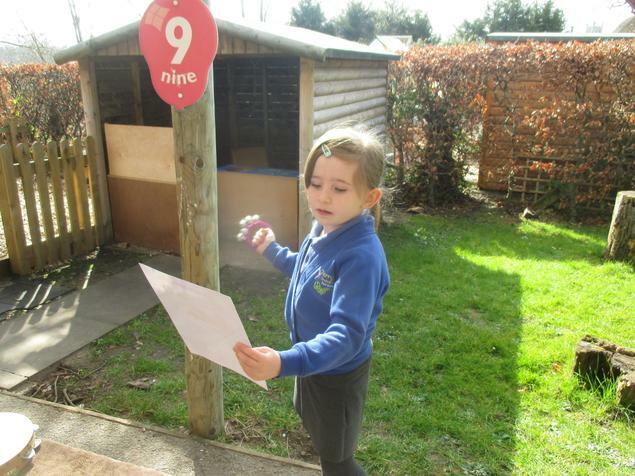 What has taken up residence in the outside area?! 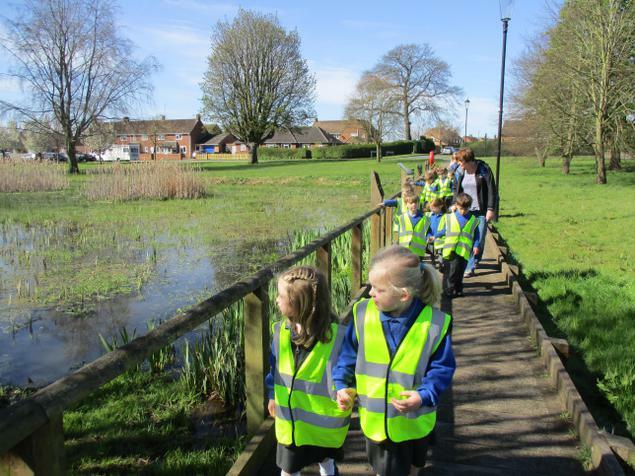 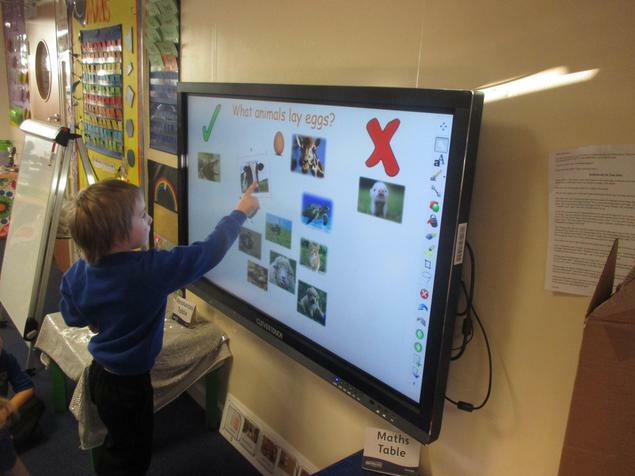 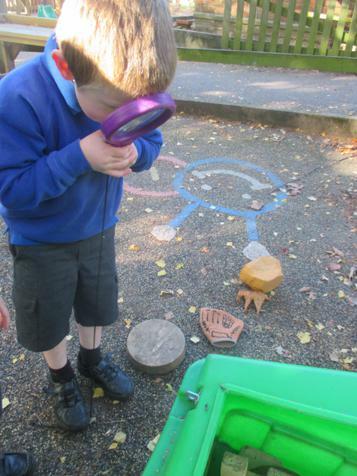 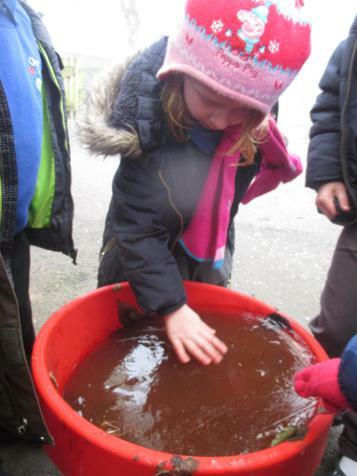 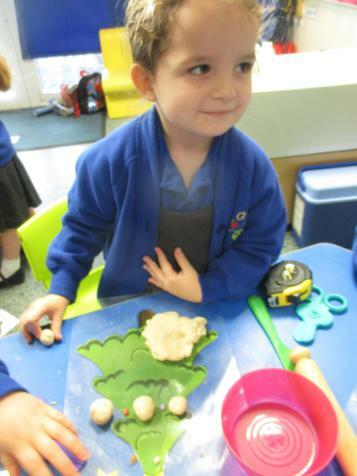 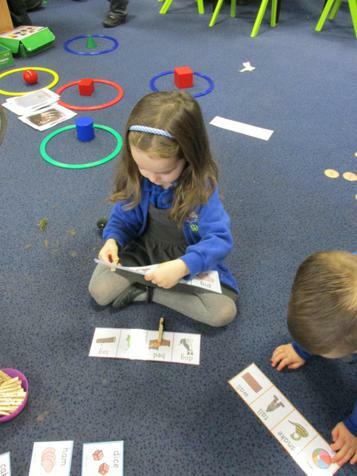 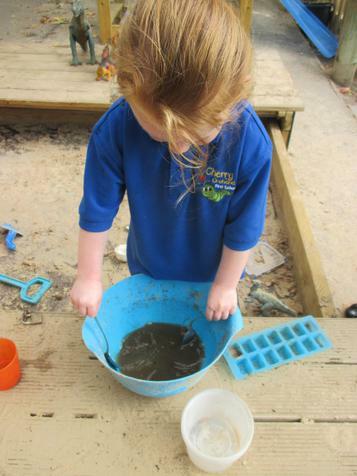 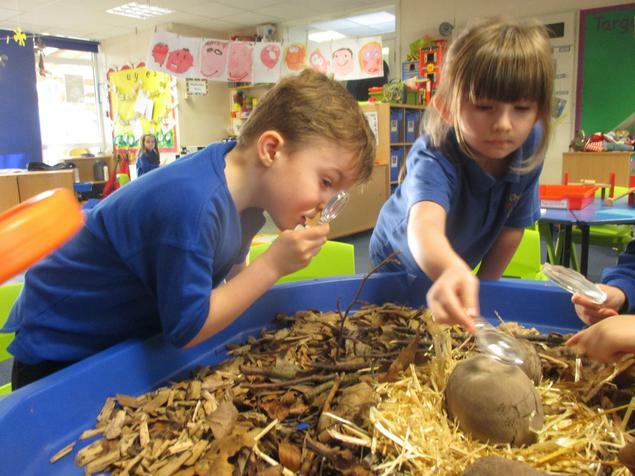 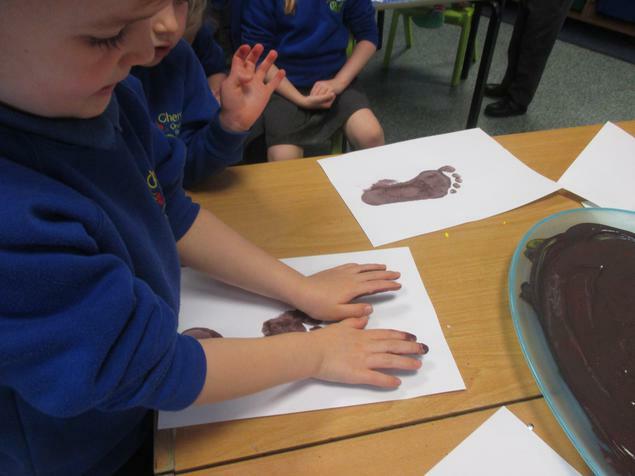 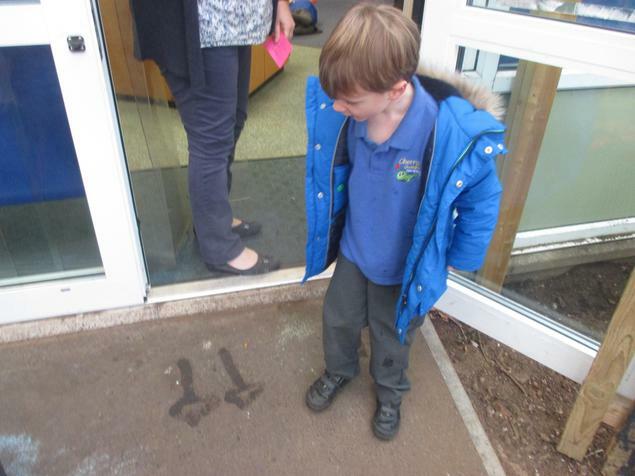 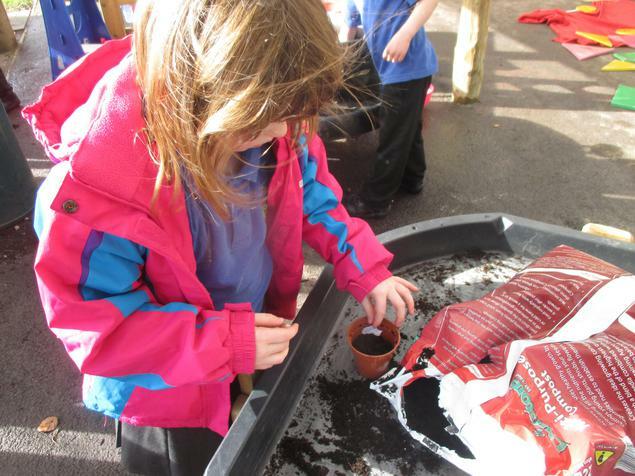 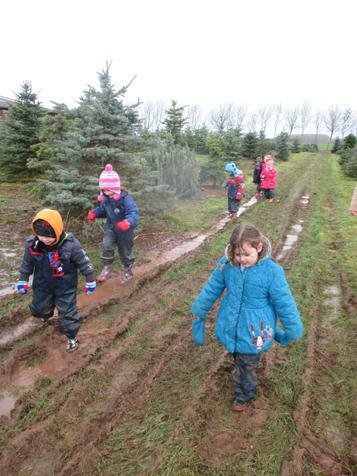 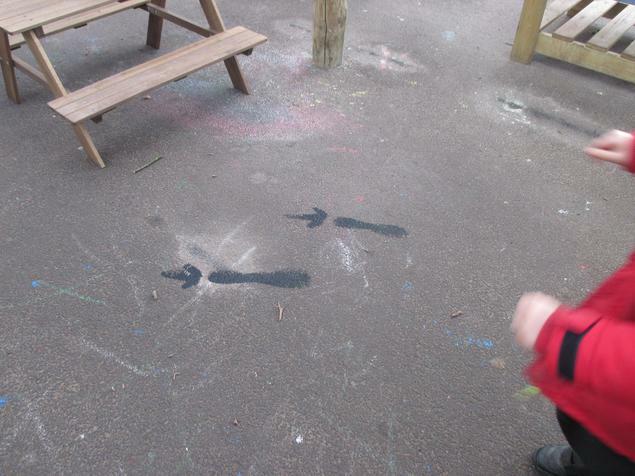 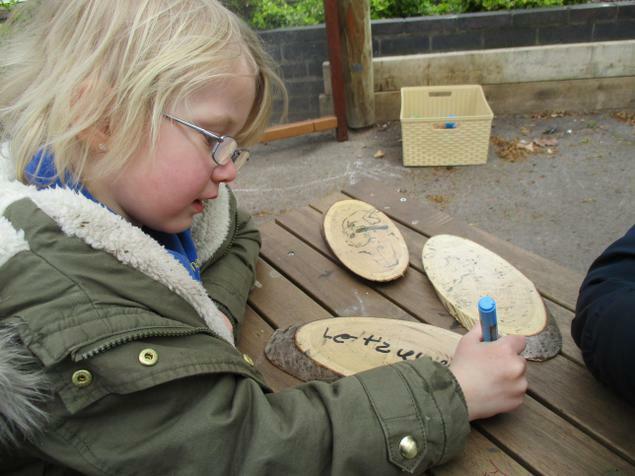 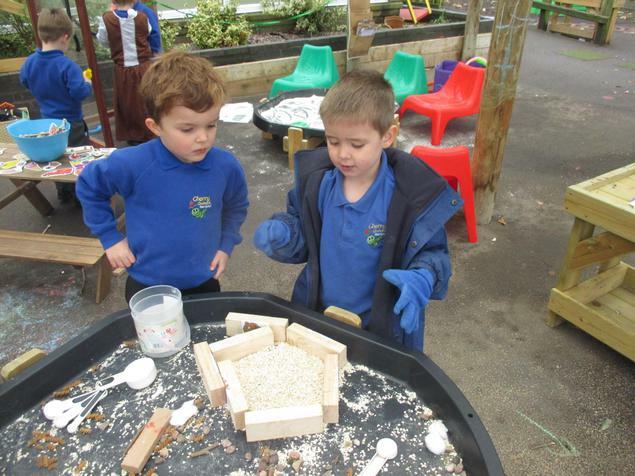 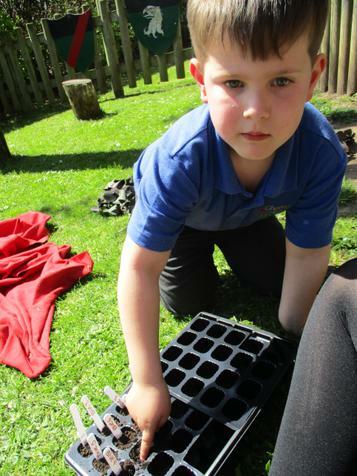 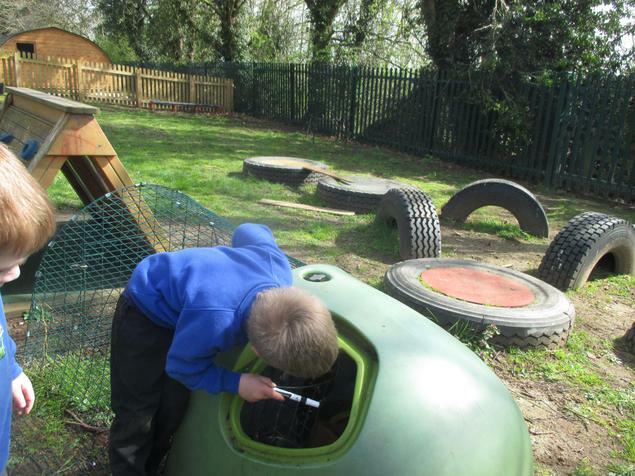 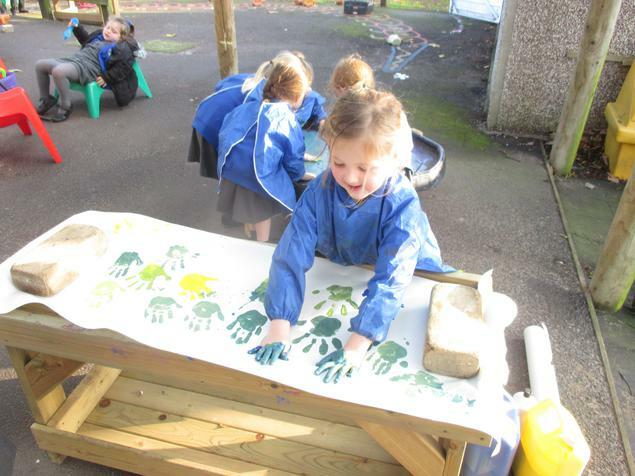 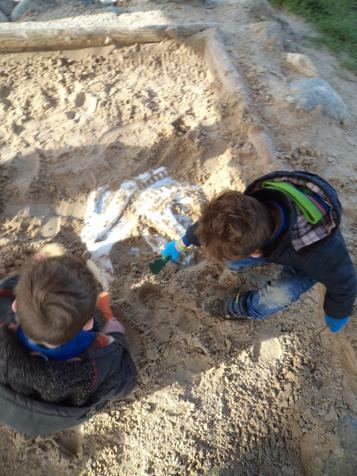 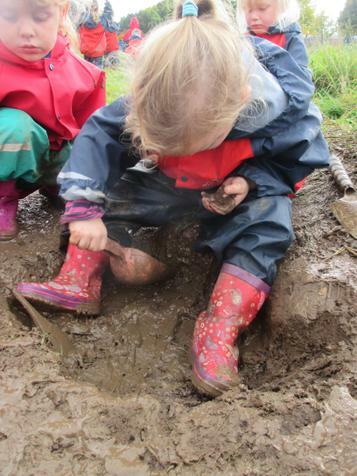 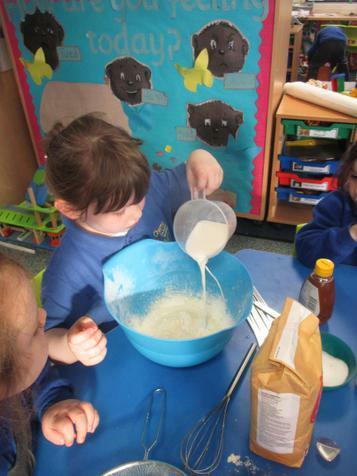 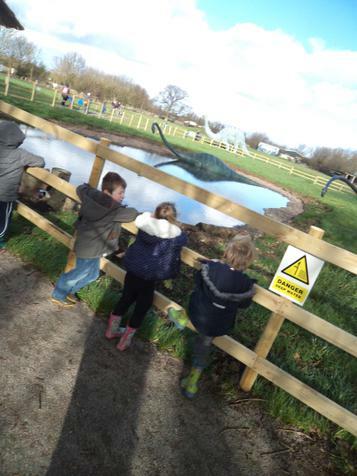 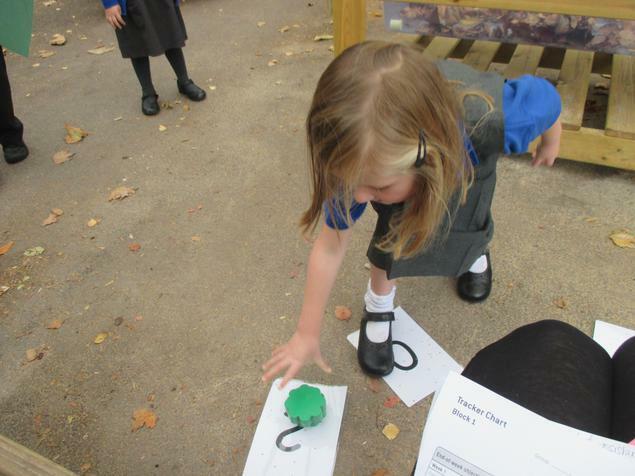 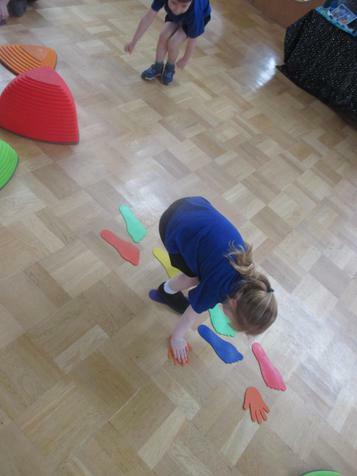 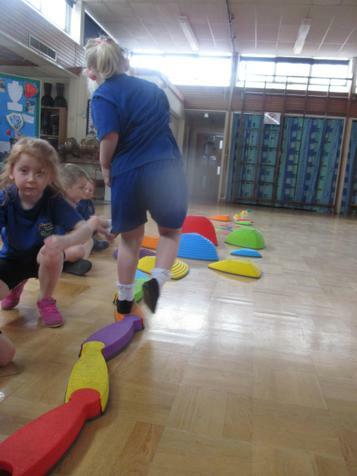 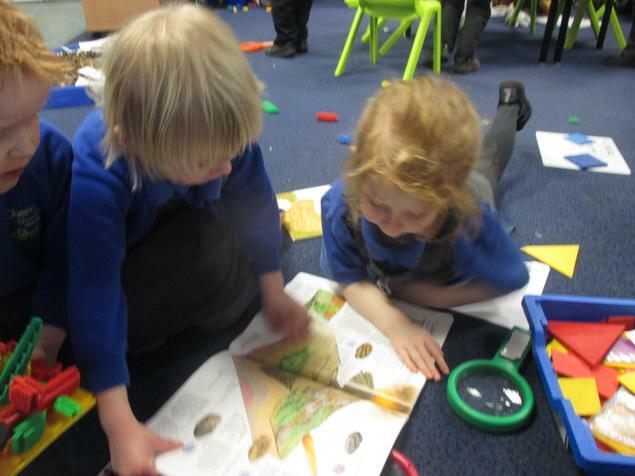 Large footprints… Huge eggs…an enormous nest are in the Forest School area… Reception are going to have to learn to be expert palaeontologists and quick! 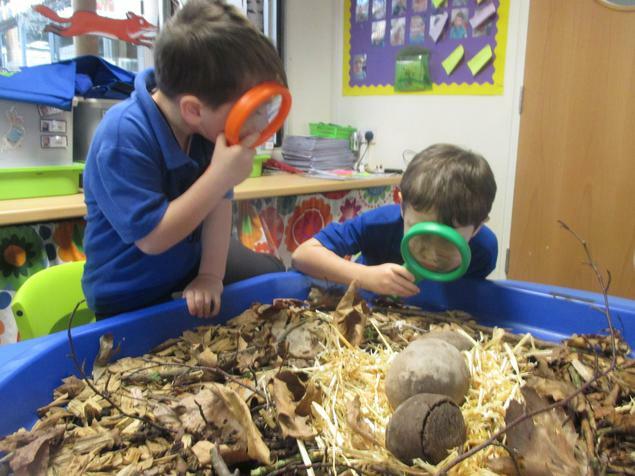 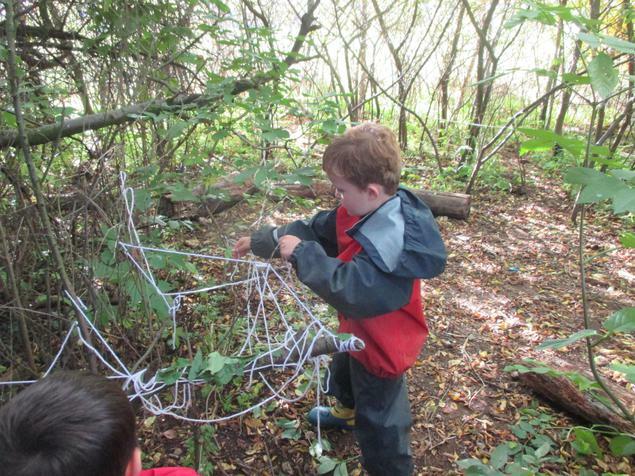 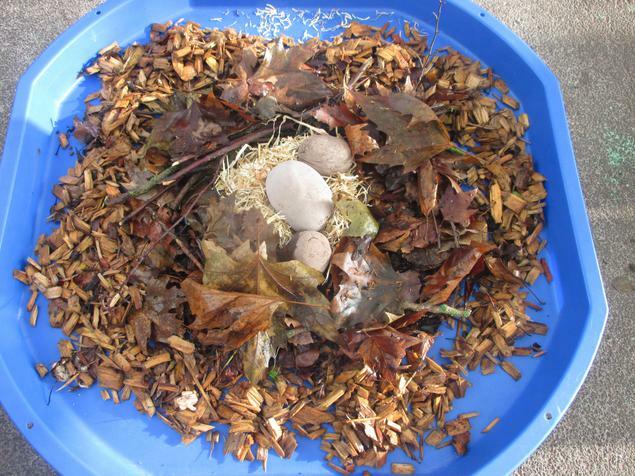 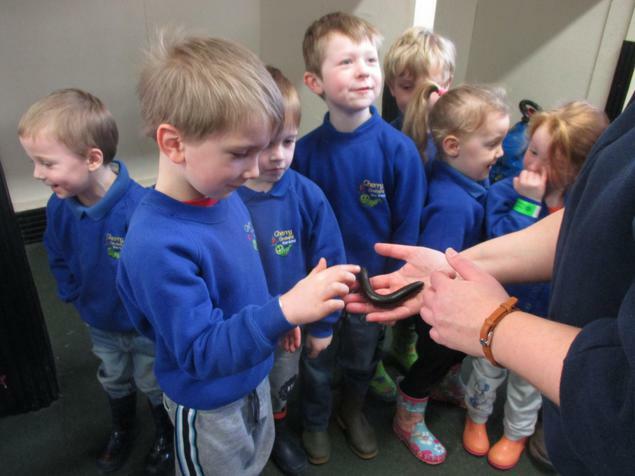 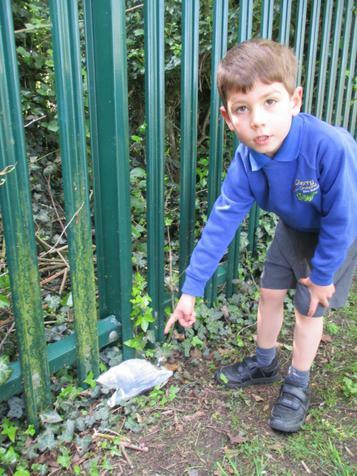 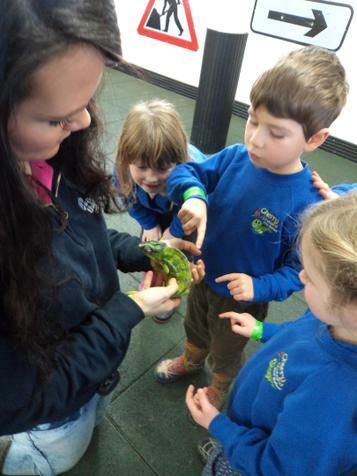 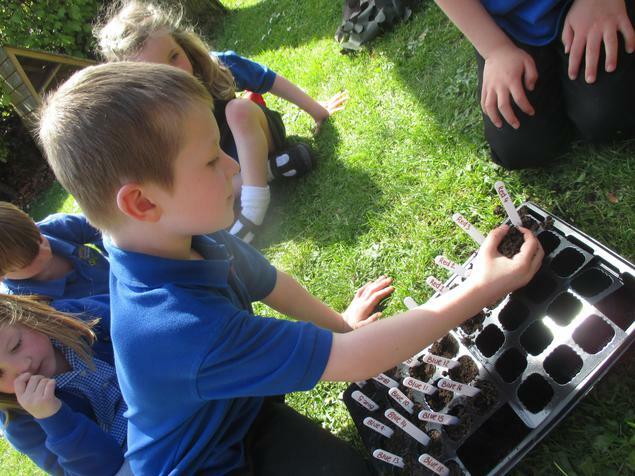 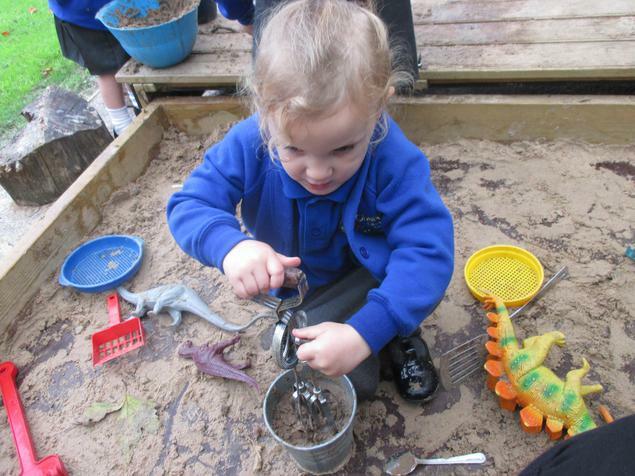 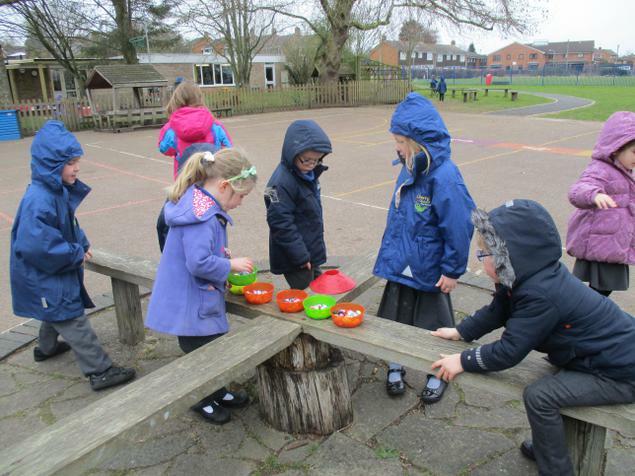 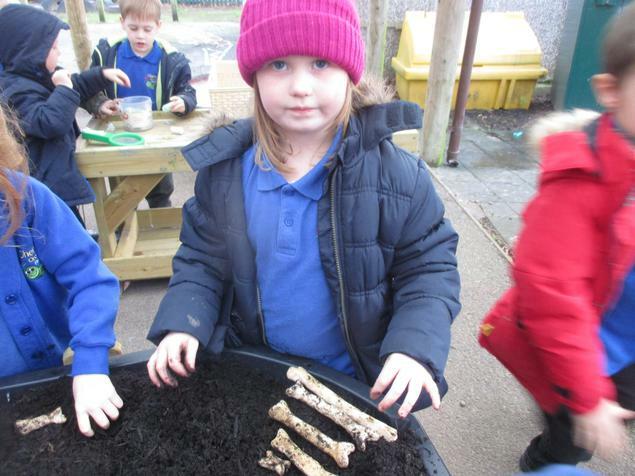 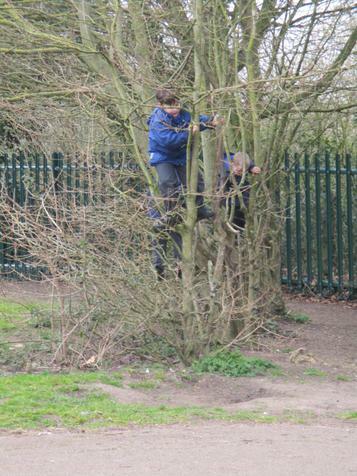 Scientists thought that dinosaurs have been extinct for millions of years but remarkably eggs ready to hatch have been uncovered in Cherry Orchard’s Forest School. 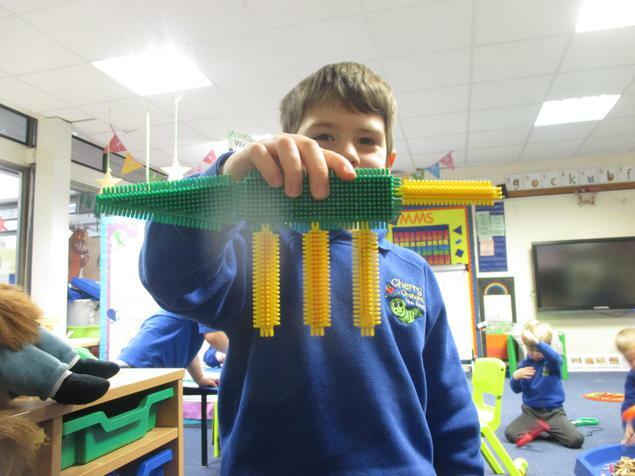 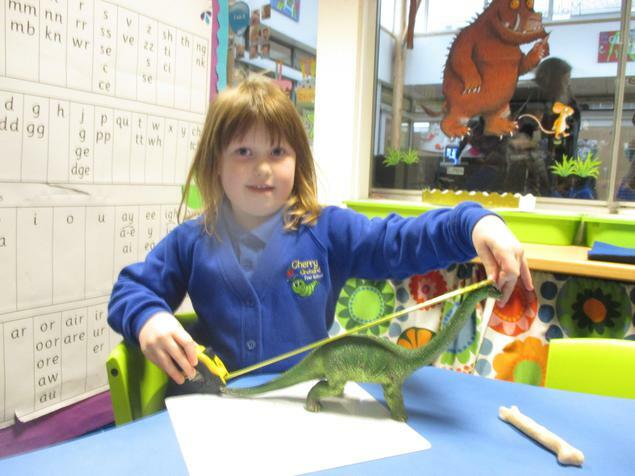 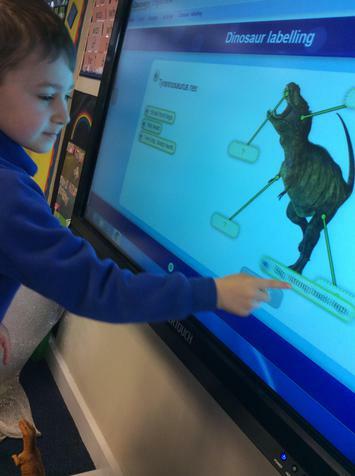 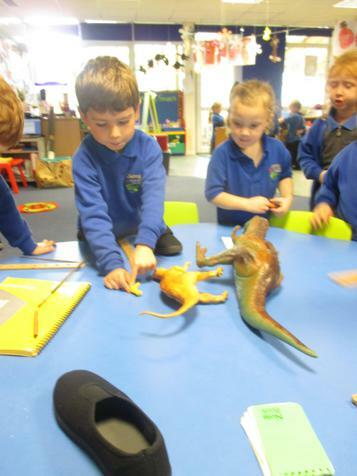 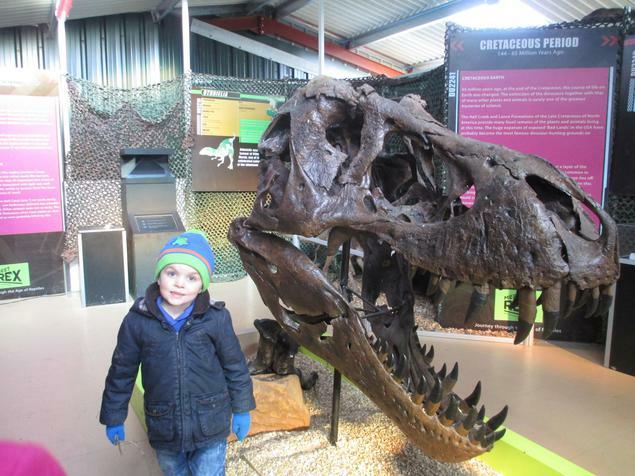 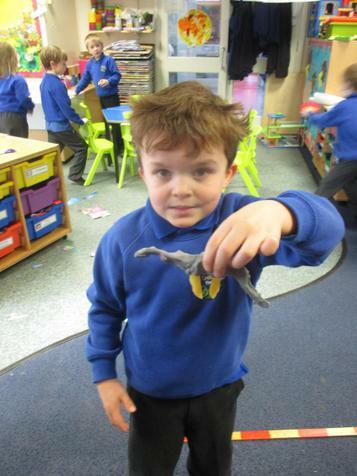 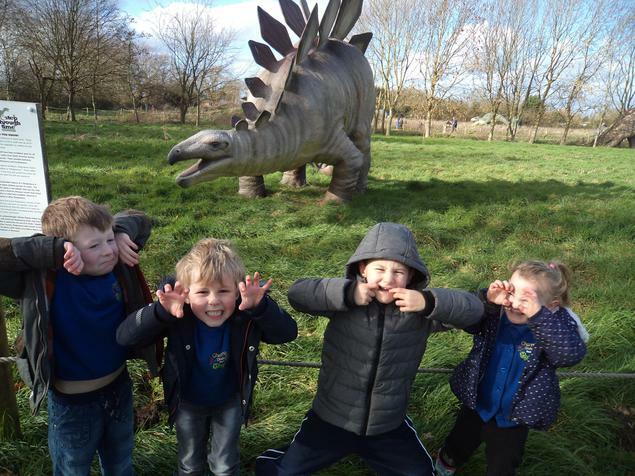 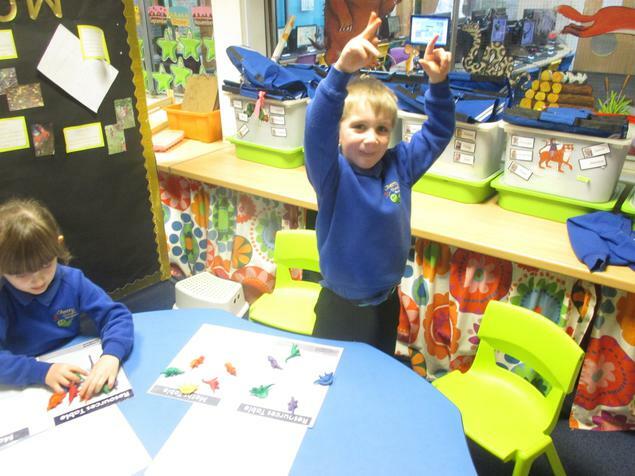 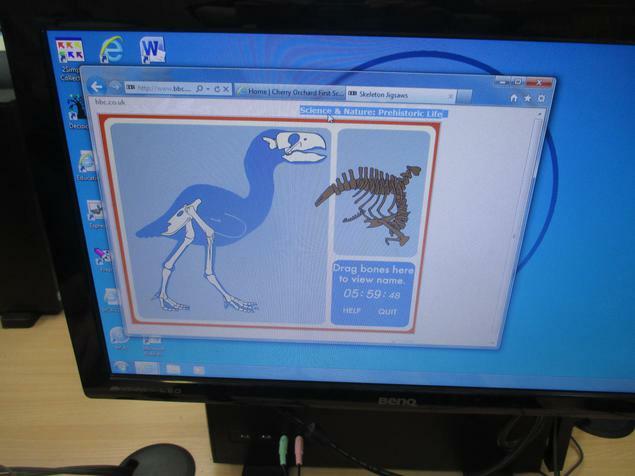 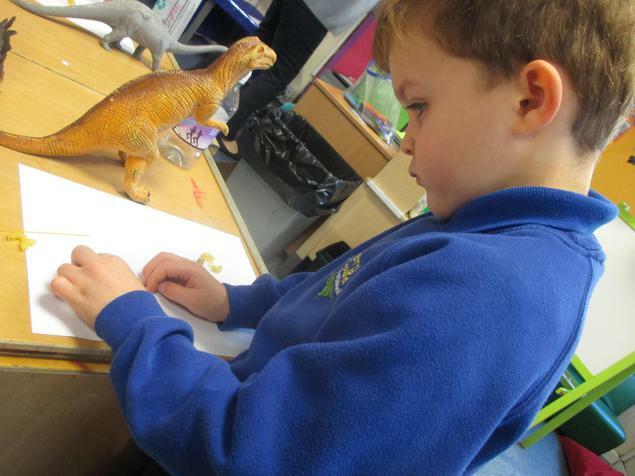 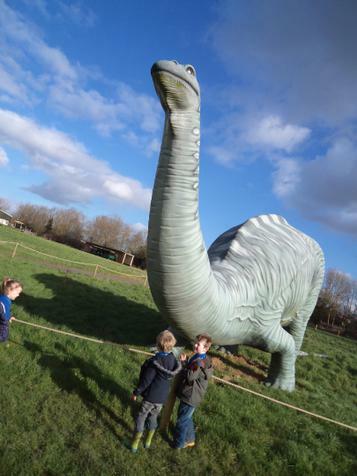 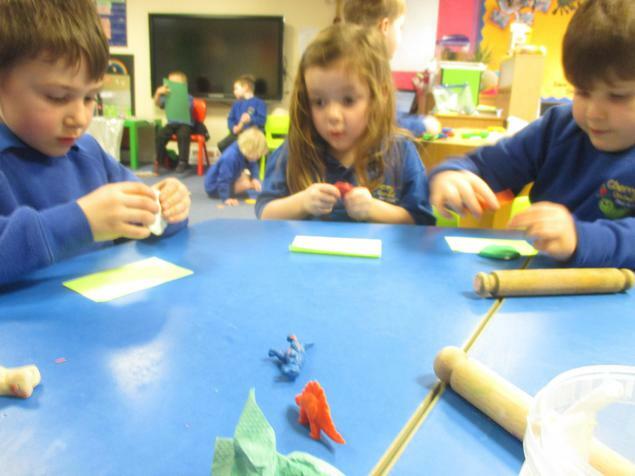 They are going to have to research and learn about the features of different dinosaurs, find out what dinosaurs eat, how big they get and what their natural habitat is like in order for us to make history and produce the first example of a dinosaur that’s alive in living memory! 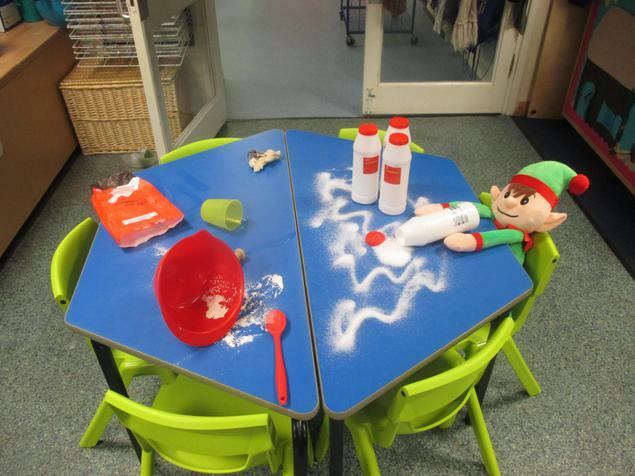 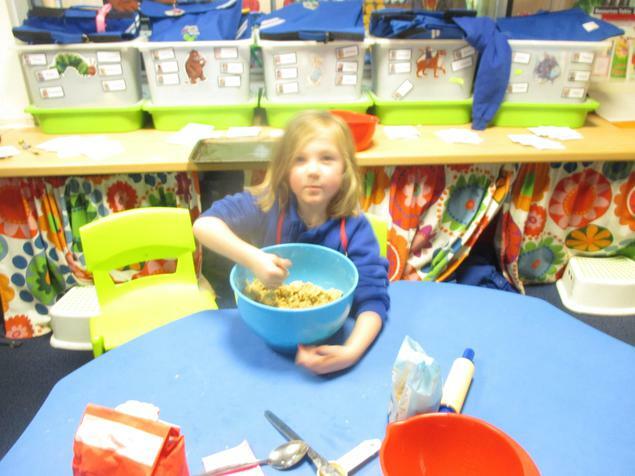 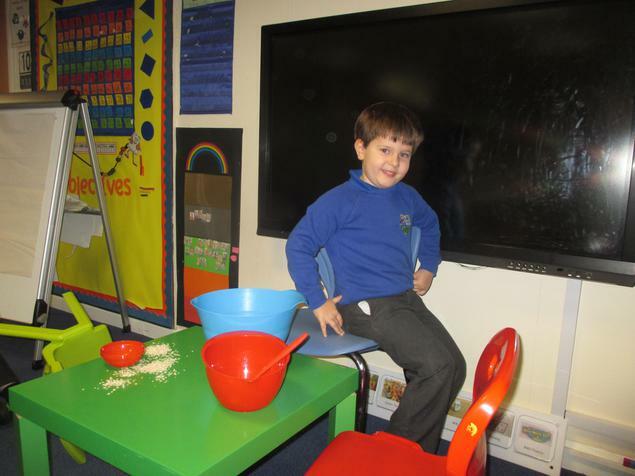 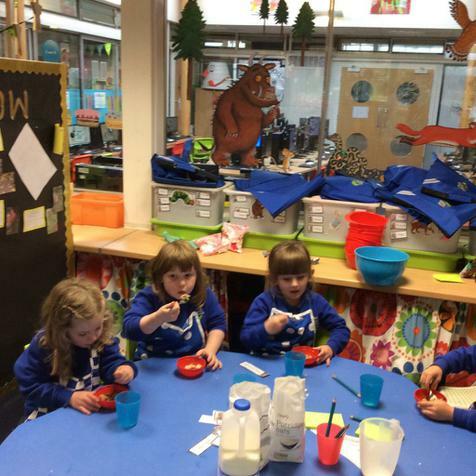 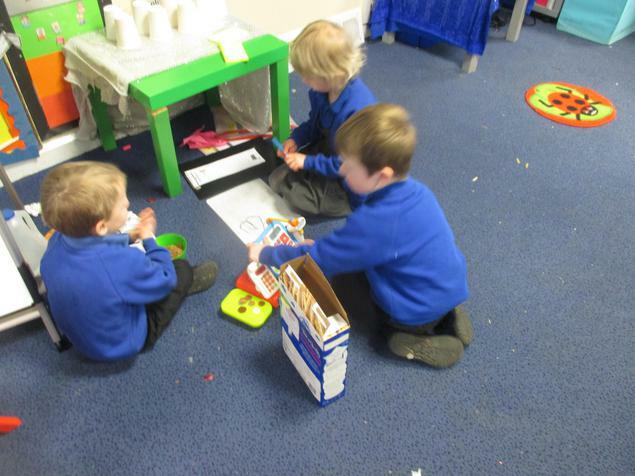 A broken chair in the role play area... Porridge everywhere... Who has been playing in our role play area?! 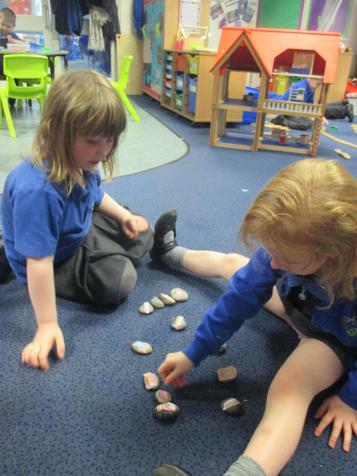 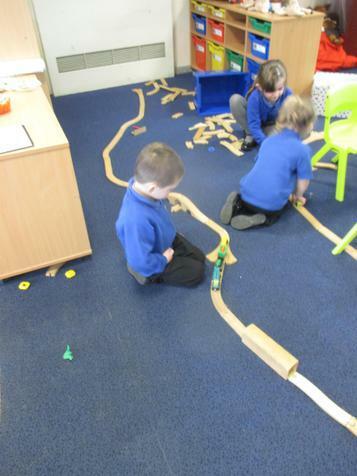 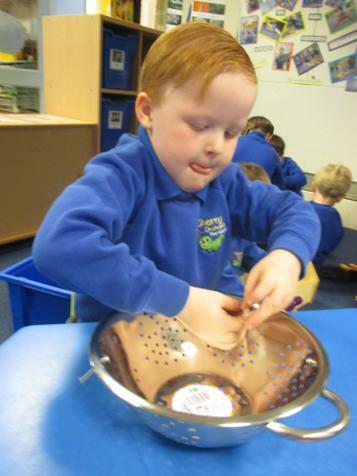 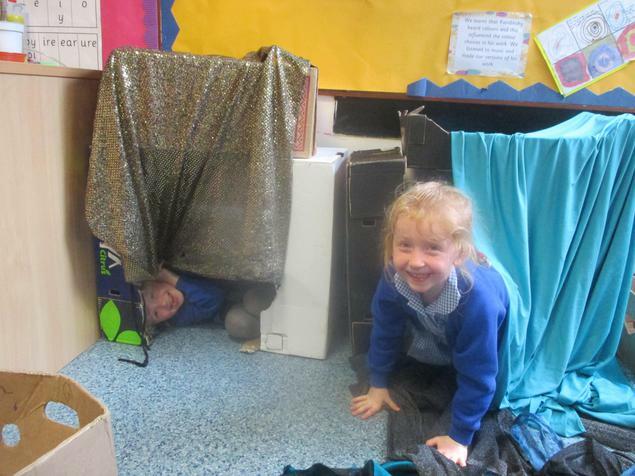 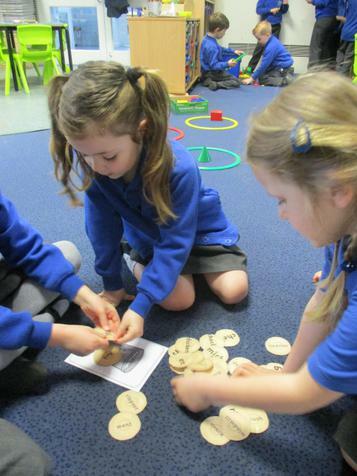 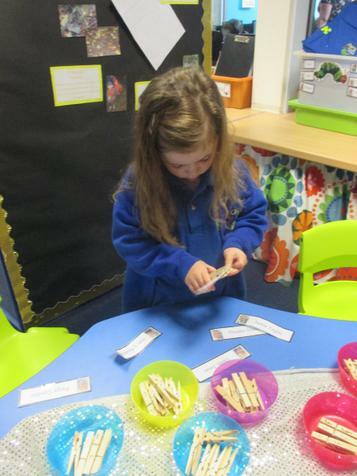 After investigating the clues left in our classroom Reception will explore the traditional tale of Goldilocks and the Three Bears, as well as what happens after she runs away! 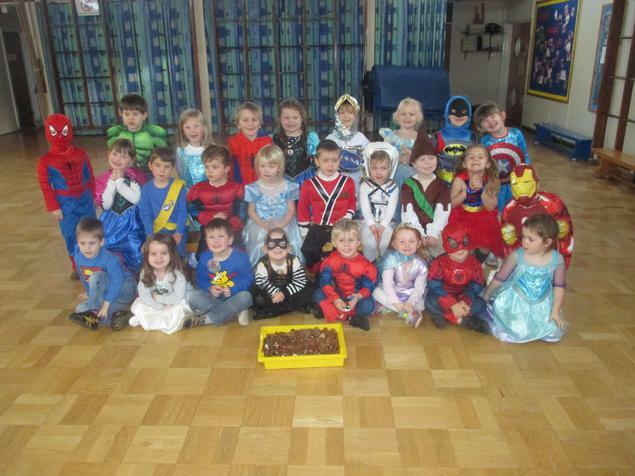 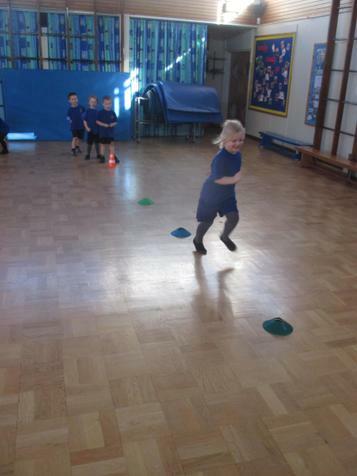 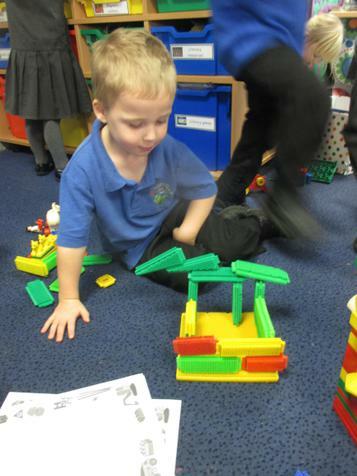 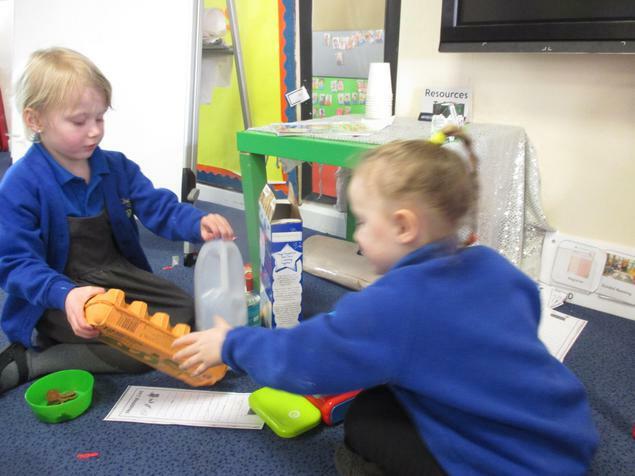 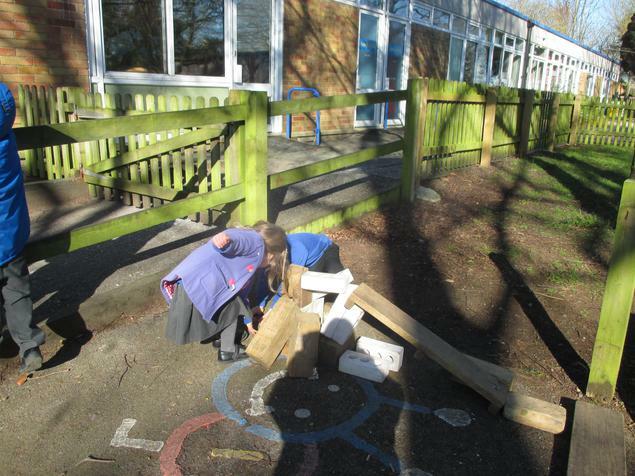 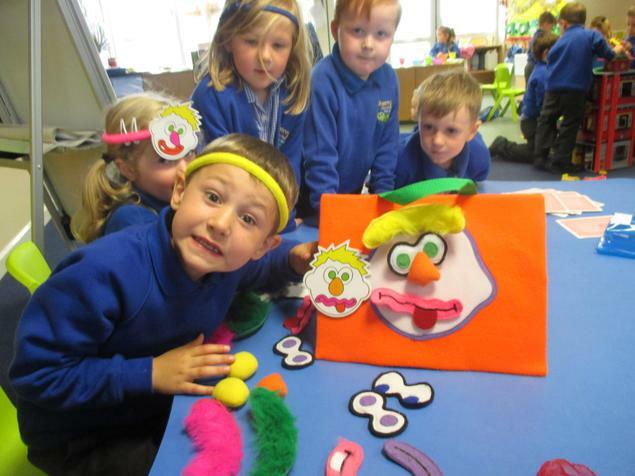 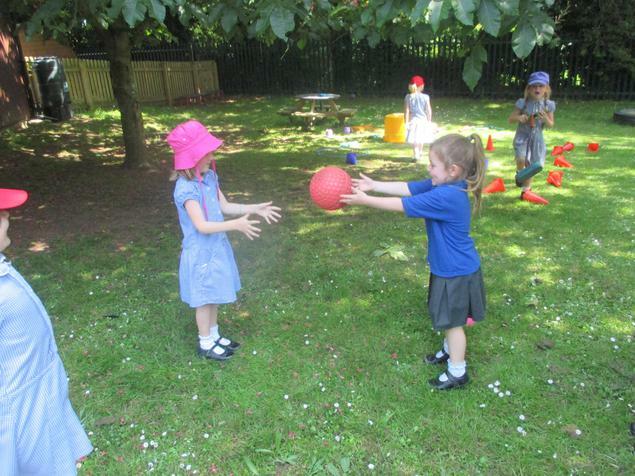 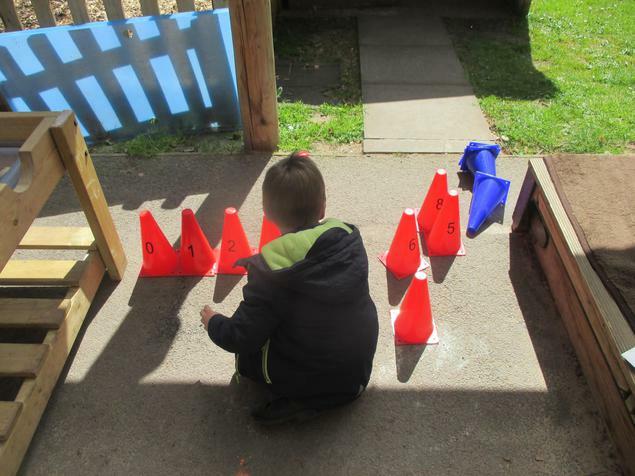 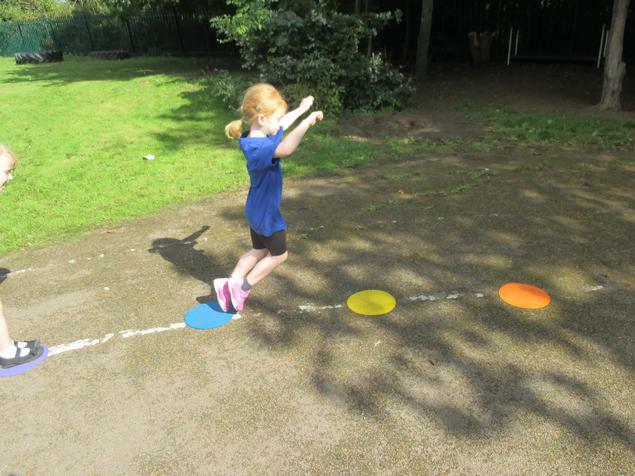 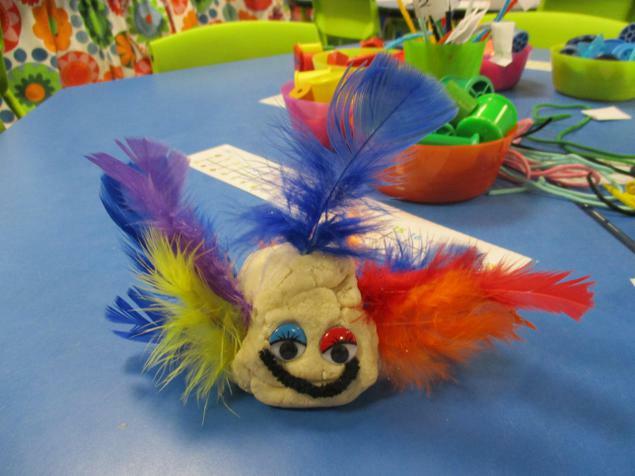 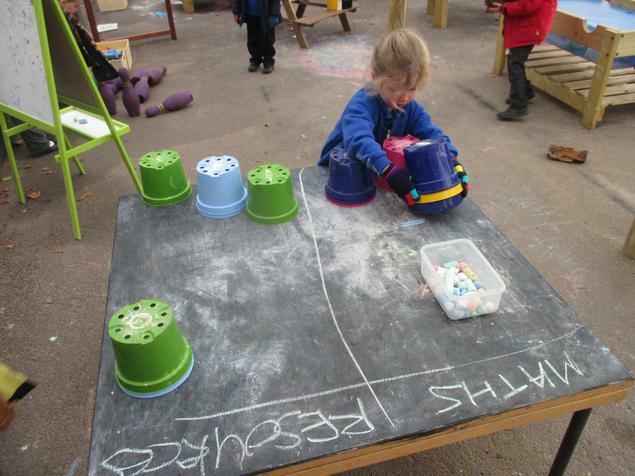 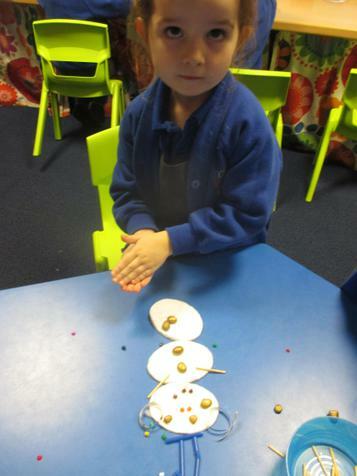 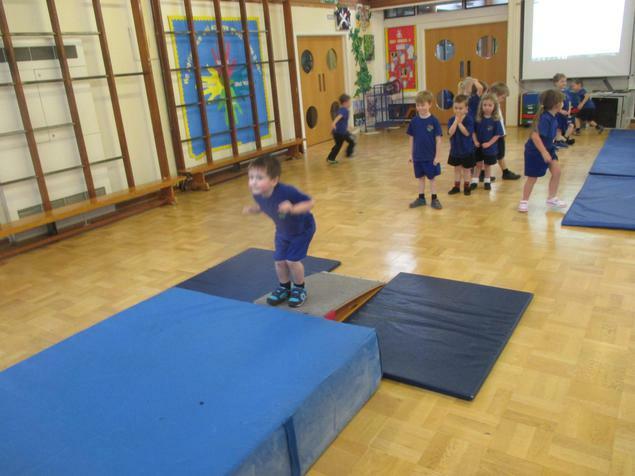 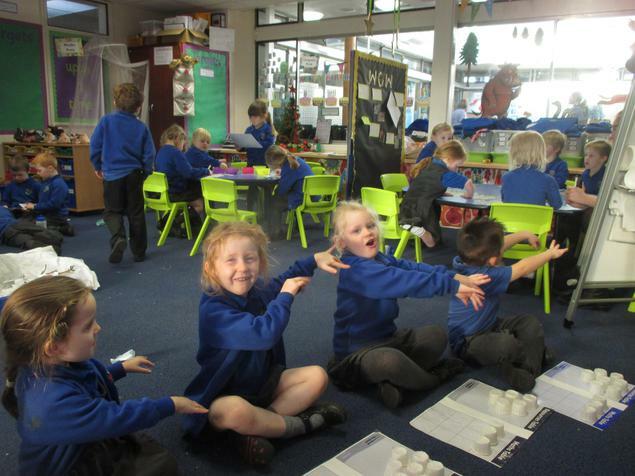 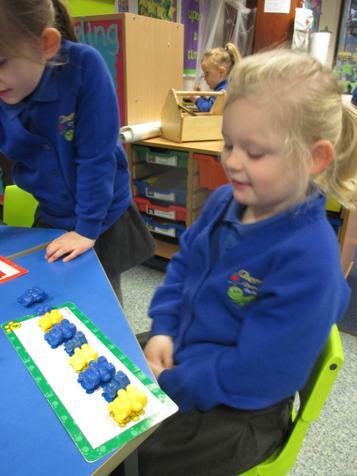 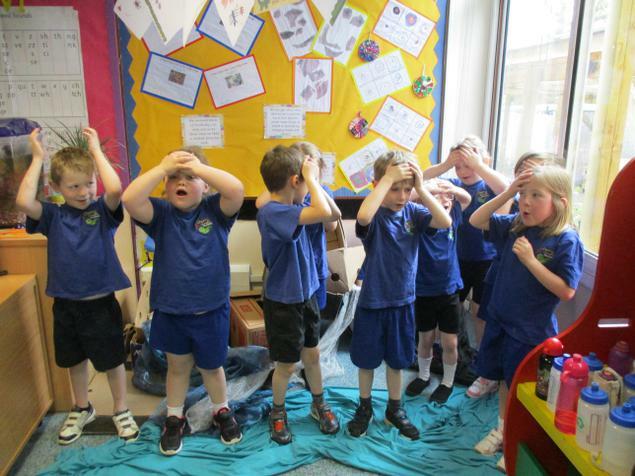 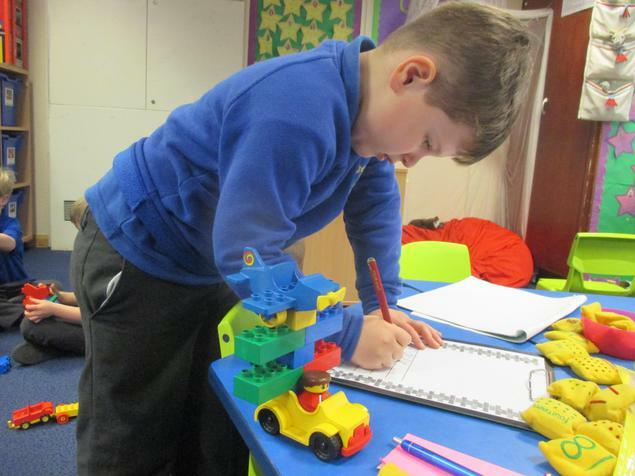 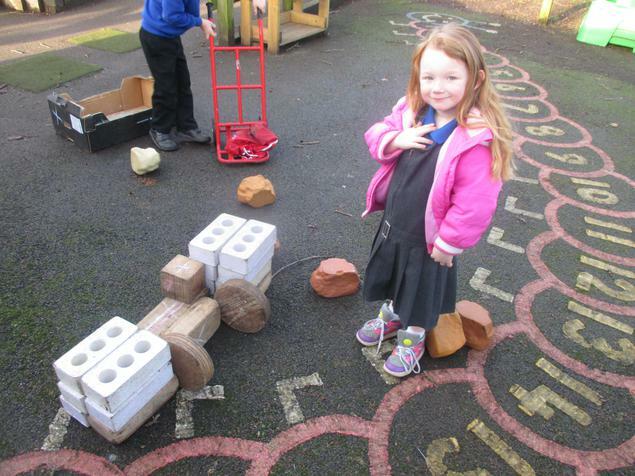 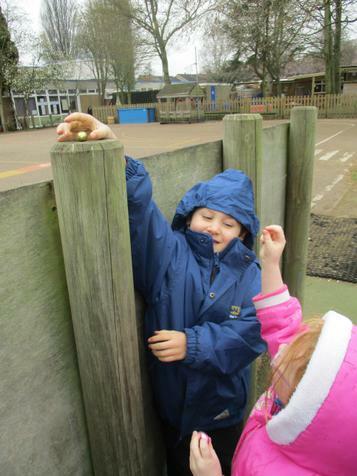 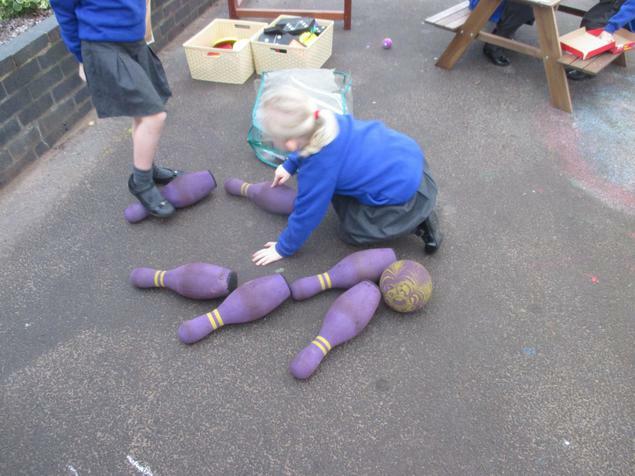 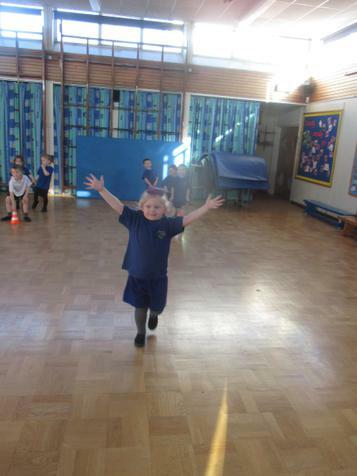 Humpty Dumpty sat on a wall... can Reception save him from a great fall? 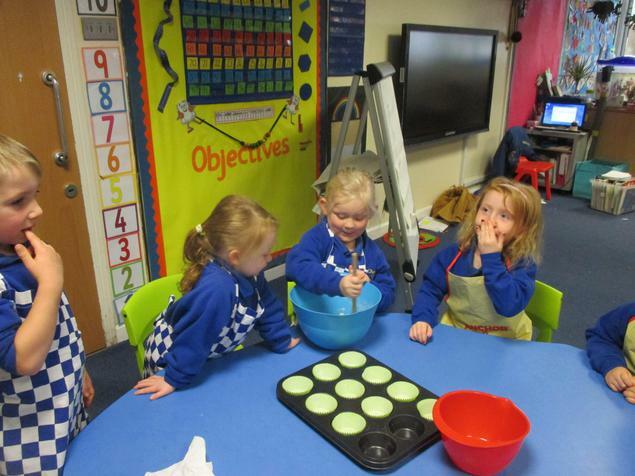 Pat-a-cake, pat-a-cake baker's man... can Reception bake a cake faster than you can? 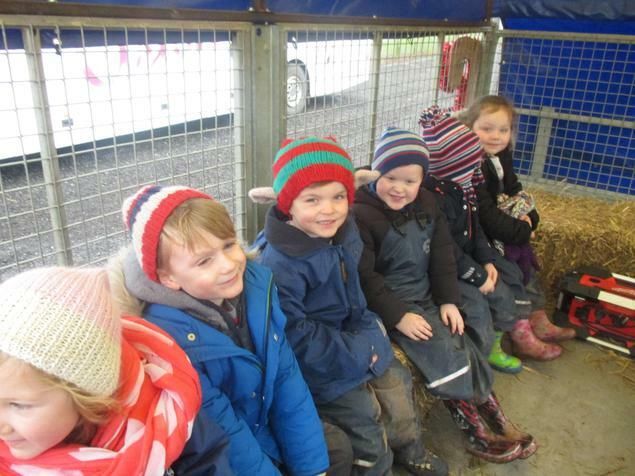 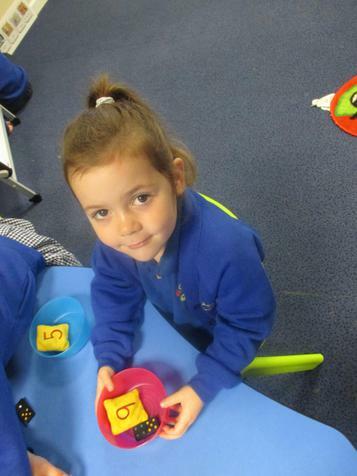 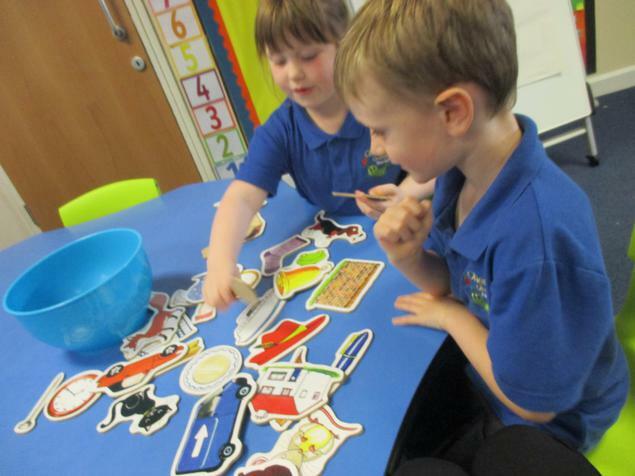 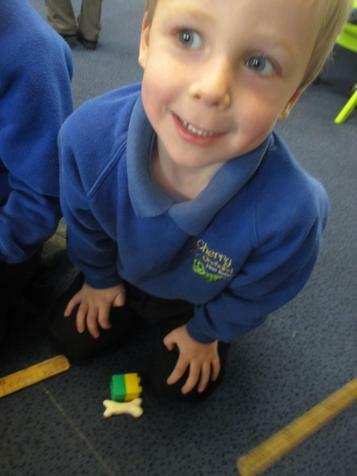 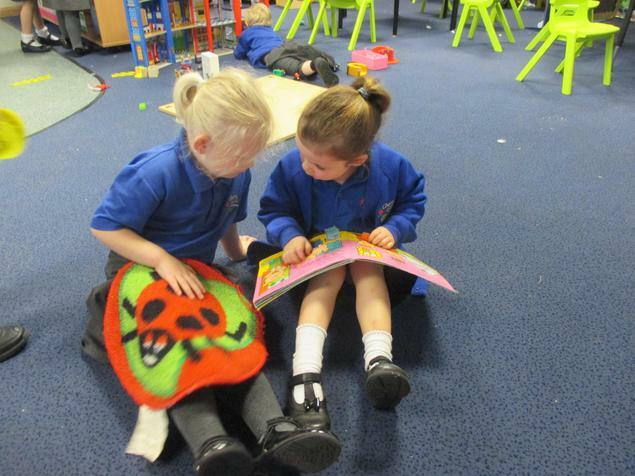 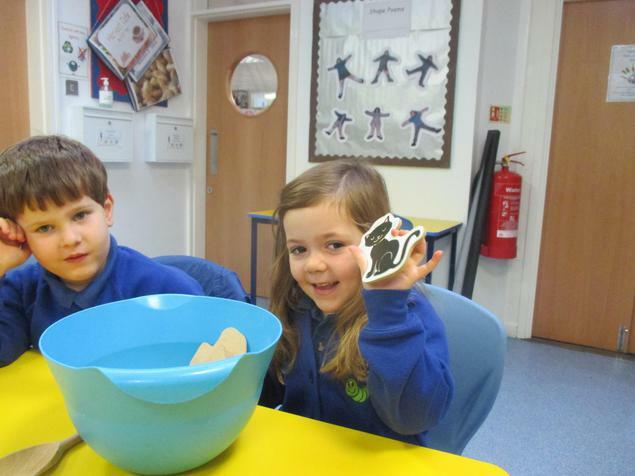 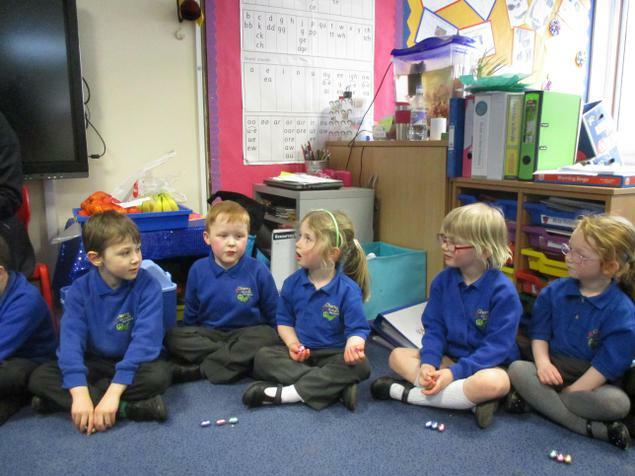 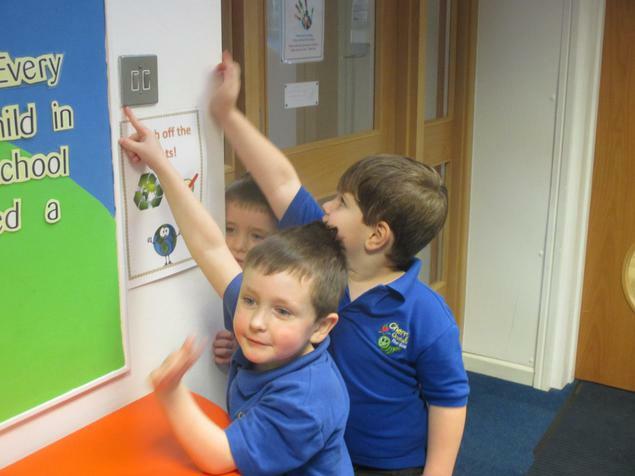 After settling into school life and getting to know our new friends and grown-ups Reception had lots of fun exploring nursery rhymes. 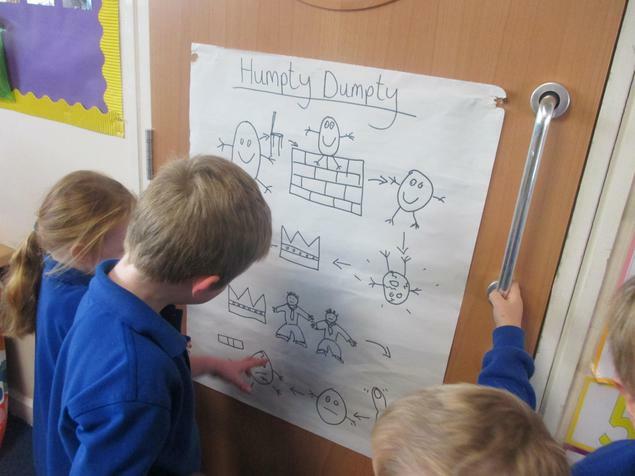 We made a text map to help us remember the rhyme of Humpty Dumpty. 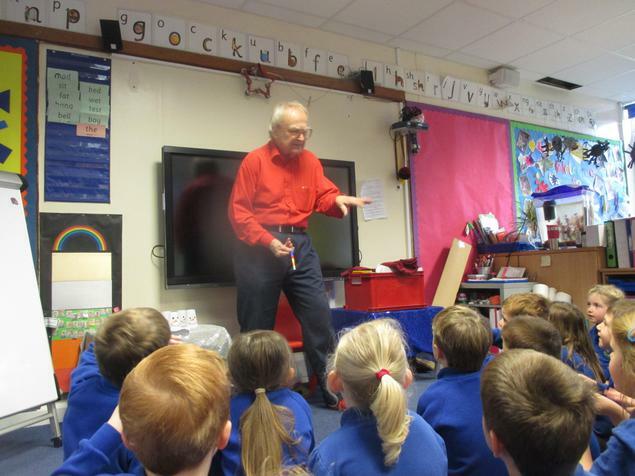 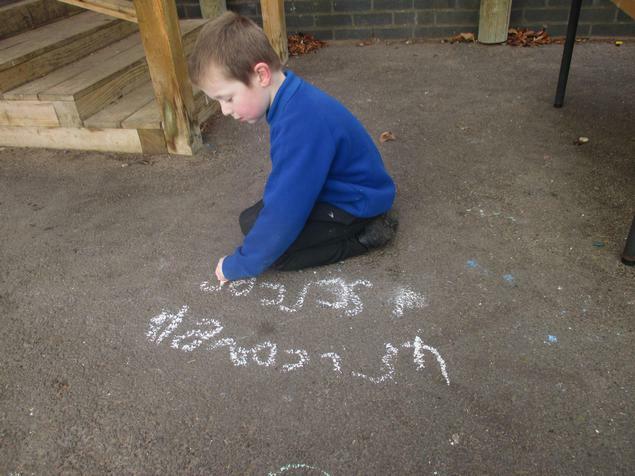 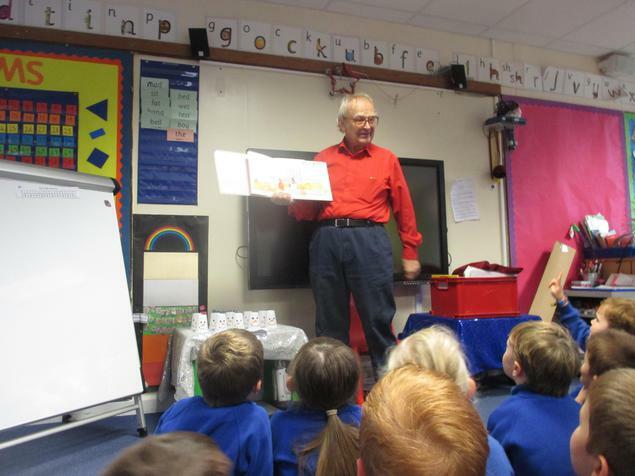 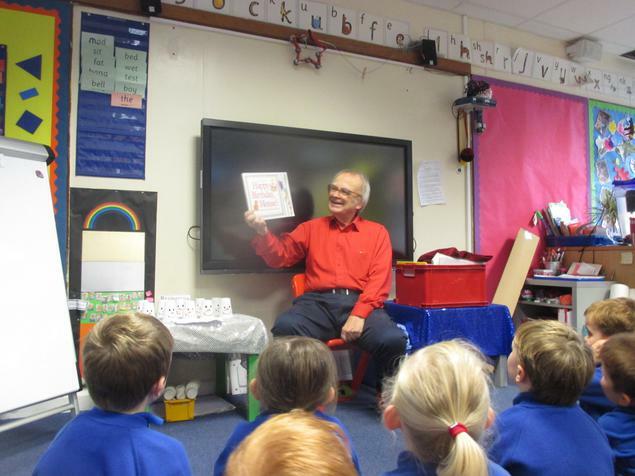 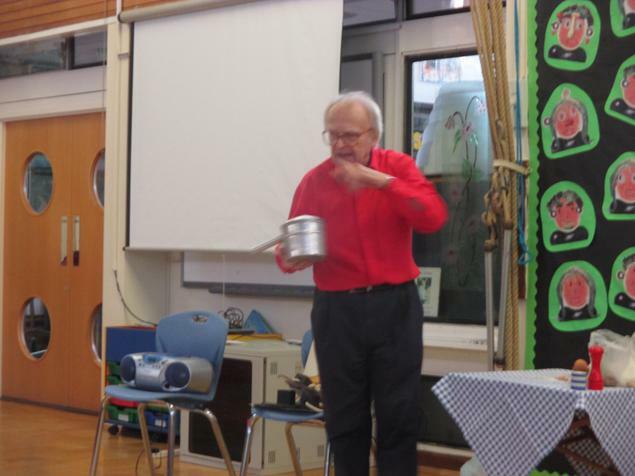 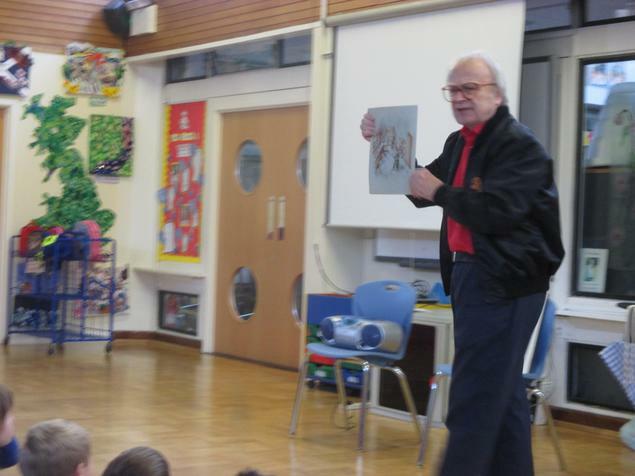 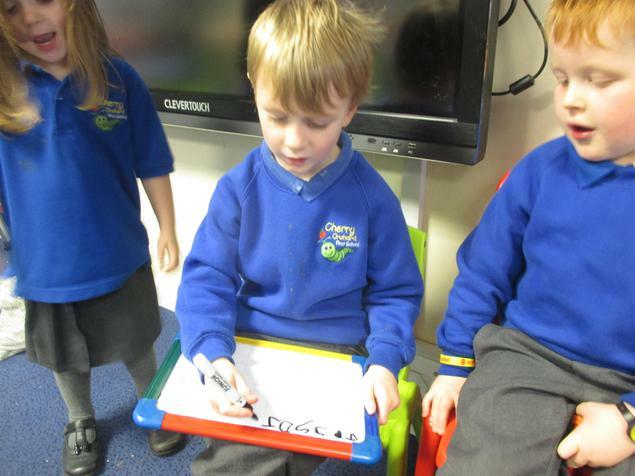 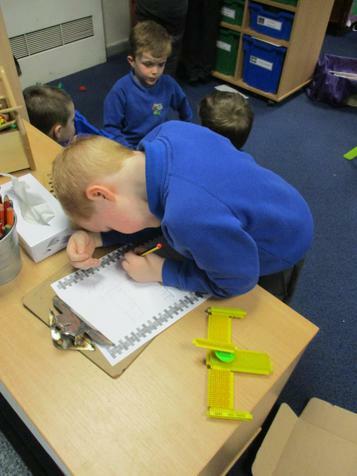 We thought about how he might have felt at different parts of the rhyme. 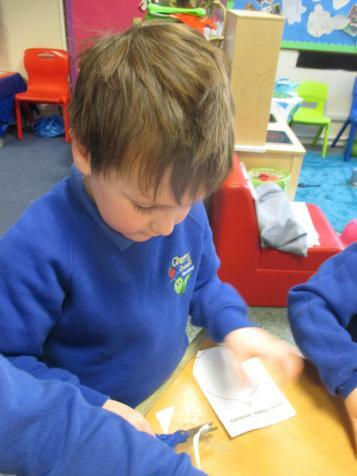 We made him get well soon cards and we tried to make him some protective clothing to stop him from hurting himself again. 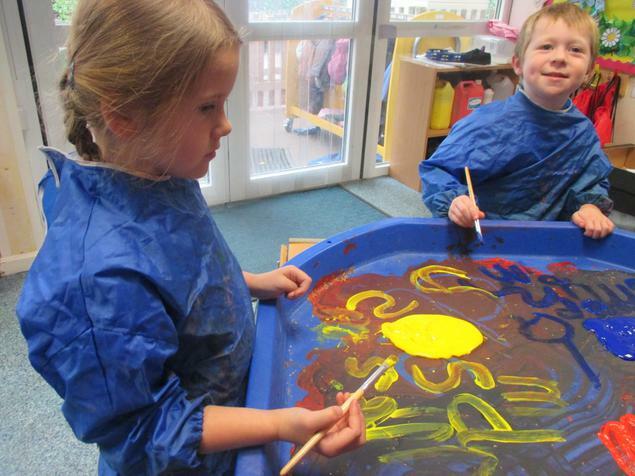 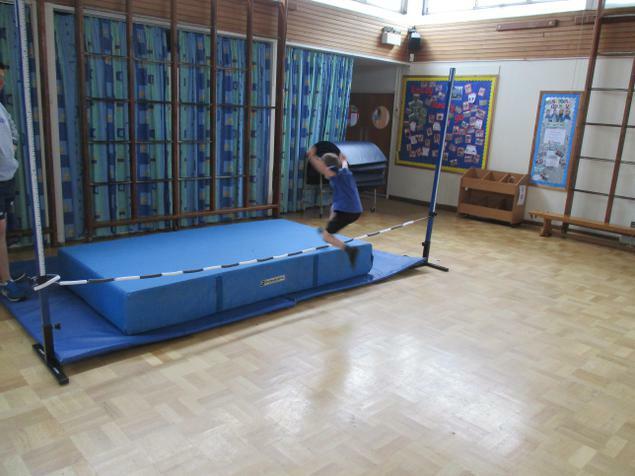 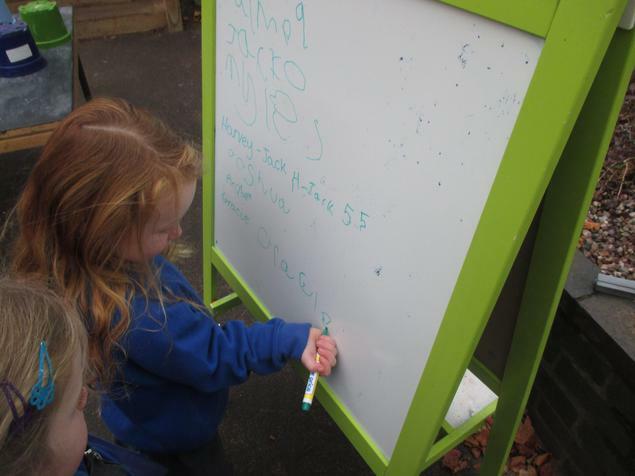 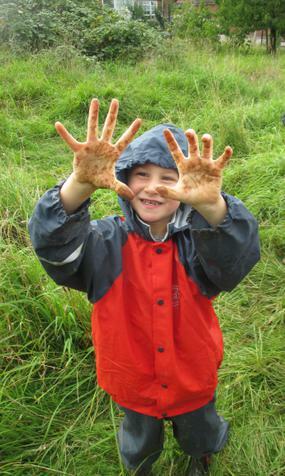 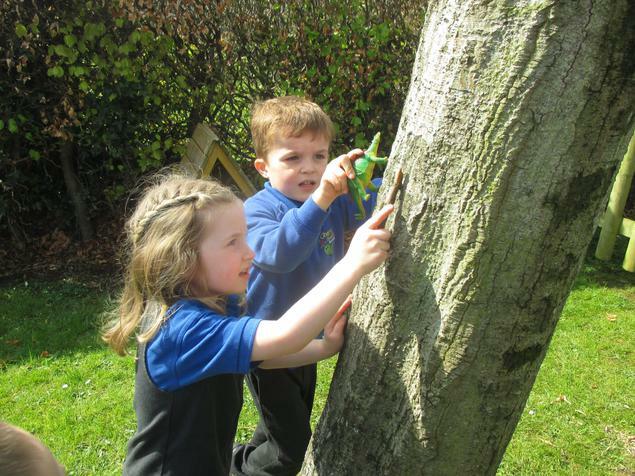 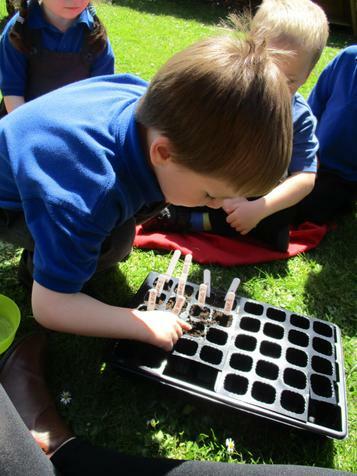 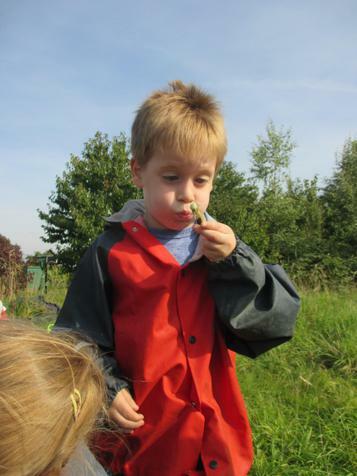 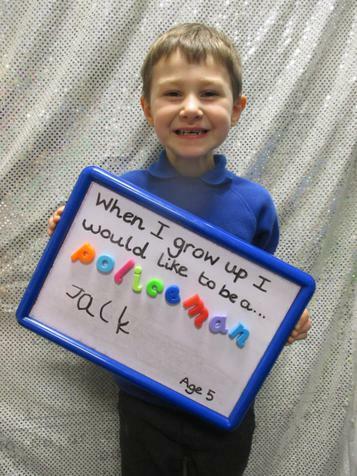 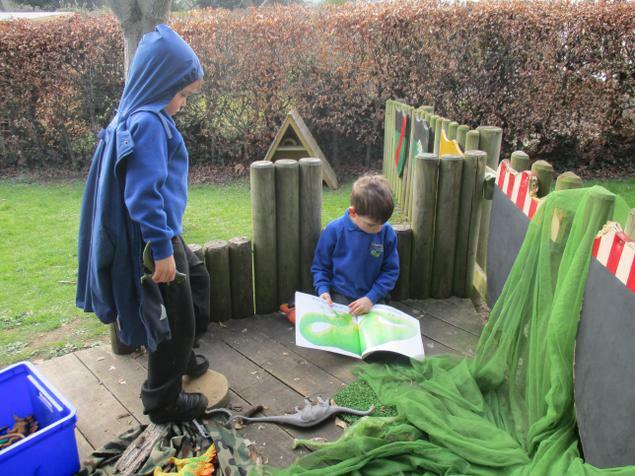 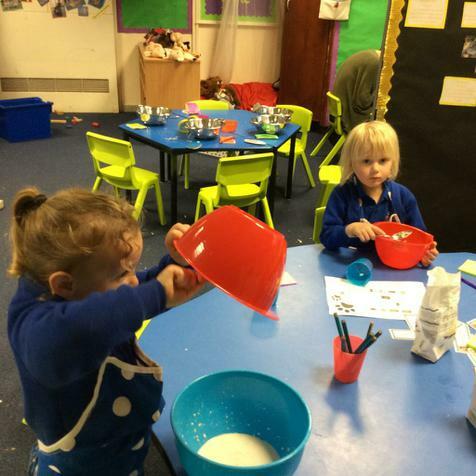 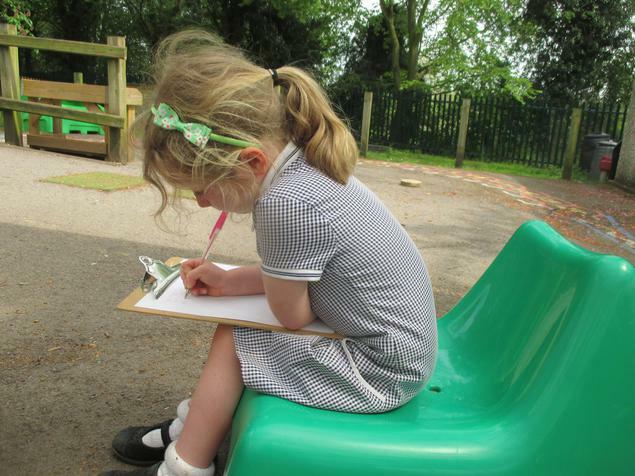 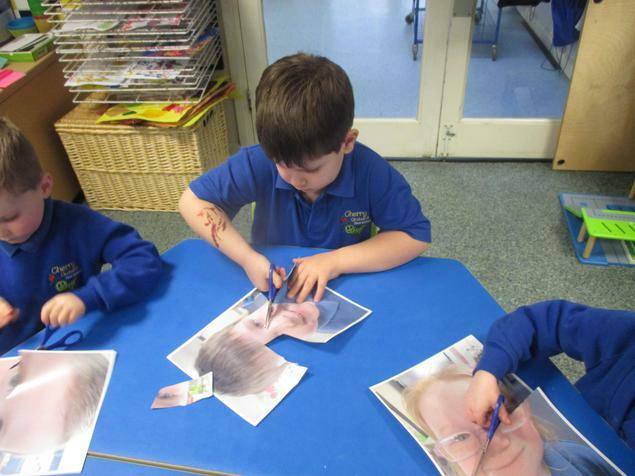 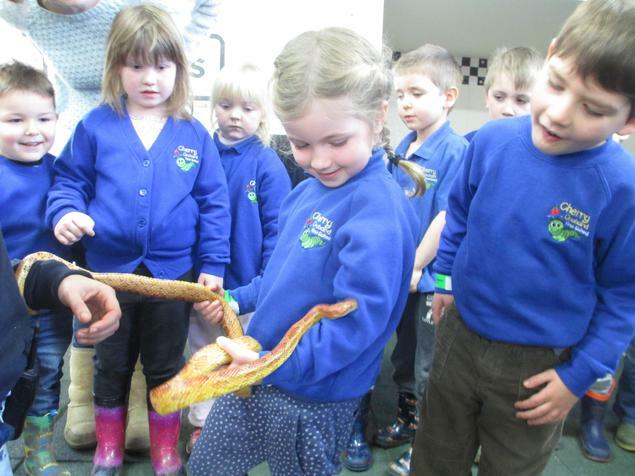 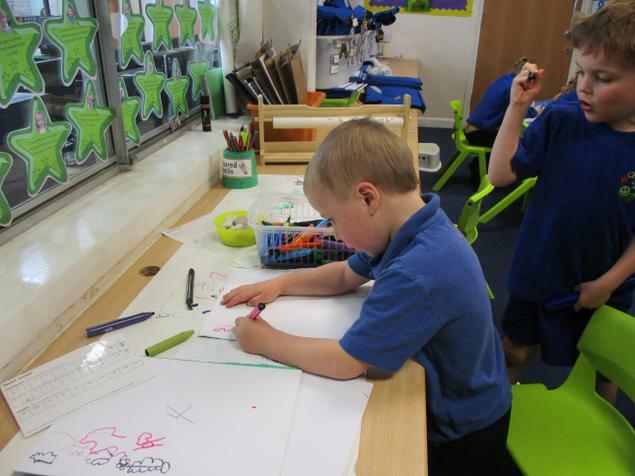 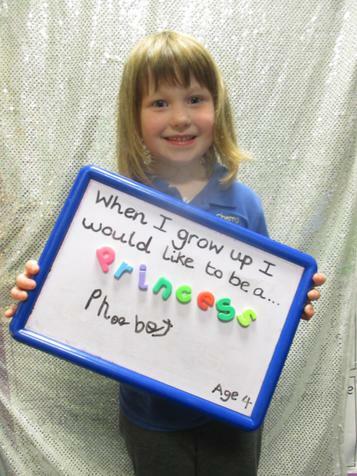 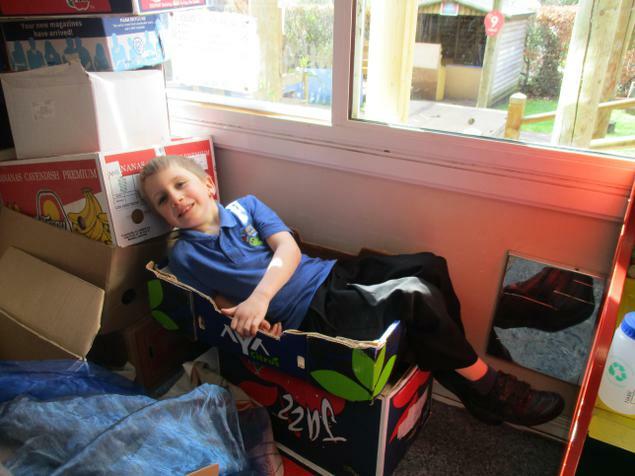 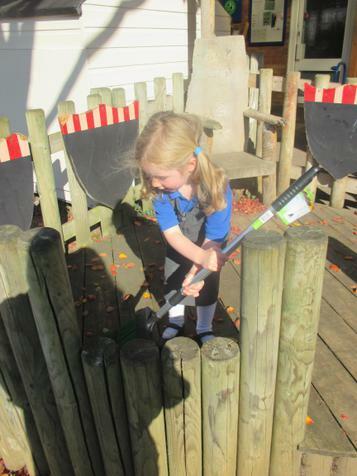 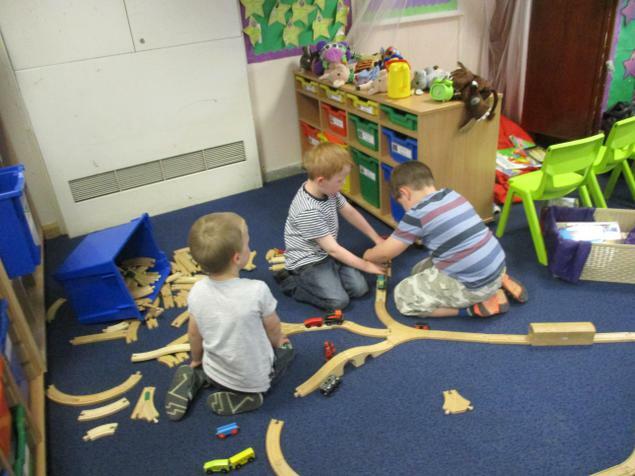 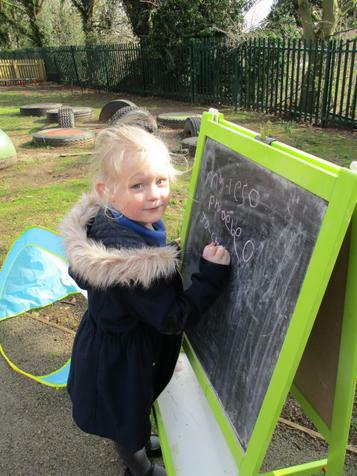 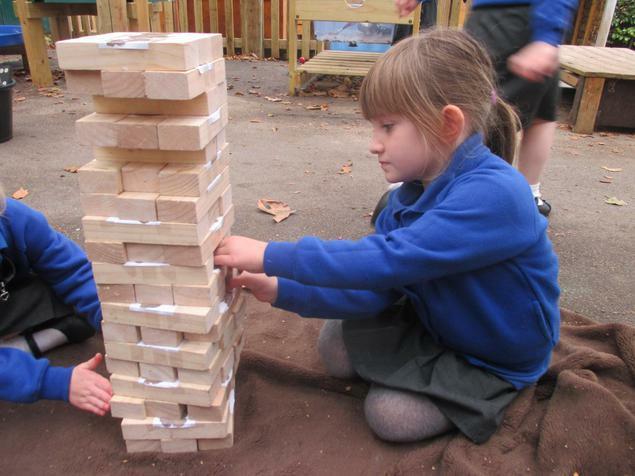 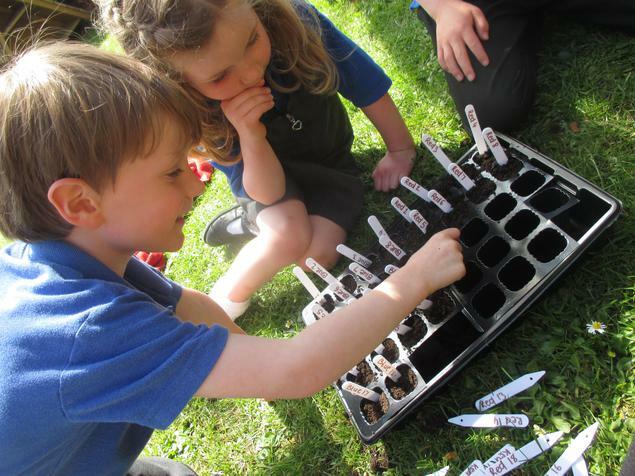 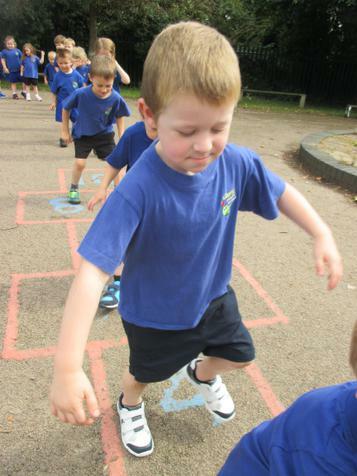 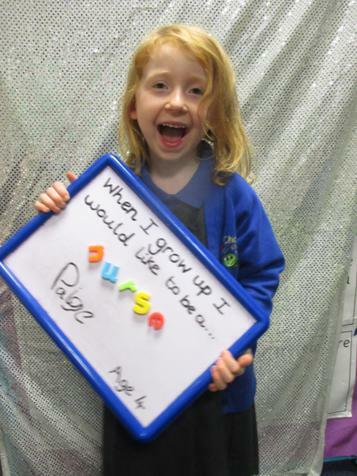 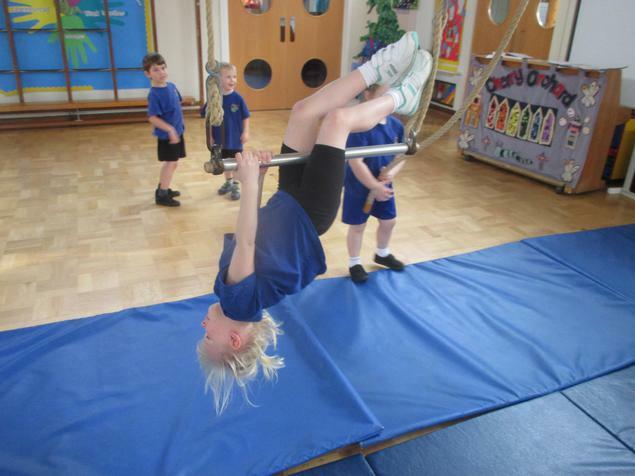 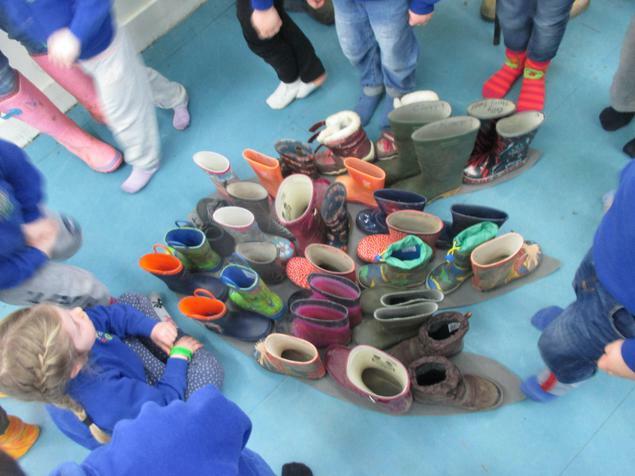 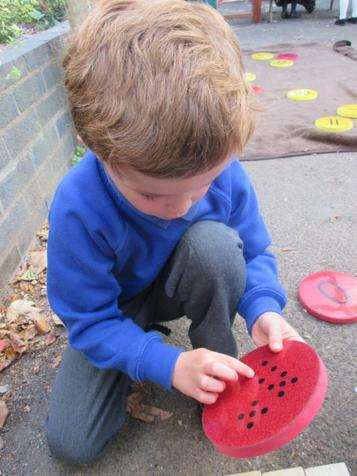 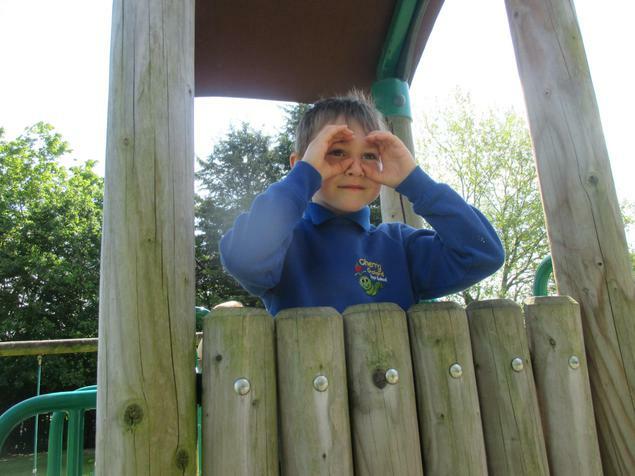 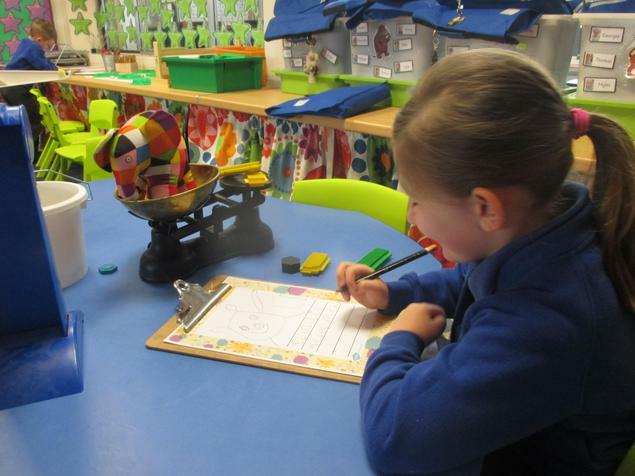 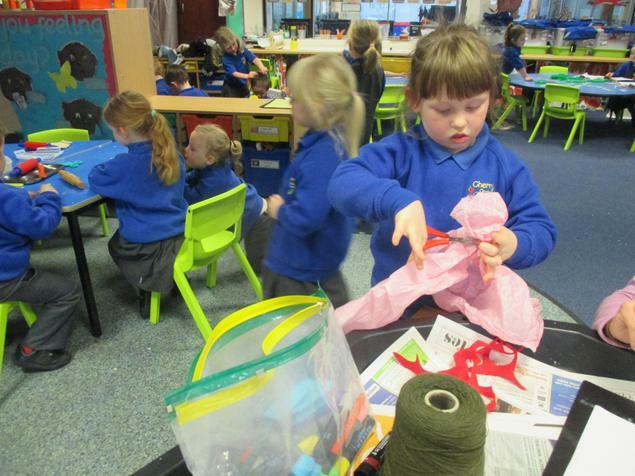 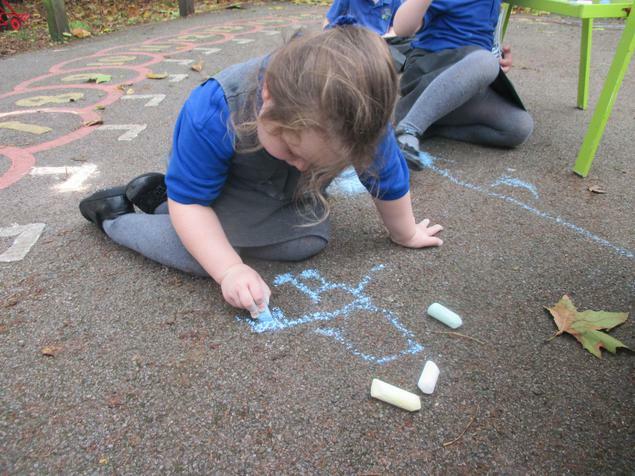 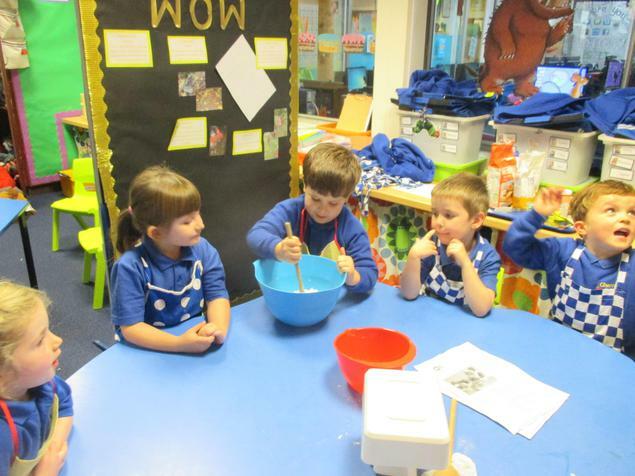 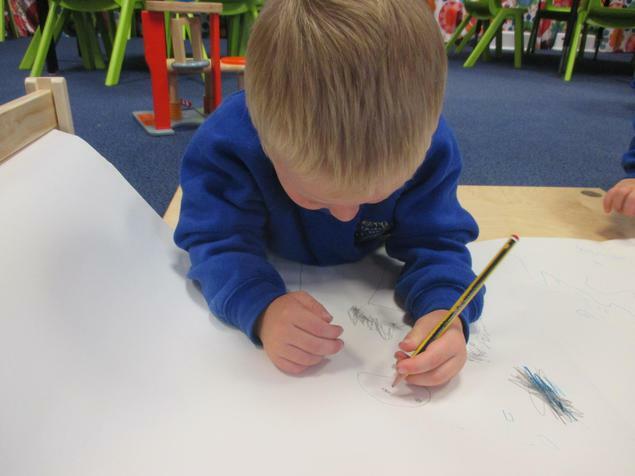 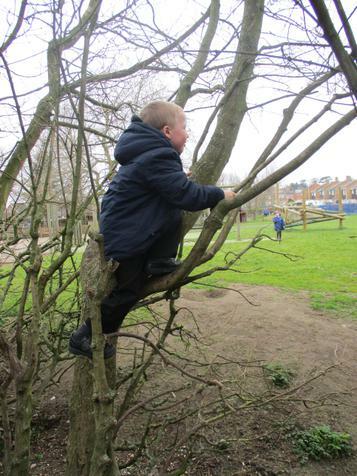 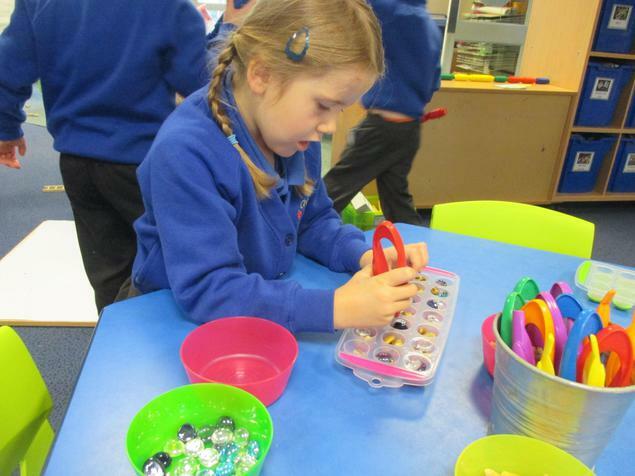 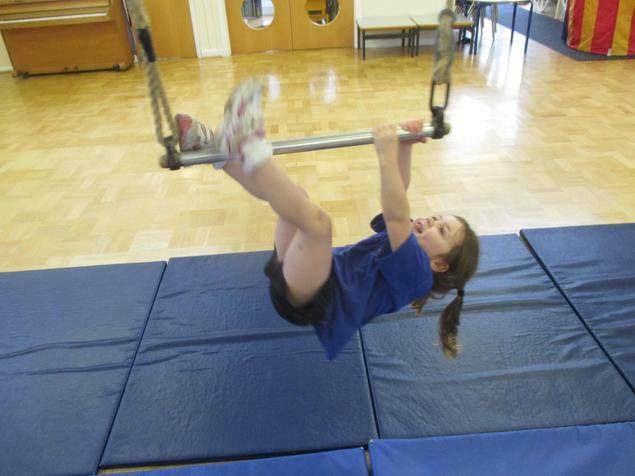 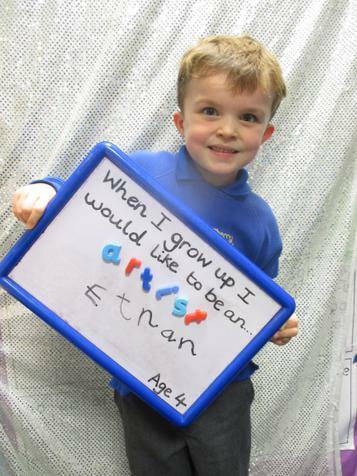 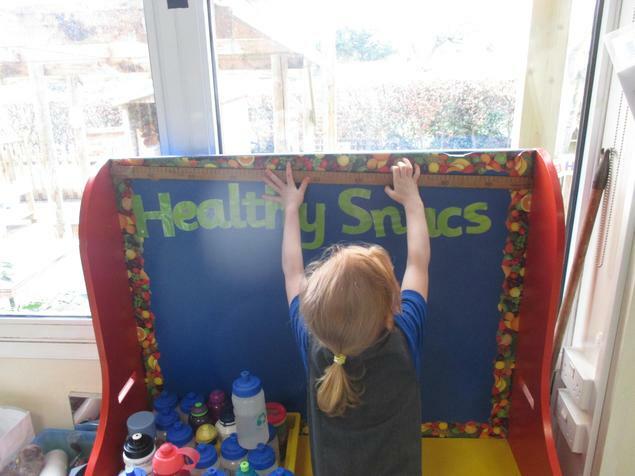 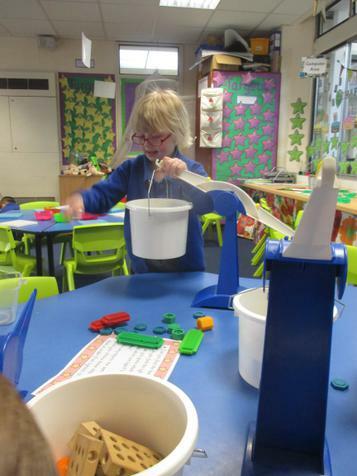 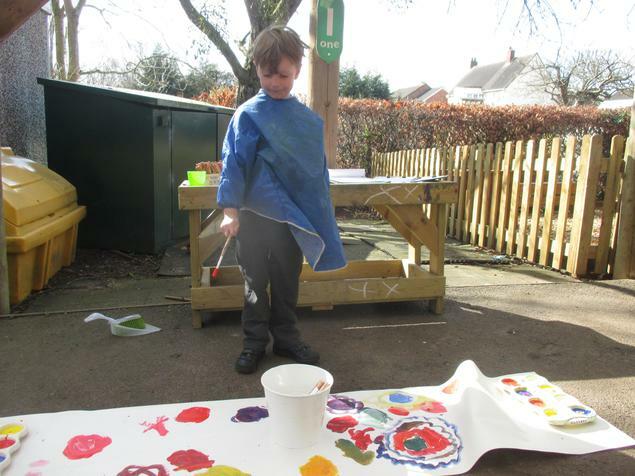 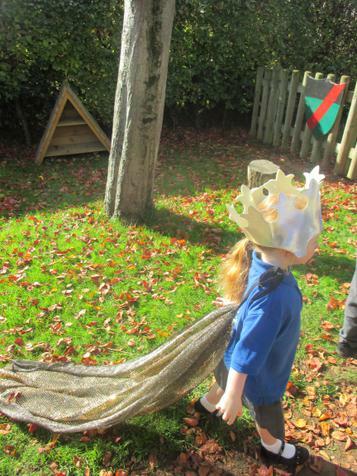 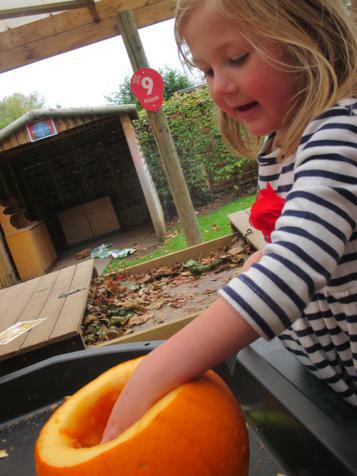 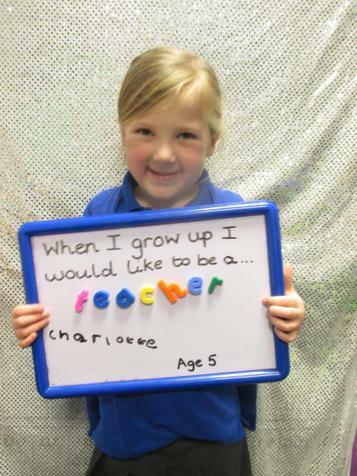 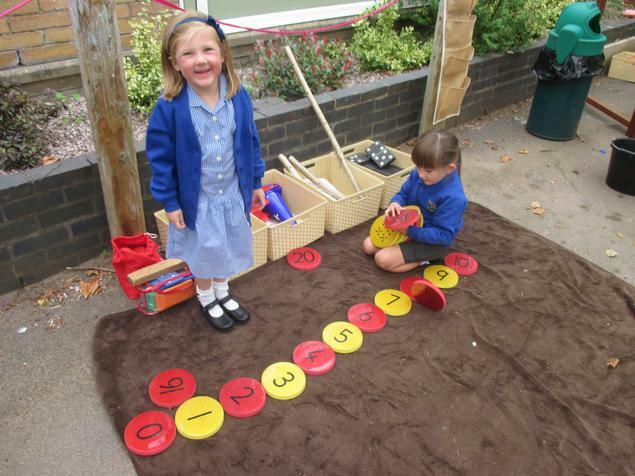 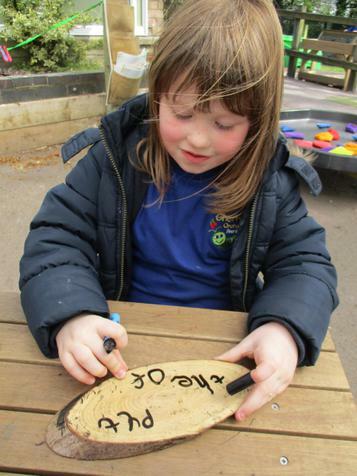 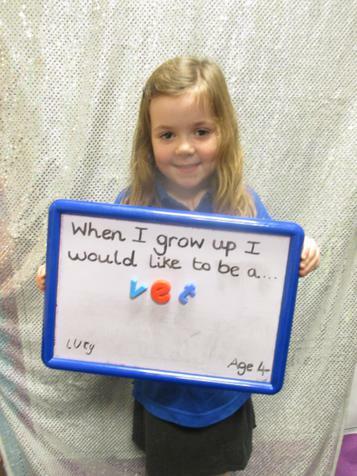 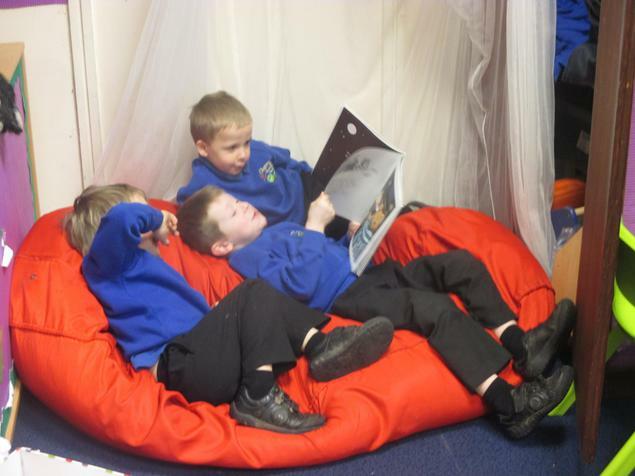 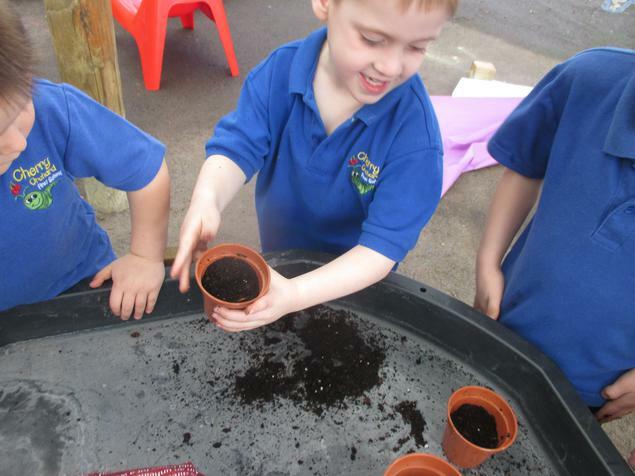 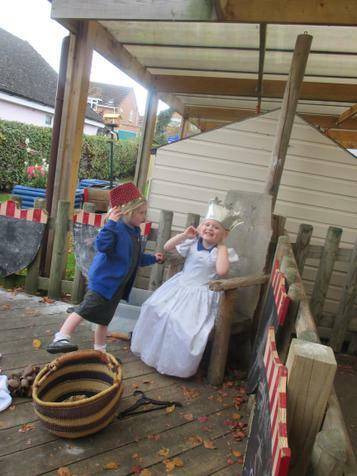 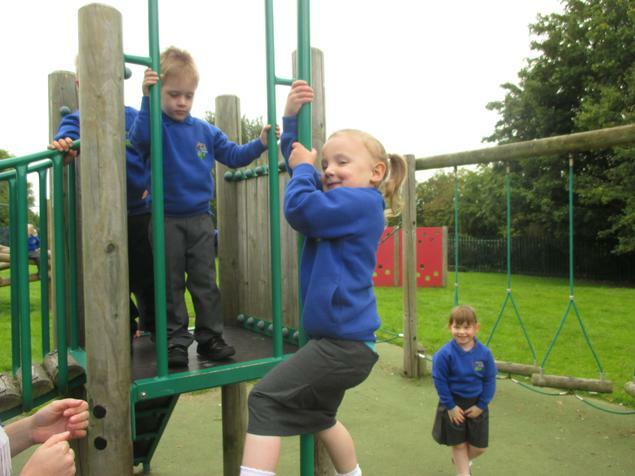 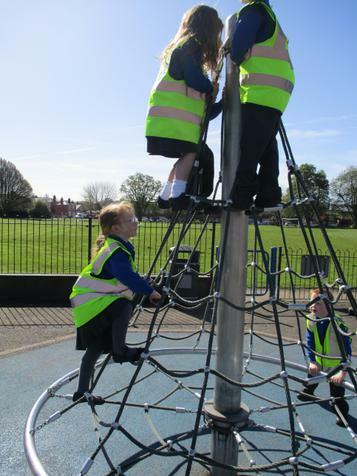 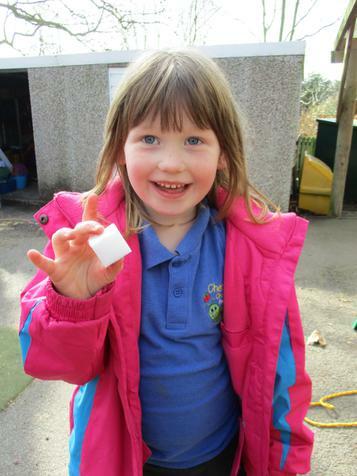 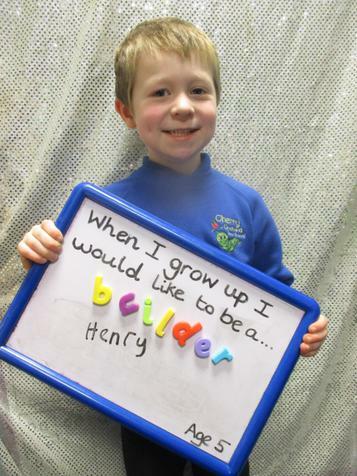 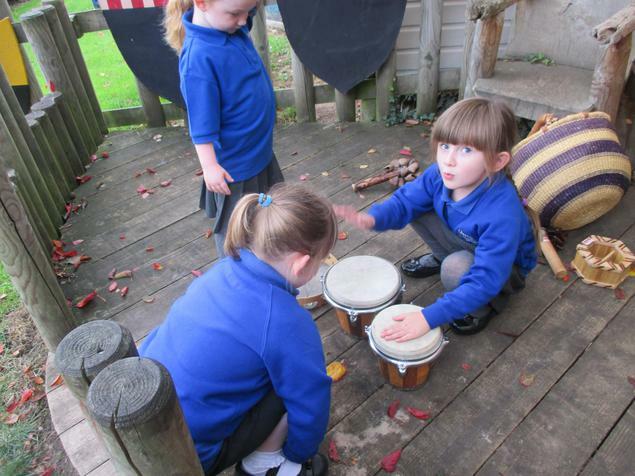 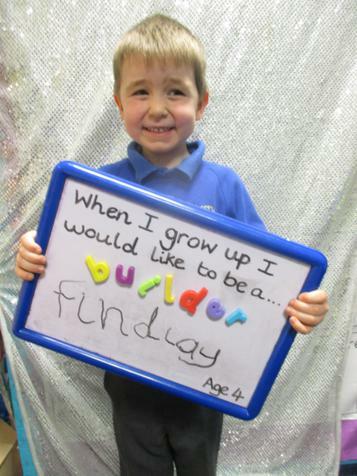 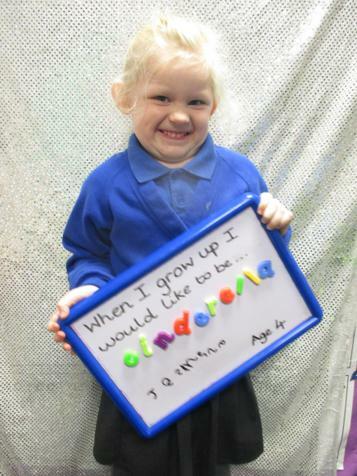 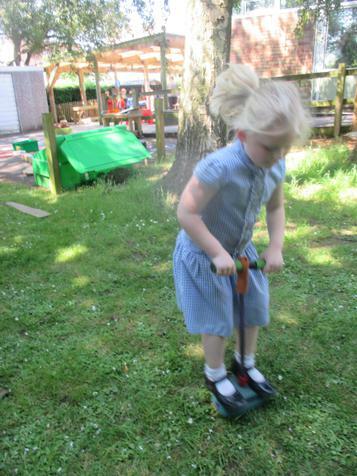 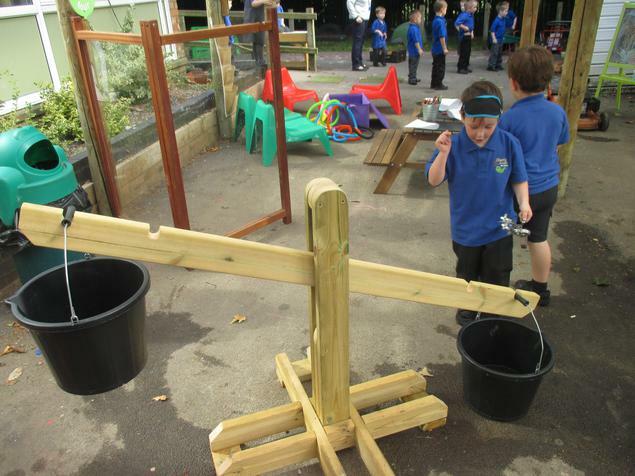 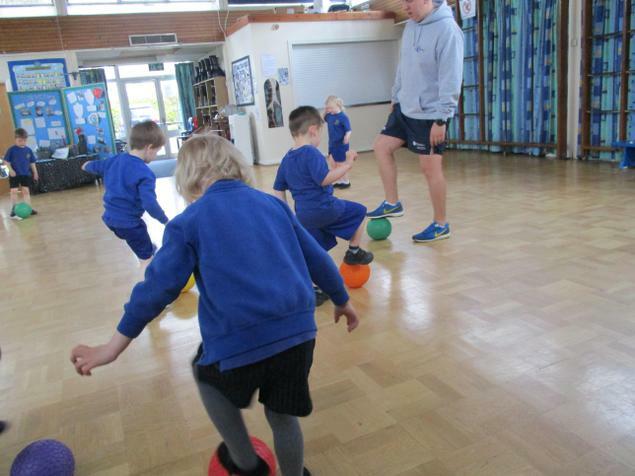 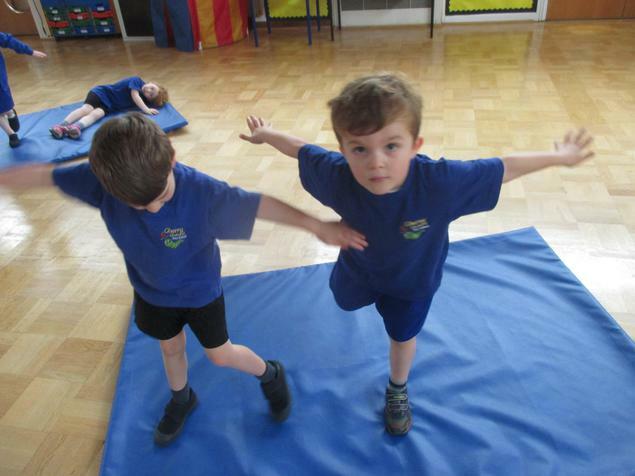 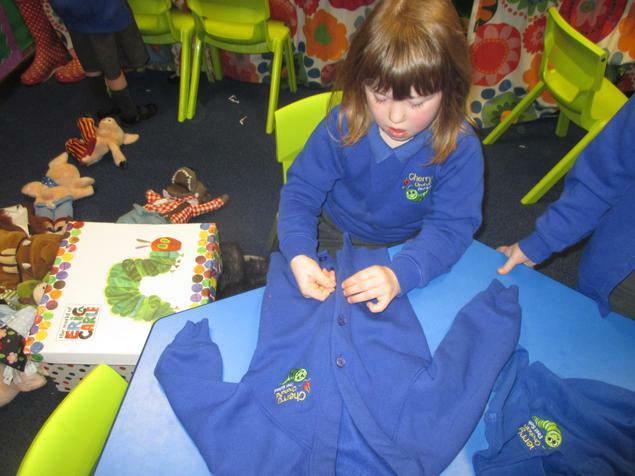 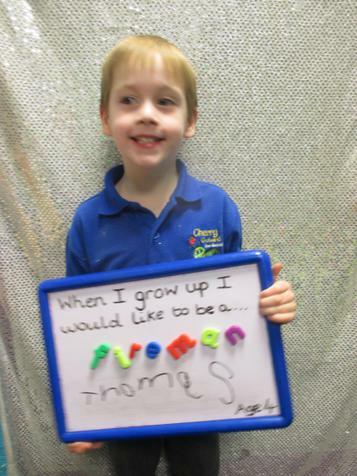 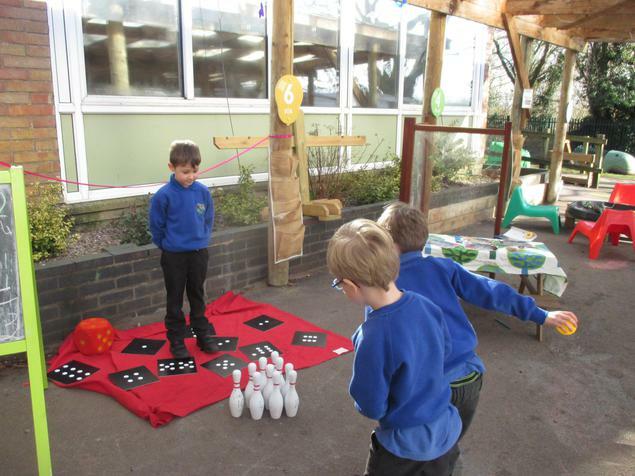 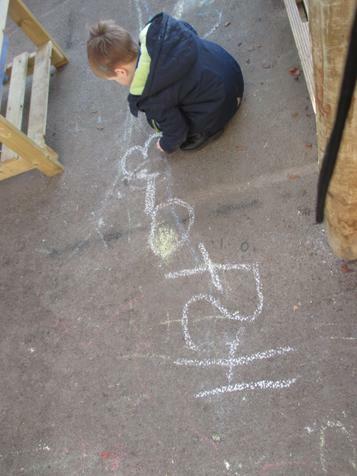 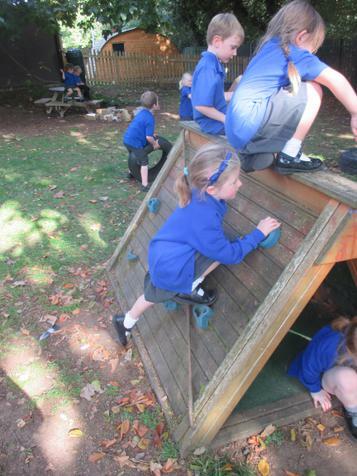 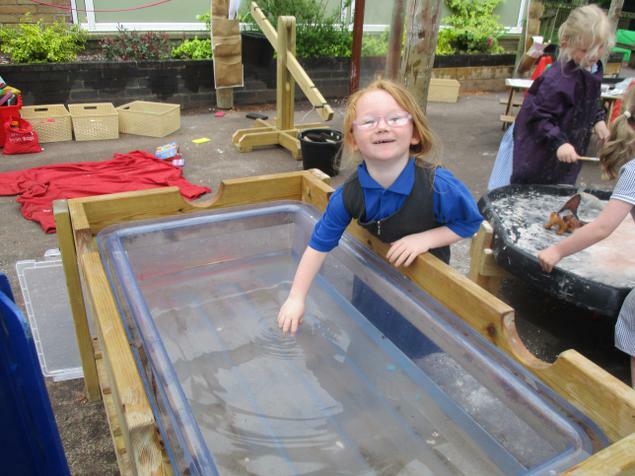 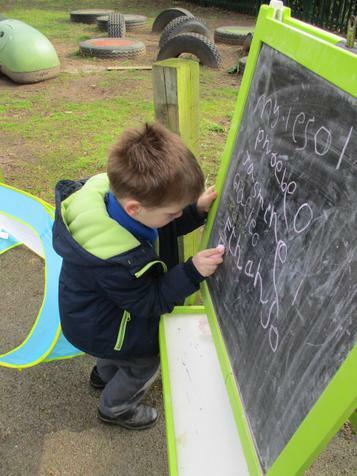 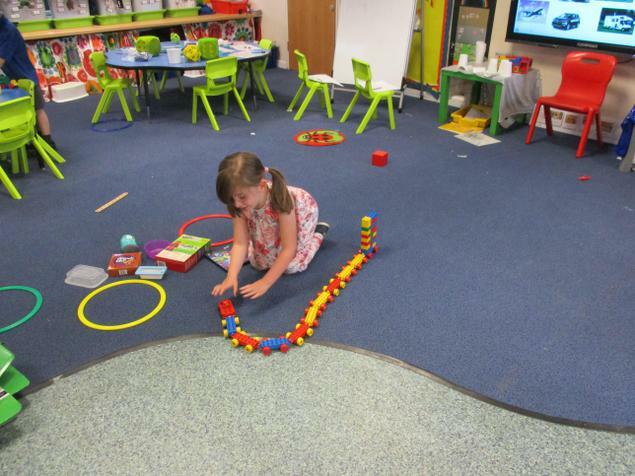 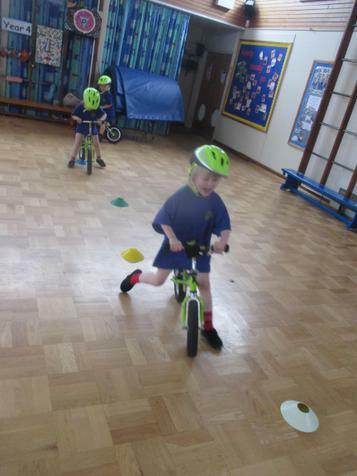 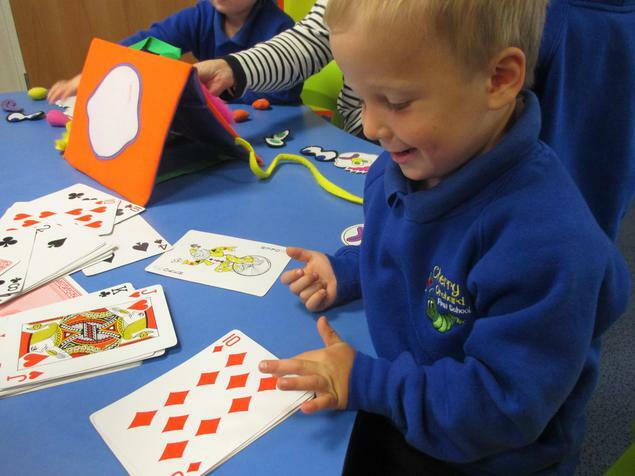 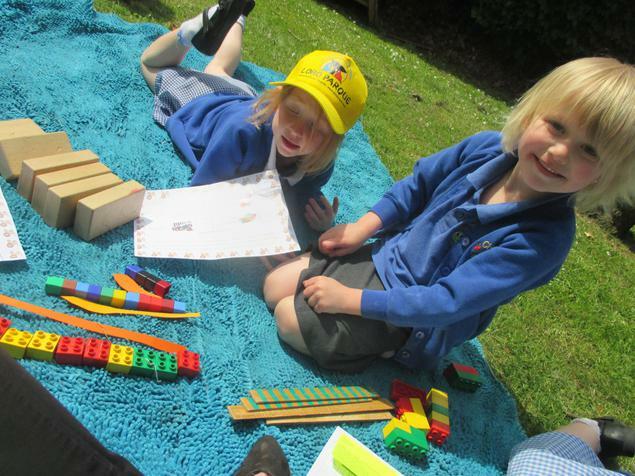 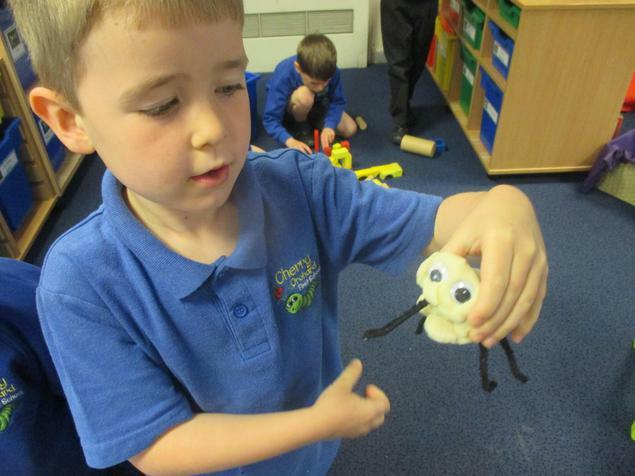 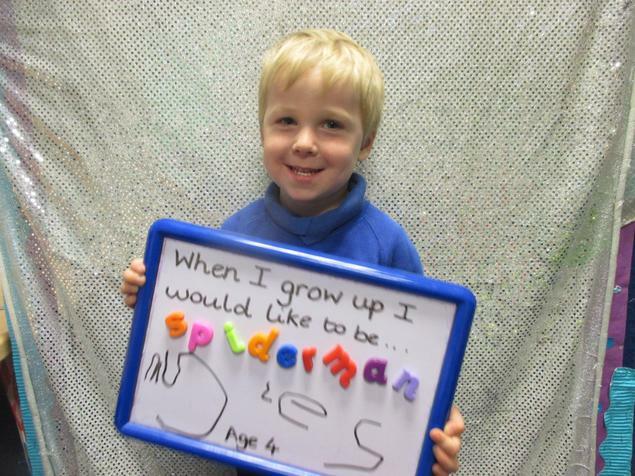 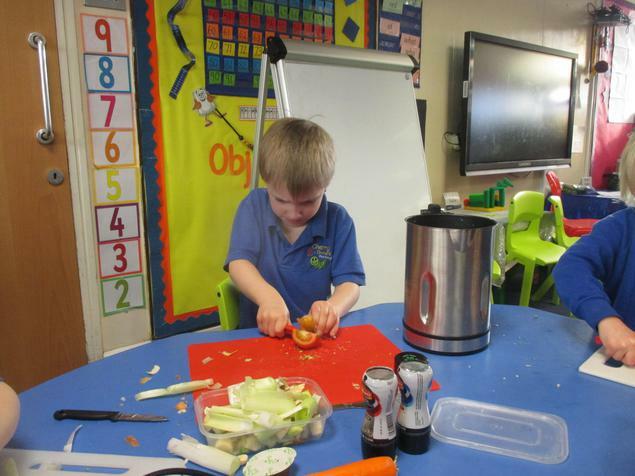 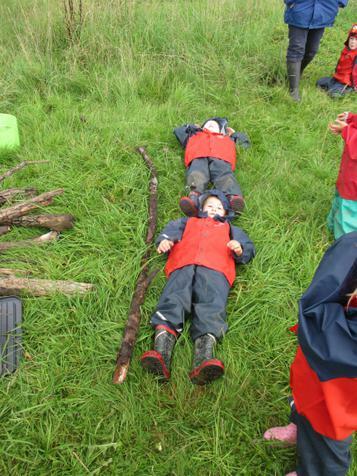 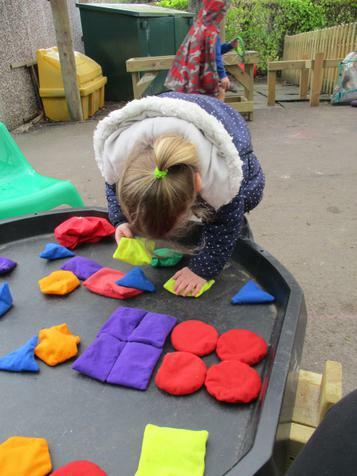 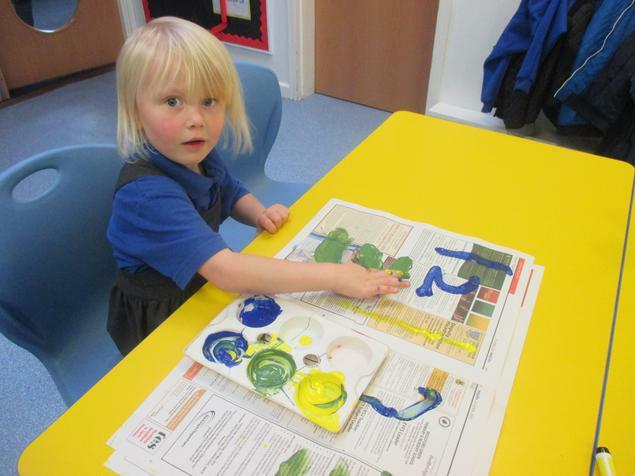 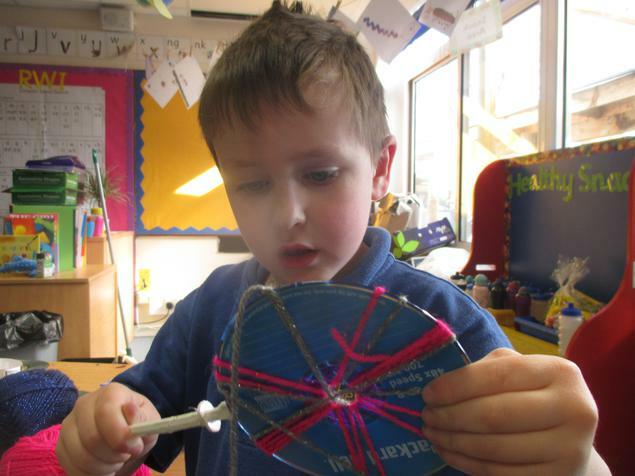 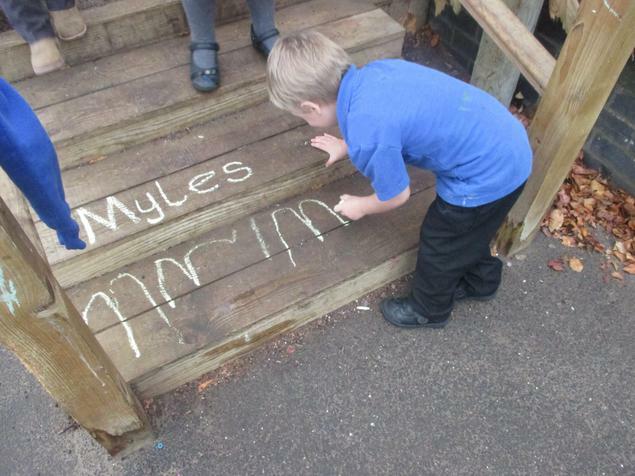 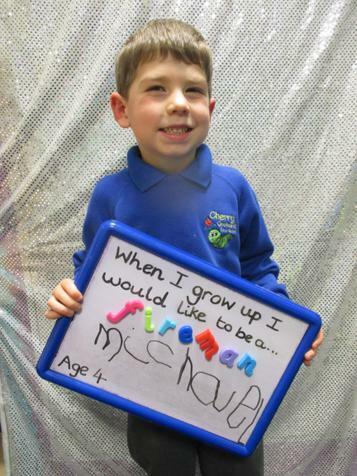 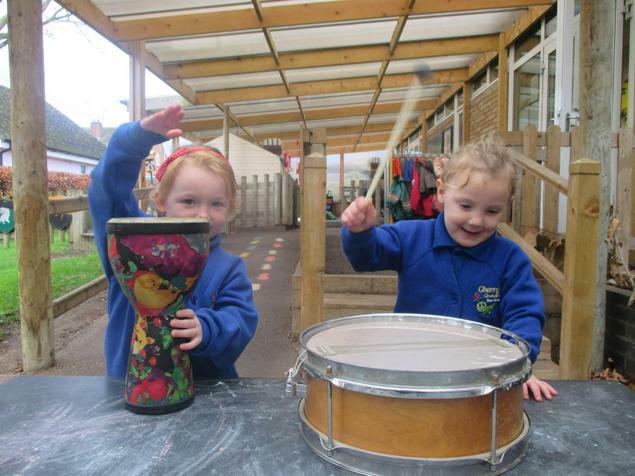 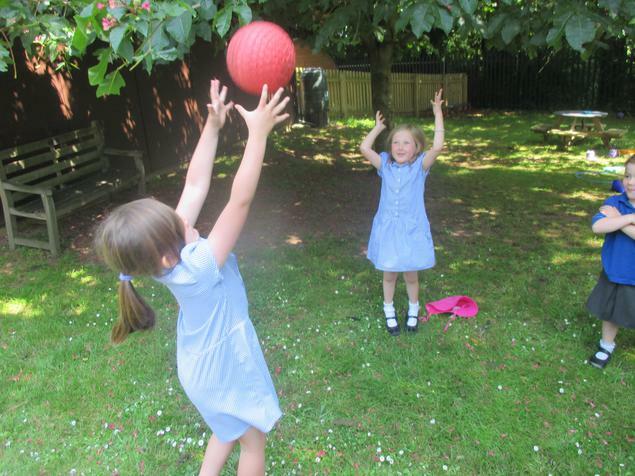 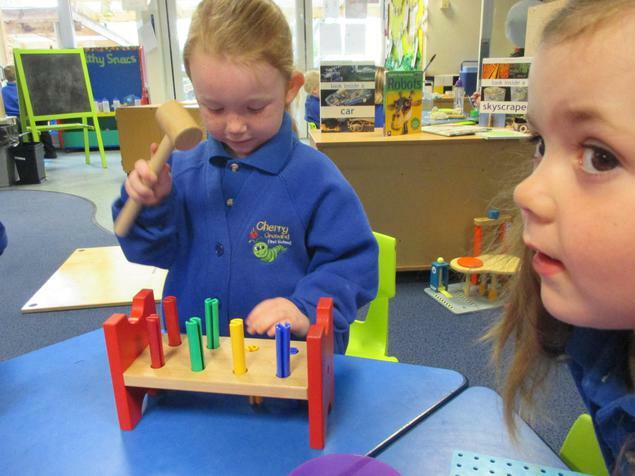 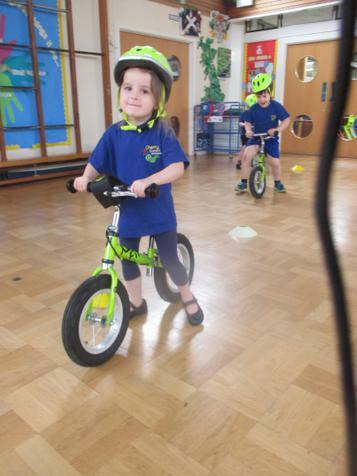 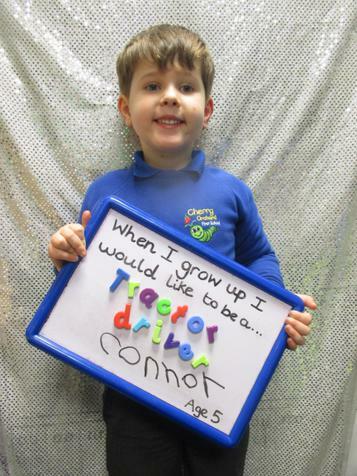 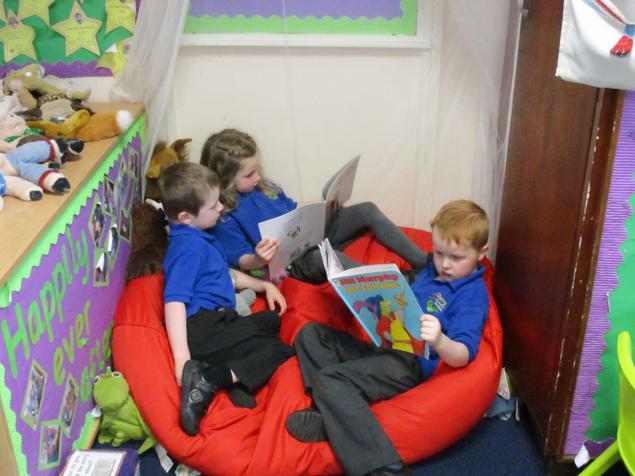 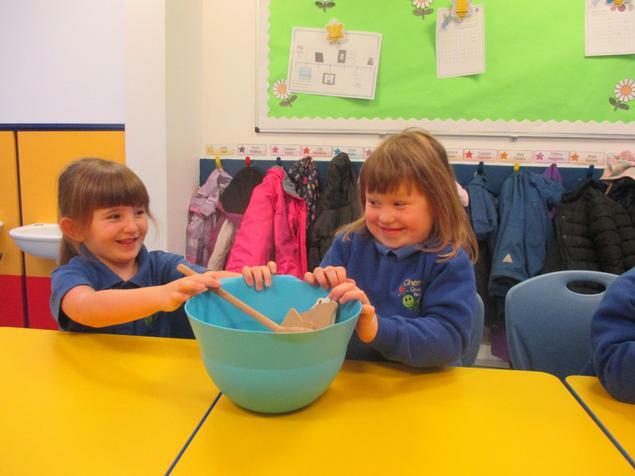 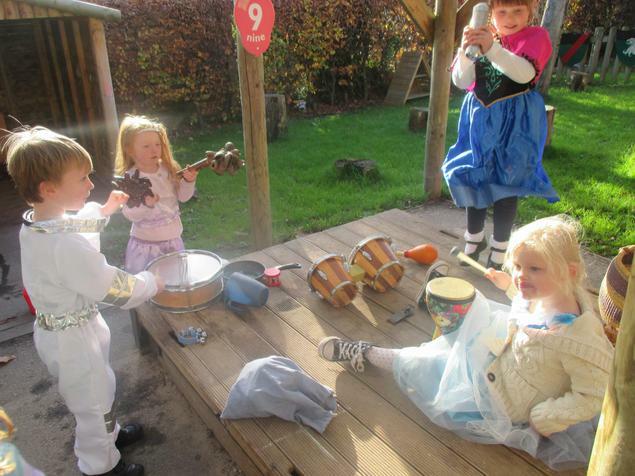 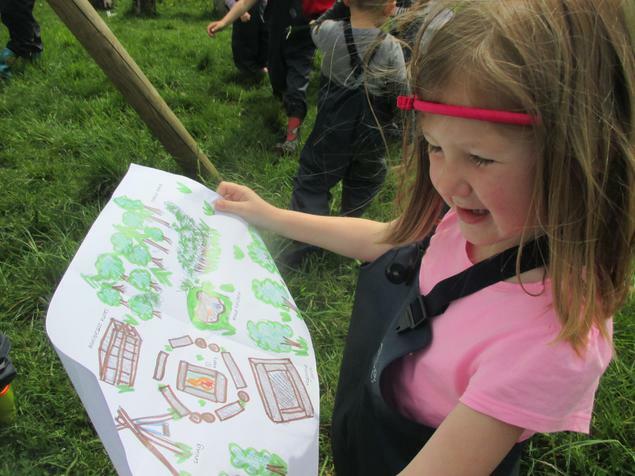 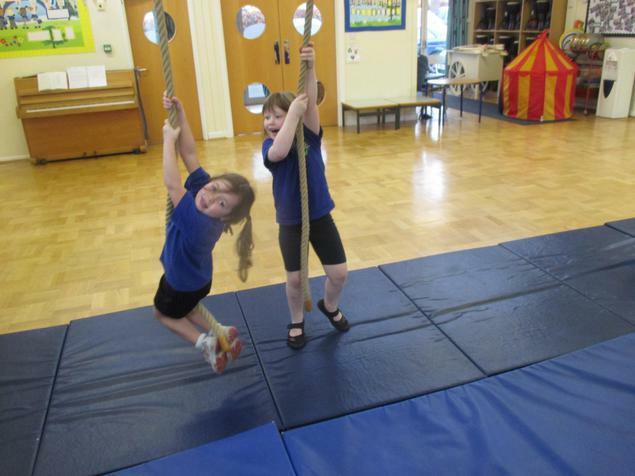 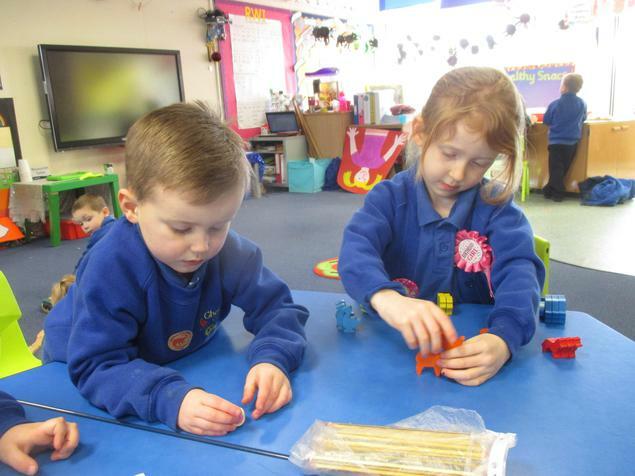 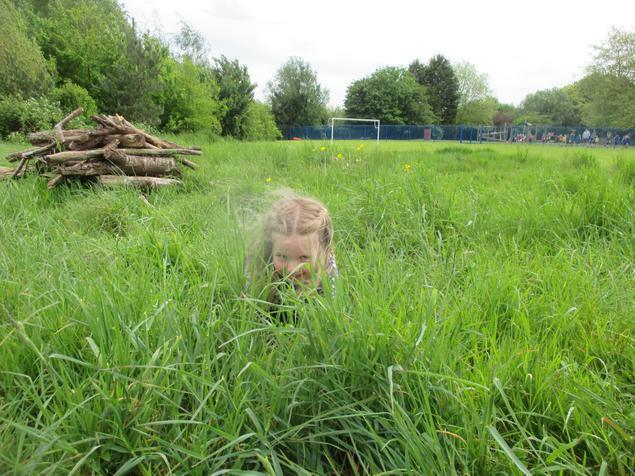 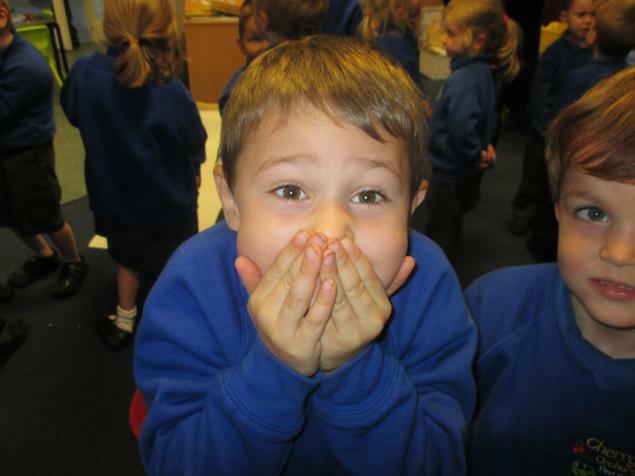 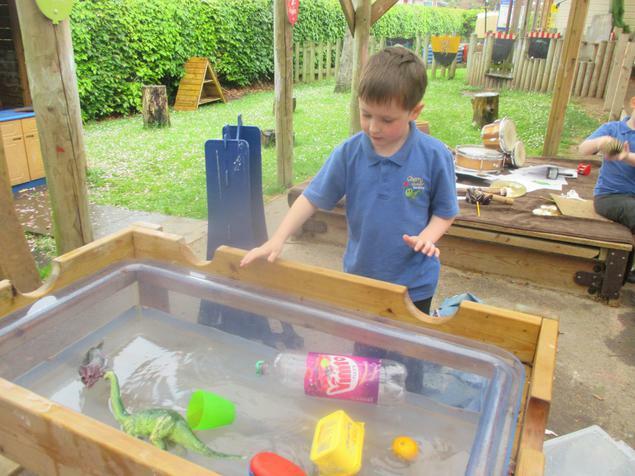 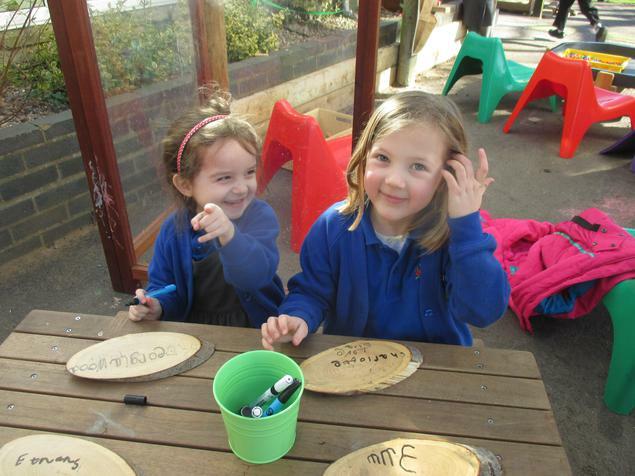 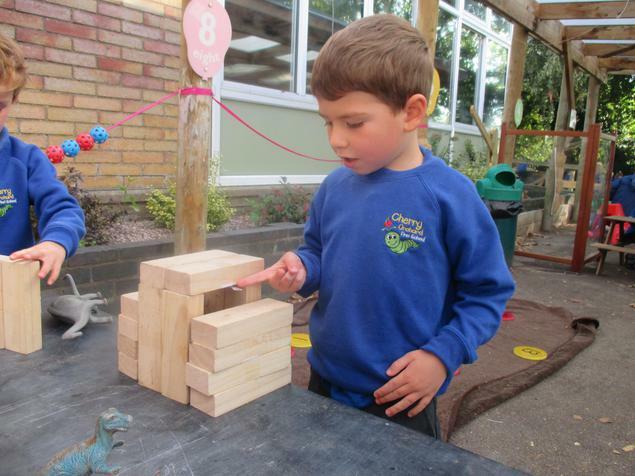 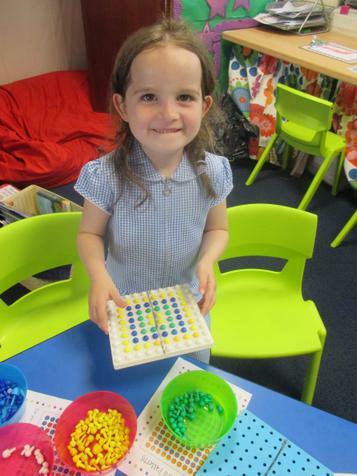 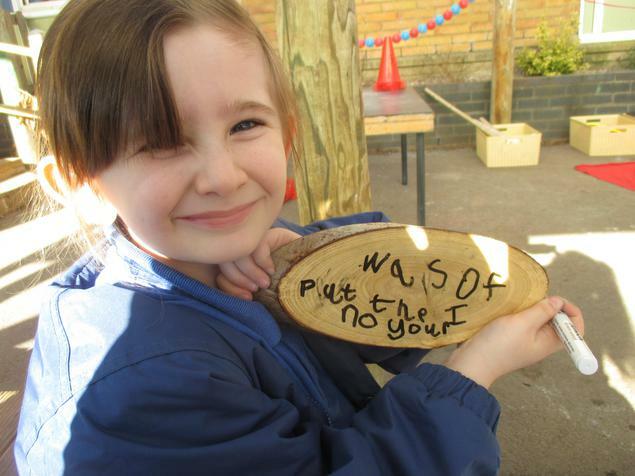 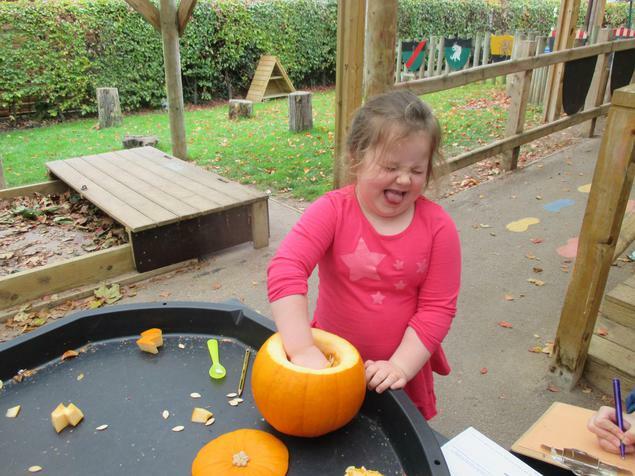 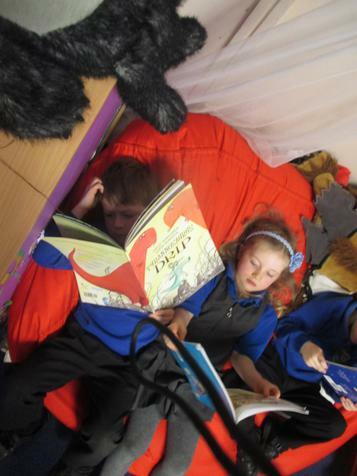 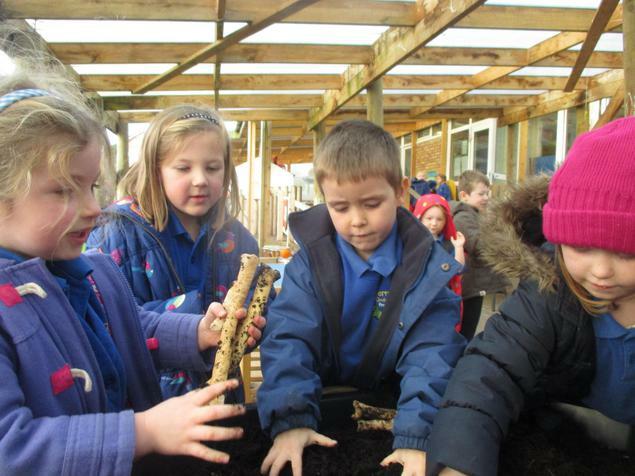 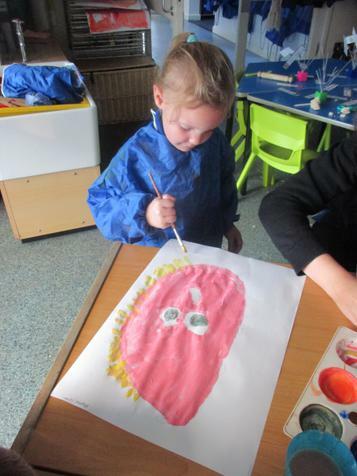 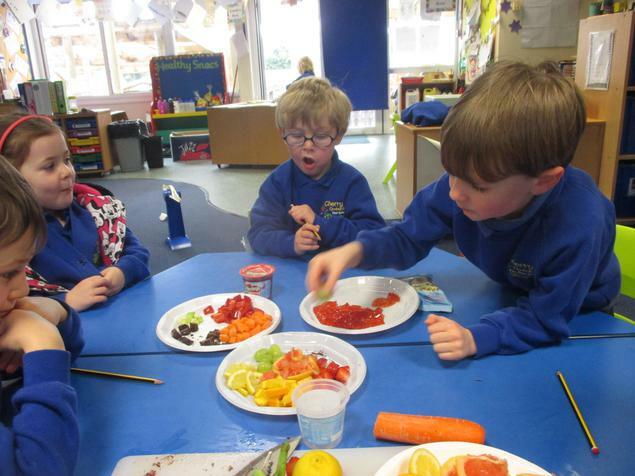 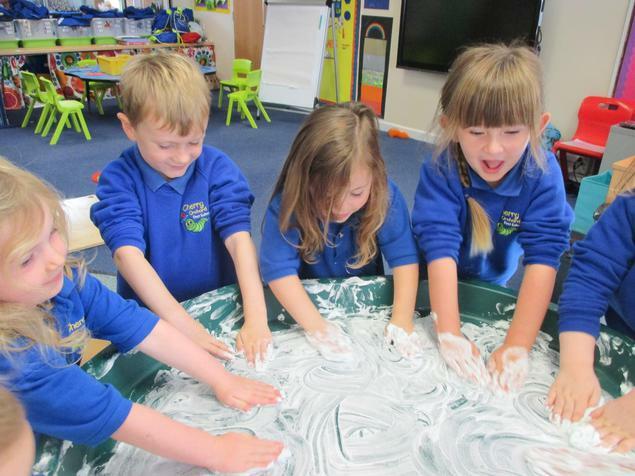 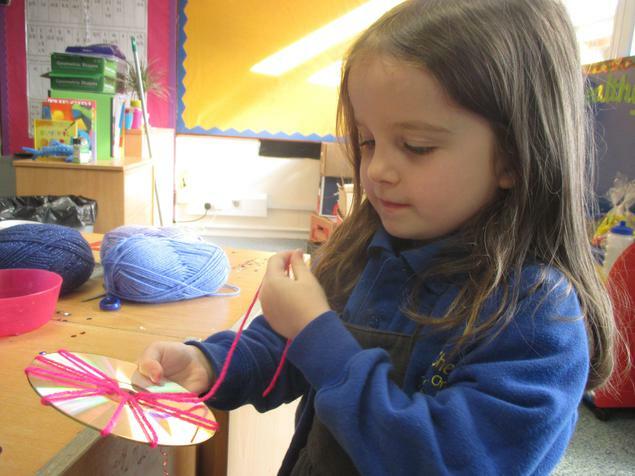 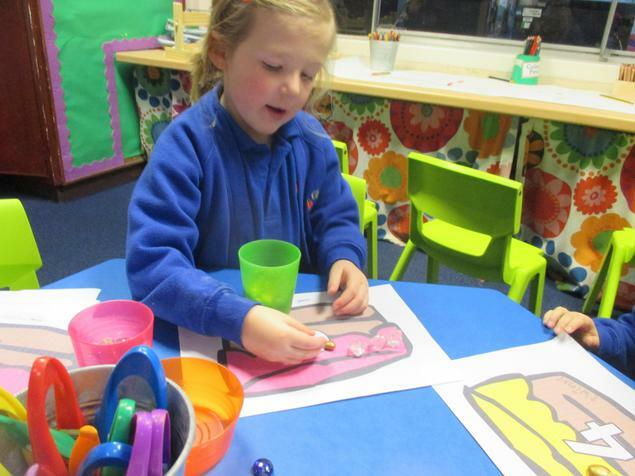 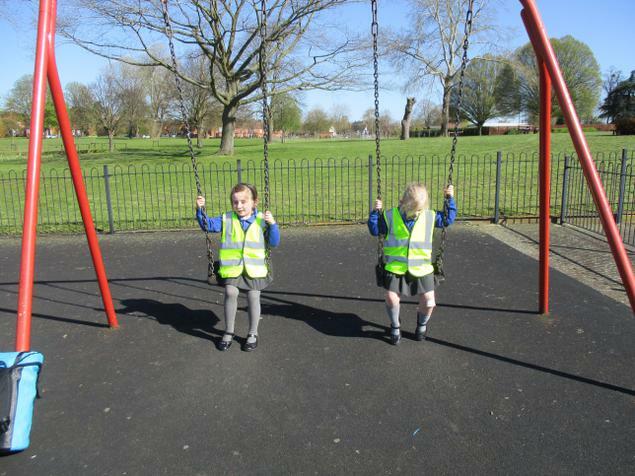 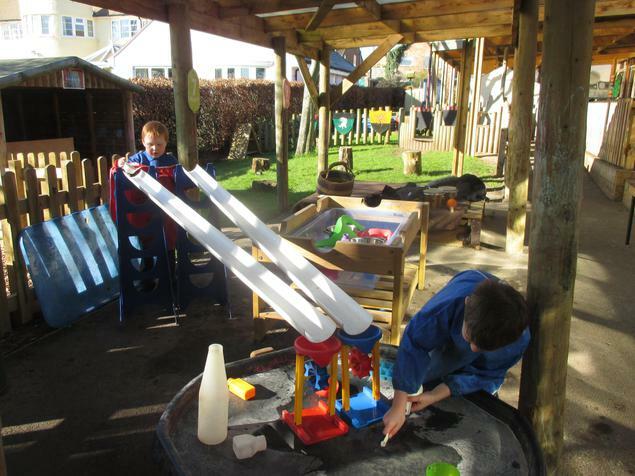 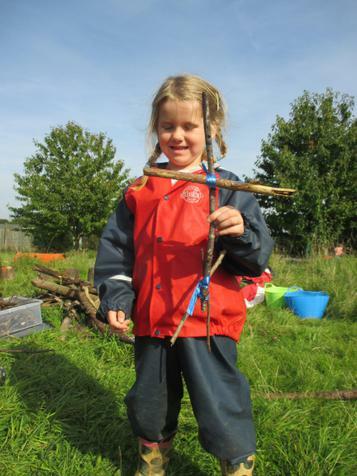 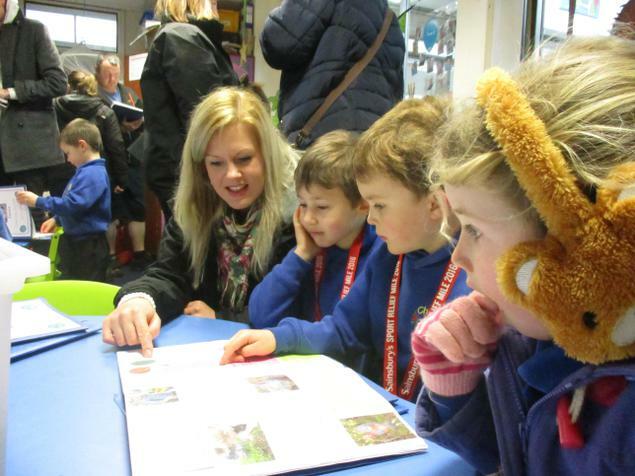 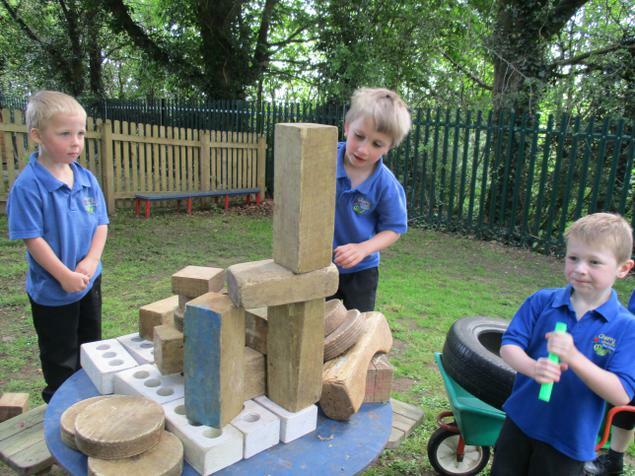 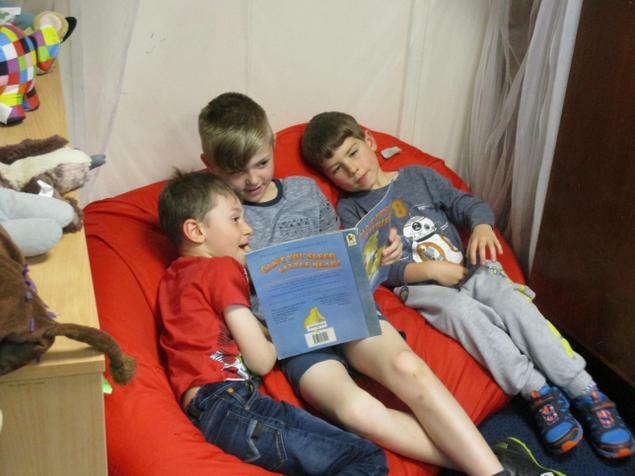 We follow the EYFS curriculum which has seven areas of learning: Personal, Social, Emotional Development, Communication and Language, Physical Development, Mathematics, Literacy, Understanding the World and Expressive Arts and Design. 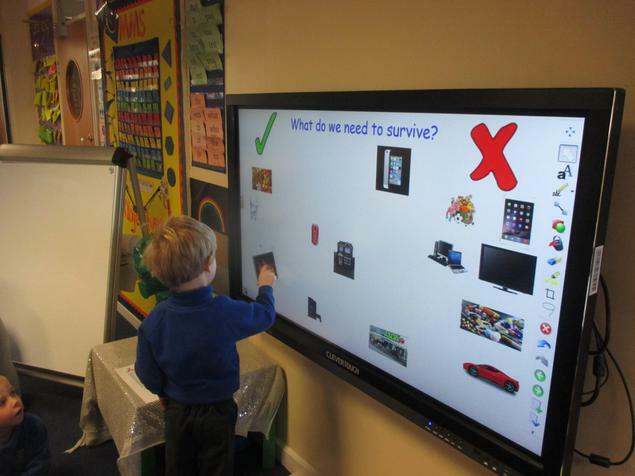 All of the learning opportunities in our classroom help us to work on lots of these areas all at once! 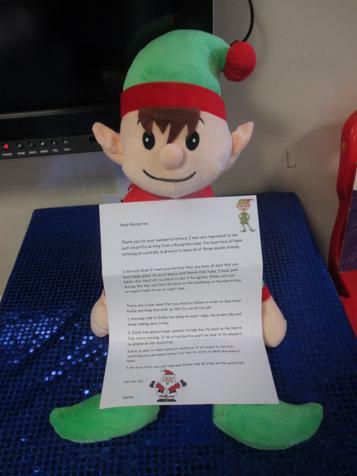 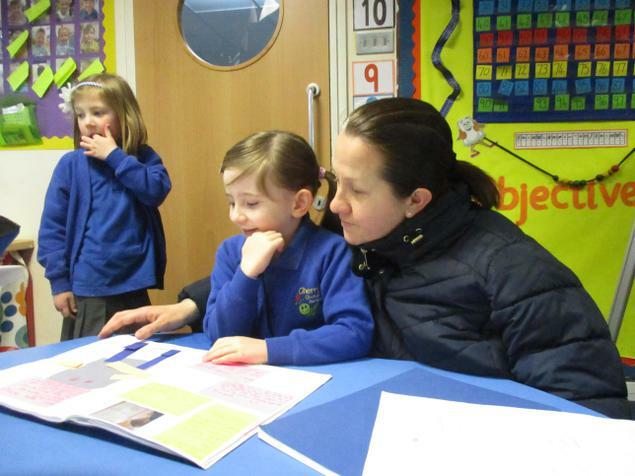 Please talk to Miss Robinson if you would like to know more. 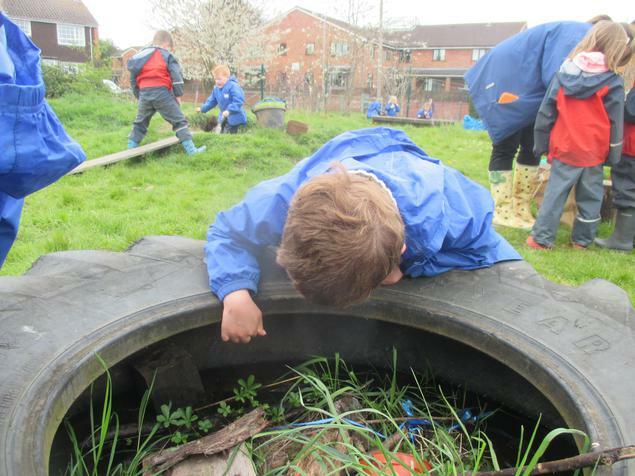 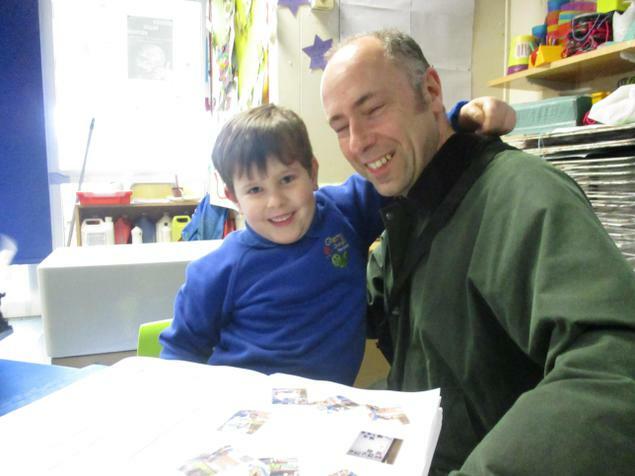 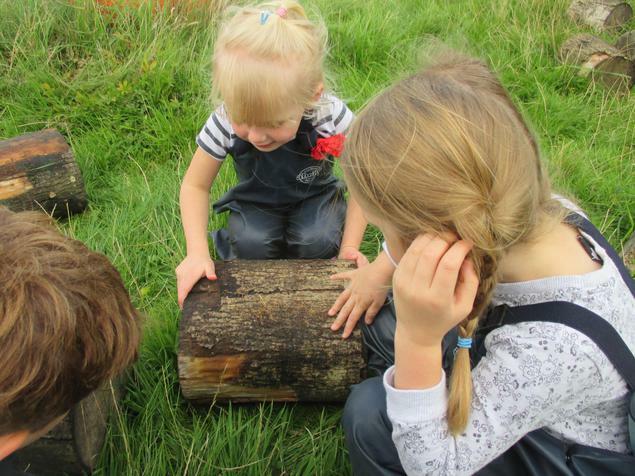 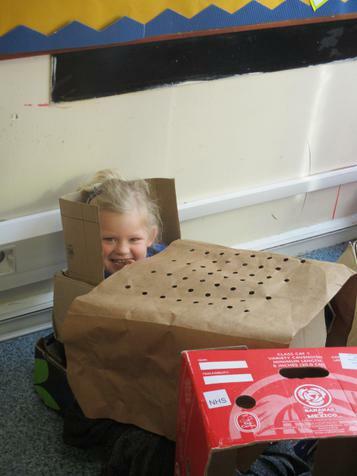 Here is a Parent's guide to the EYFS curriculum which explains what to expect, and when, in each of the seven areas of learning. 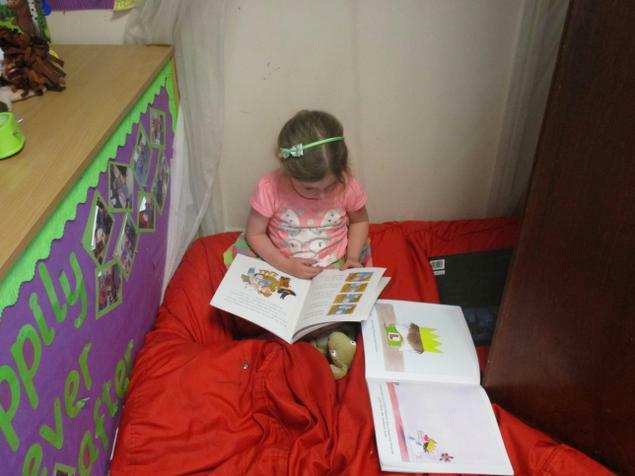 It also provides ideas on how to support your child's learning at home for each developmental stage. 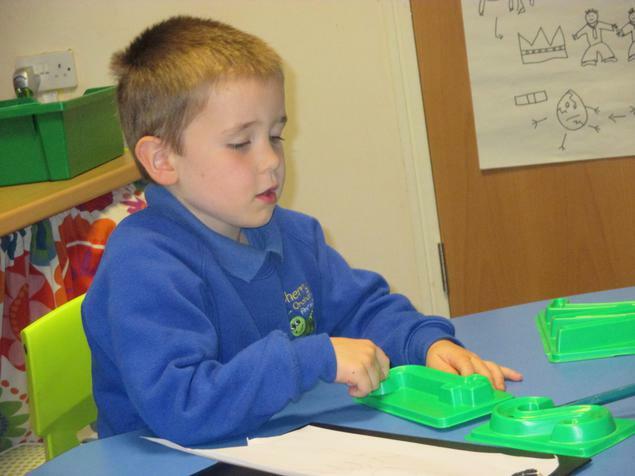 This half term some of us will be learning how to use the RWI set one sounds in order to read words and sentences by ourselves. 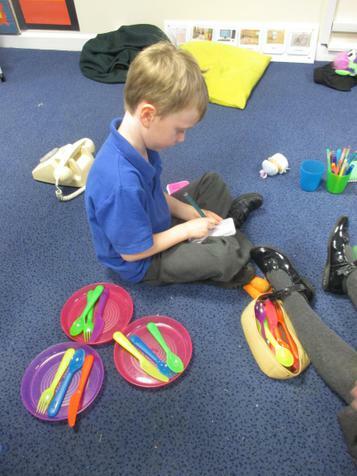 We will be using our sounds to read short stories called ditties. 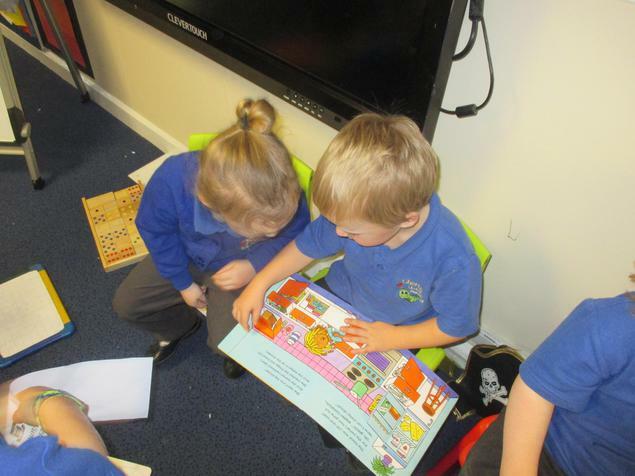 We will have to read really carefully and think really carefully about what we are reading because we will answer questions about the story when we have finished reading it. 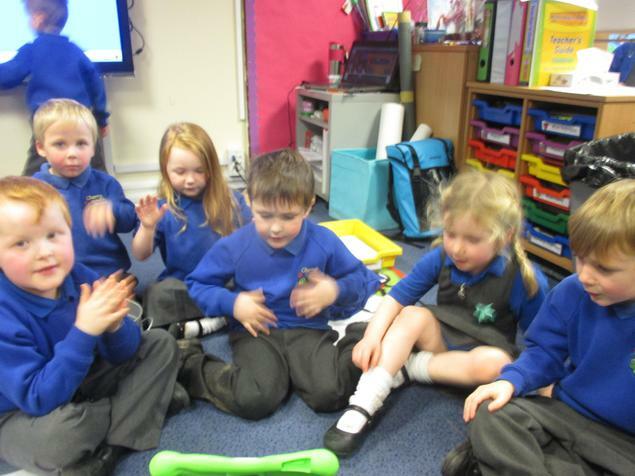 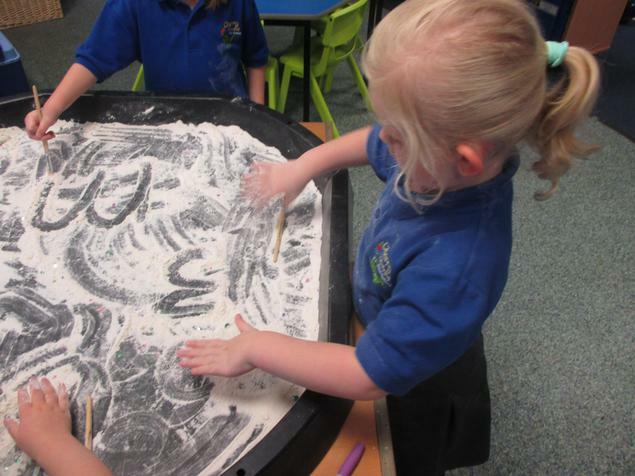 We will also be learning how to remember a sentence and write it by using our sounds, Fred fingers and finger spaces. 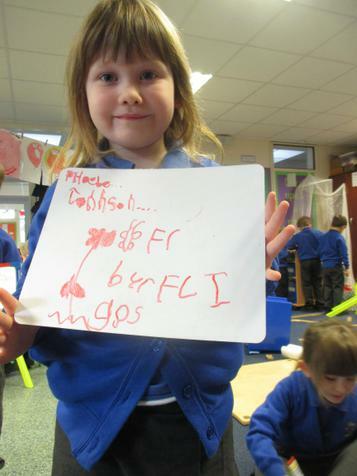 We will also be learning some 'red' words... sounds tricky... but don't panic! 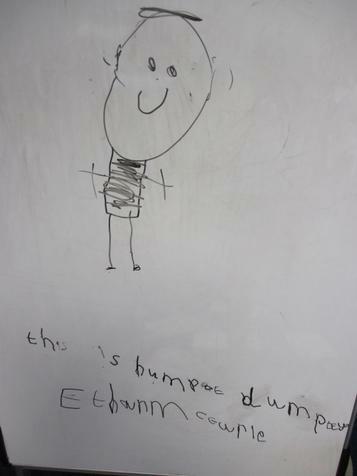 They are just words that we can't sound out, like the word 'the'. 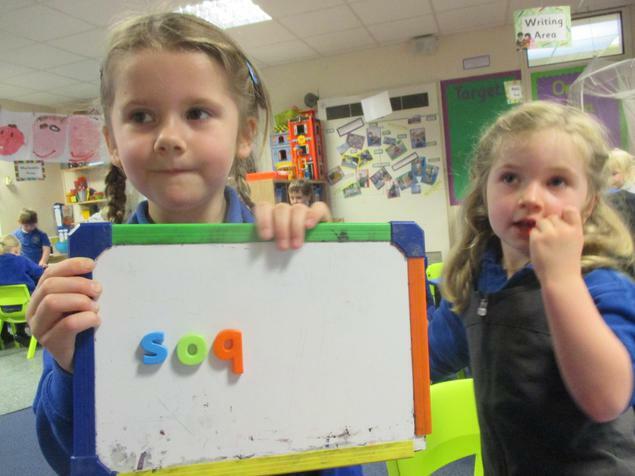 This half term some of us will be learning the RWI set two sounds. 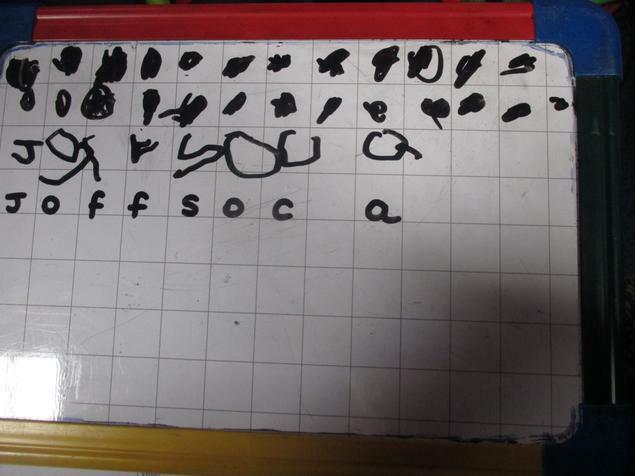 We will learn a new sound every few days and will practice reading it in words and applying it in ur writing. 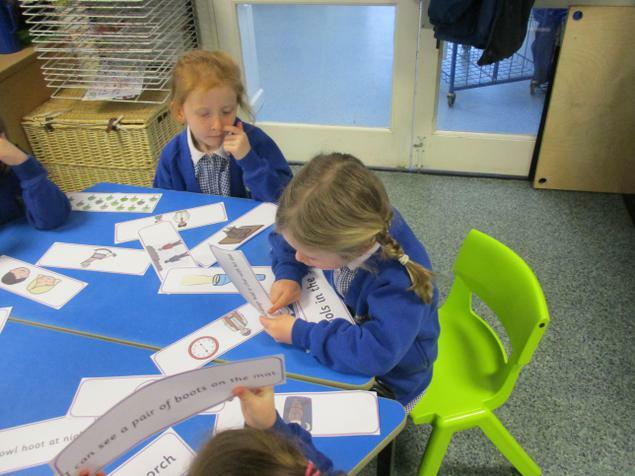 We will keep practicing reading the set one sounds and we will use these sounds to help us to read longer stories. 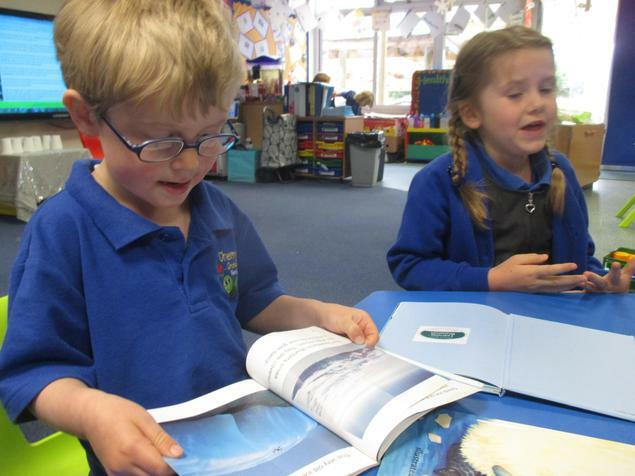 We will have to read really carefully and think really carefully about what we are reading because we will answer questions about the story when we have finished reading it. 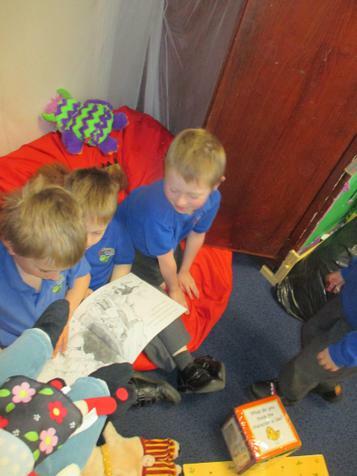 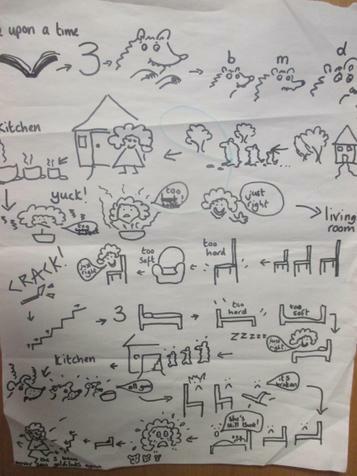 We will be working really hard to use 'Fred in our head' to help us to read words... sounds tricky... but don't panic! 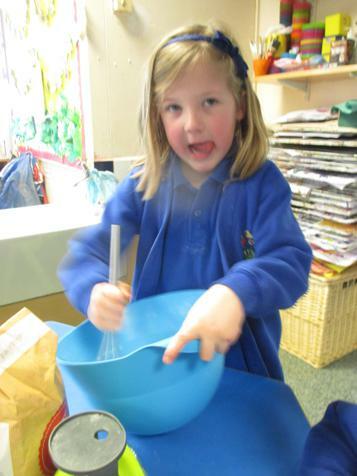 This is just saying the sounds in our heads rather than aloud before blending. 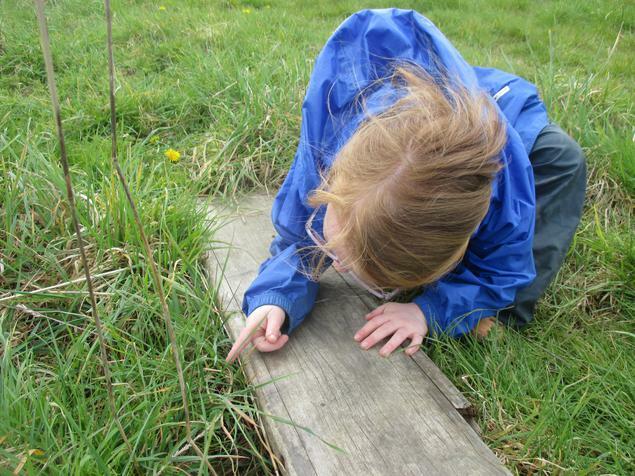 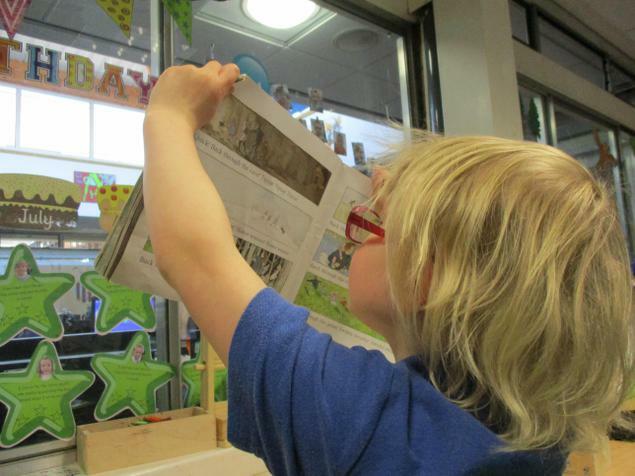 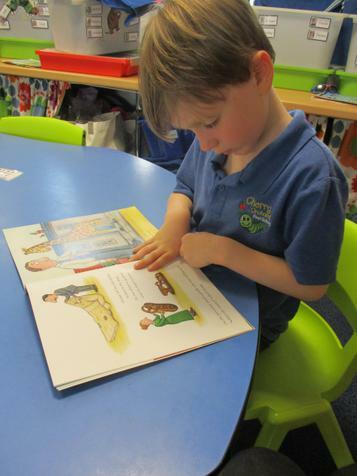 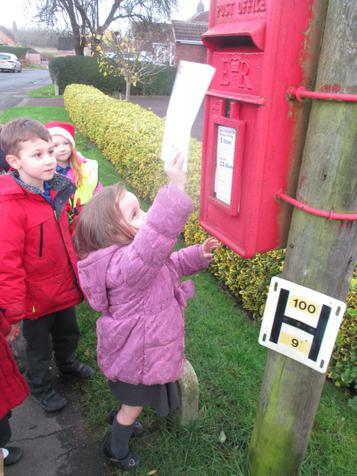 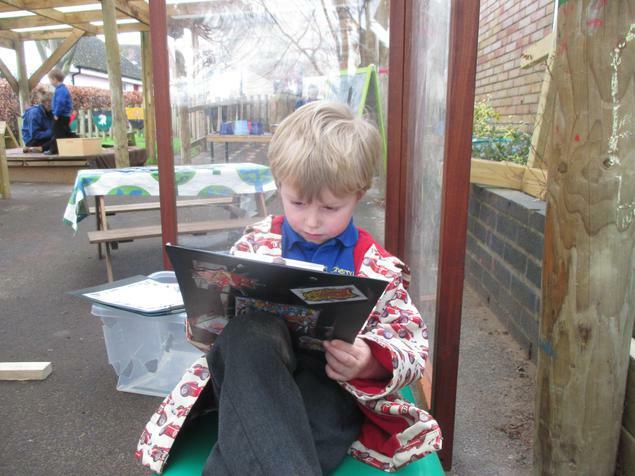 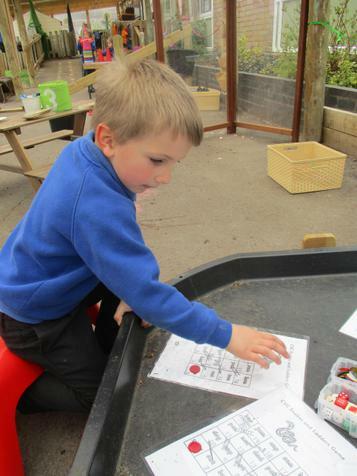 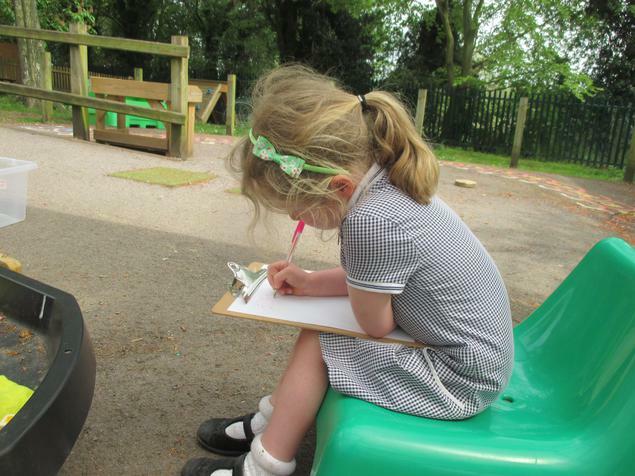 Will will also be practicing reading words which are trickier to blend, for example, 'spray' 'grass' and 'bright.' 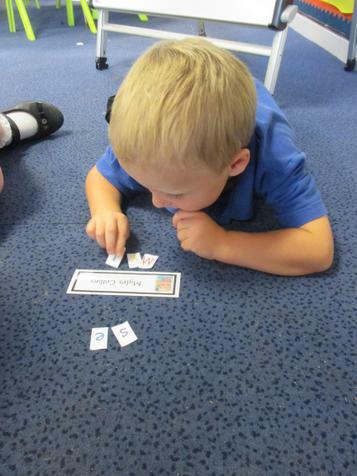 We will be learning how to remember a sentence and write it by using our sounds, Fred fingers and finger spaces. 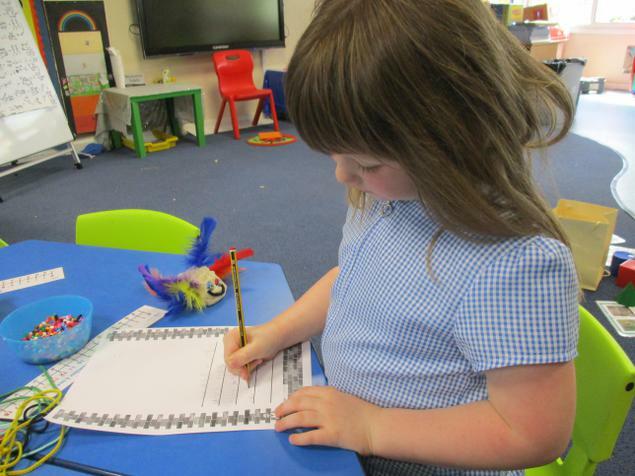 Some of us will even be thinking of our sentences to write about the stories that we have read. 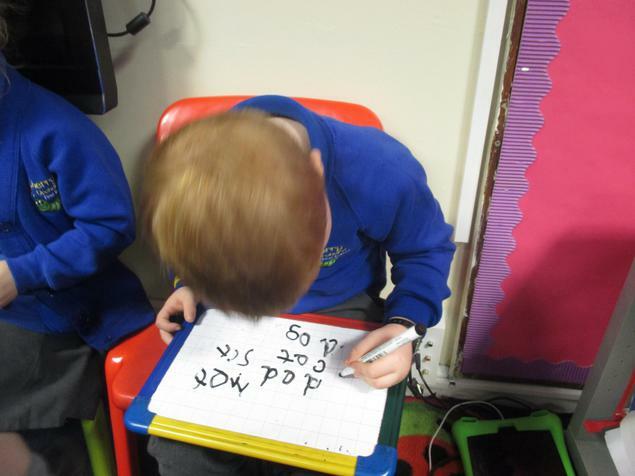 We will be learning some more 'red' words too... sounds tricky... but don't panic! 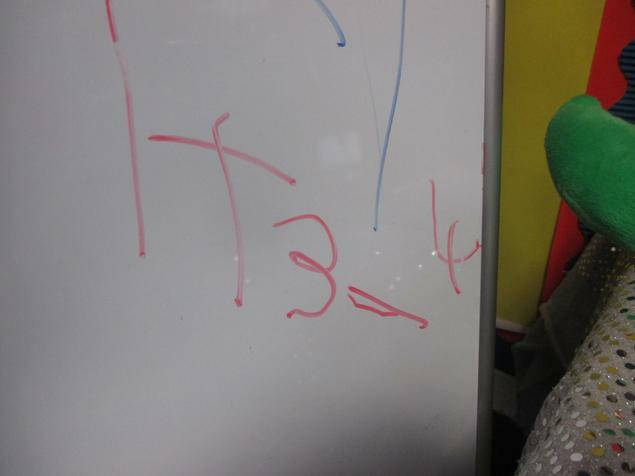 They are just words that we can't sound out, like the word 'the'. 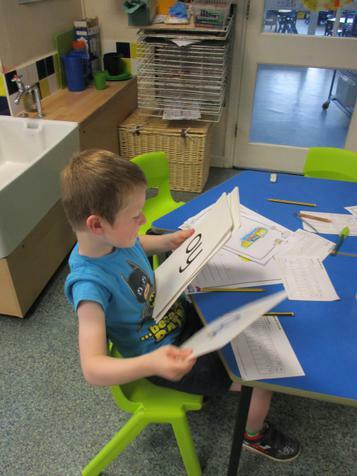 This half term some of us will consolidate our knowledge of set two sounds by practicing spotting the set two sounds in words and accurately reading them. 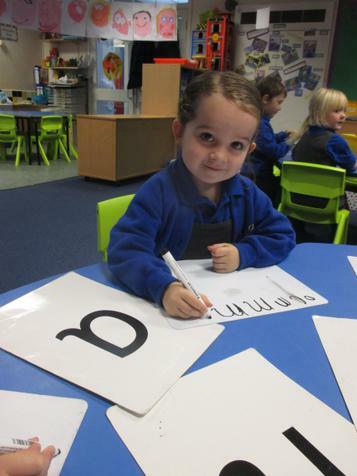 We will begin to learn the letter names and will move on to learning the RWI set three sounds which includes split digraphs... sounds tricky... but don't panic! 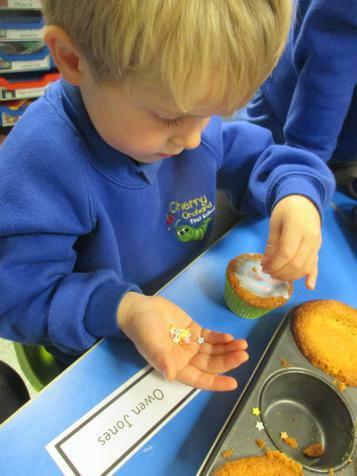 It just means two letters that make one sound but they aren't next to each other in the word, for example, a-e like in the word cake. 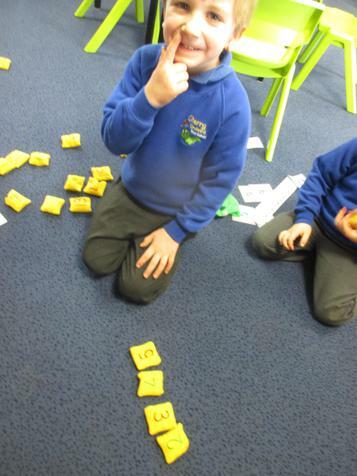 Set three also includes alternative graphemes for phonemes... sounds tricky... but don't panic! 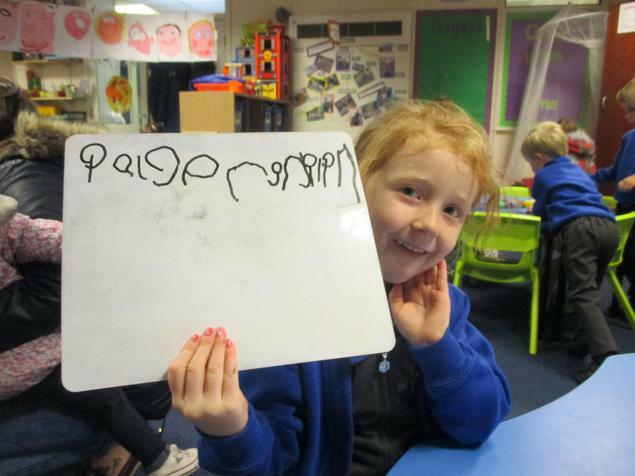 It just means that we will learn that some of the sounds that we know can be written in a different way, for example, ee (like in the word teeth) can also be written ea (like in the word tea) - they are the same sound but they have a different appearance. 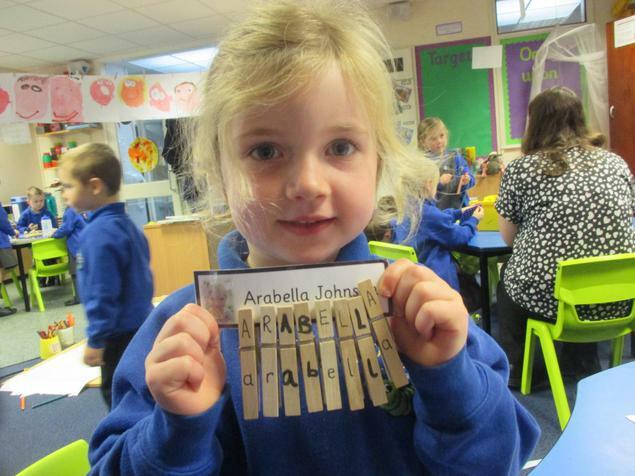 Which ever group your child is in Miss Robinson will continue to send you a message to let you know the words or sounds that we have practiced reading and writing so that you can practice at home. 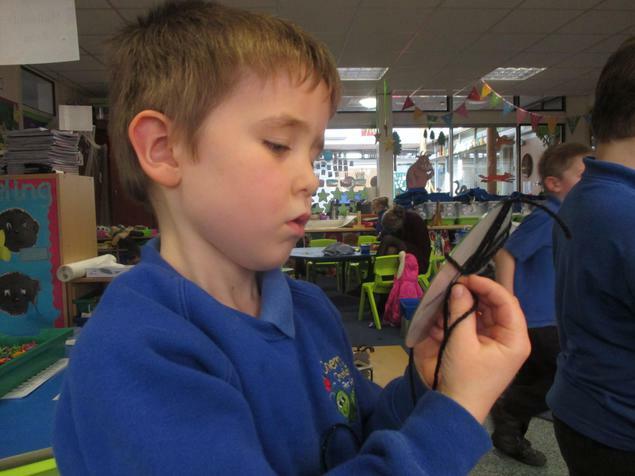 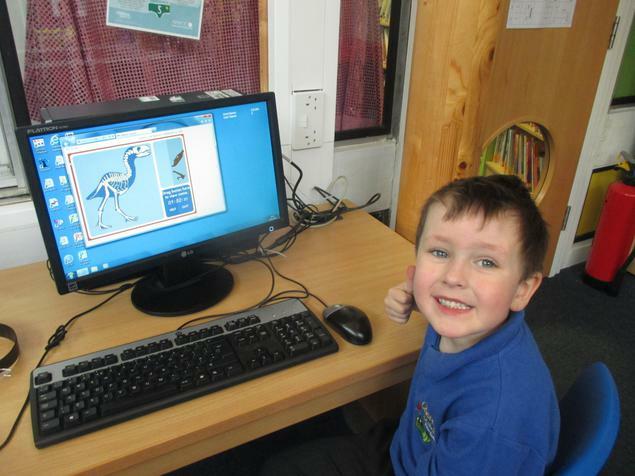 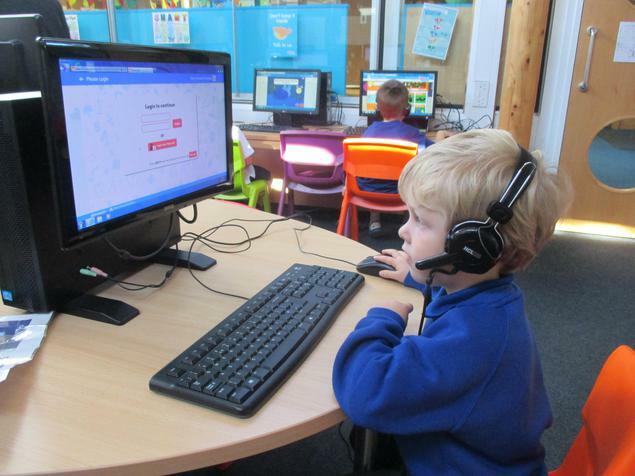 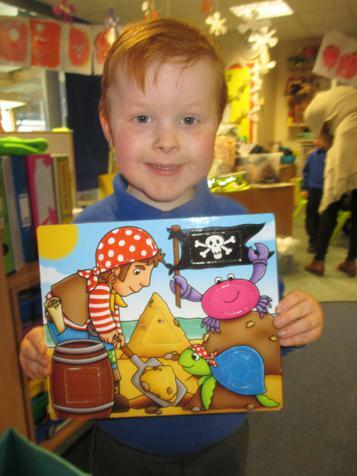 Please keep practicing reading the sounds with the sound cards too as the quicker we can read them the easier reading words becomes. 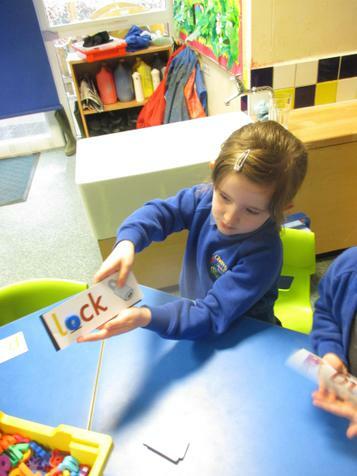 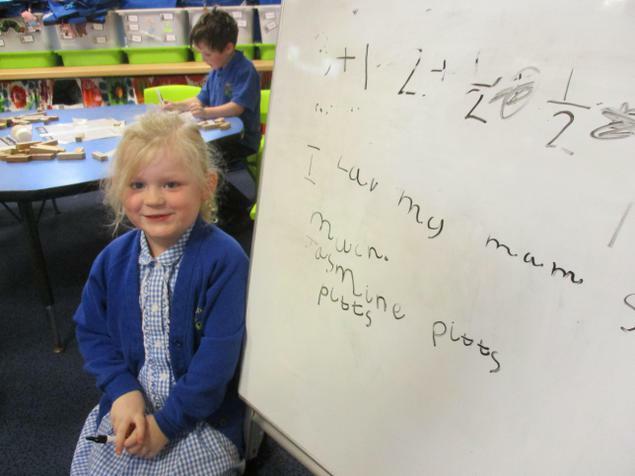 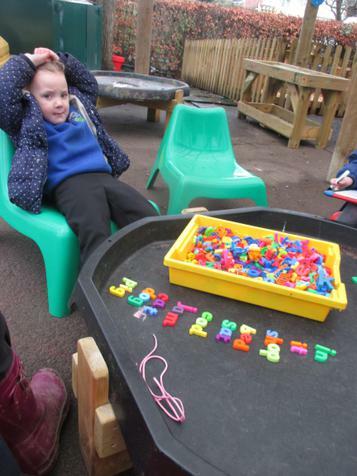 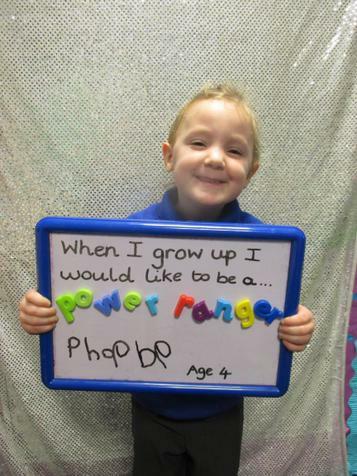 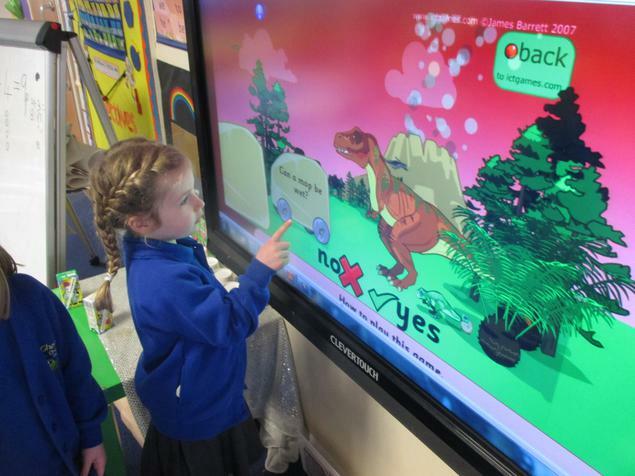 Please don't panic if you are new to phonics! 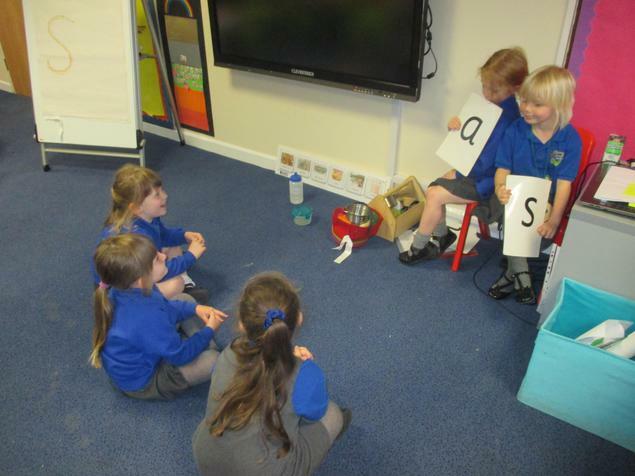 You can find out how to pronounce each of the sounds here: http://www.ruthmiskin.com/en/resources/sound-pronunciation-guide/ or you can ask any of the Reception team if you are unsure. 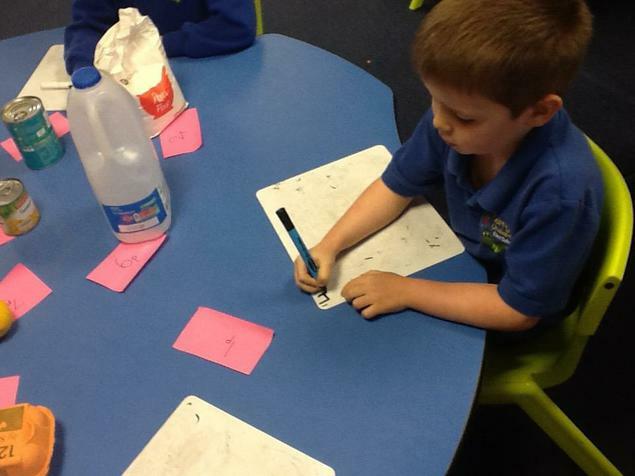 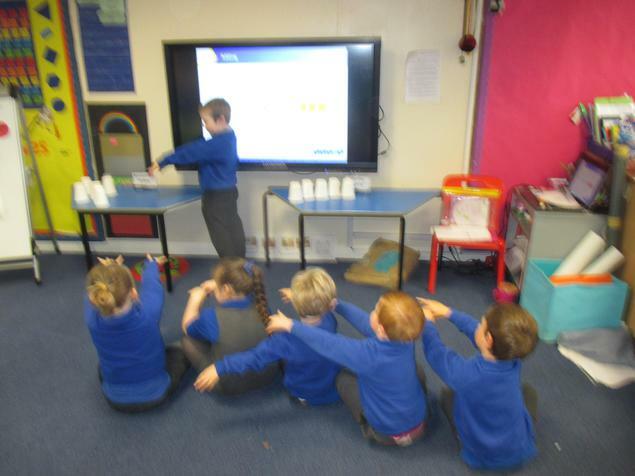 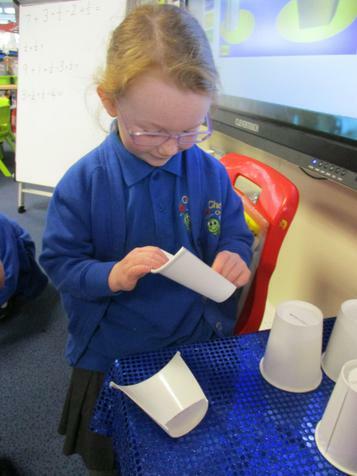 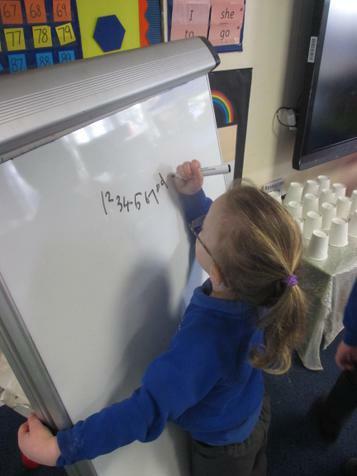 We will continue to practice writing and solving addition and subtraction calculations which include both whole numbers and 1/2 using the cups, jottings and number lines to help us. 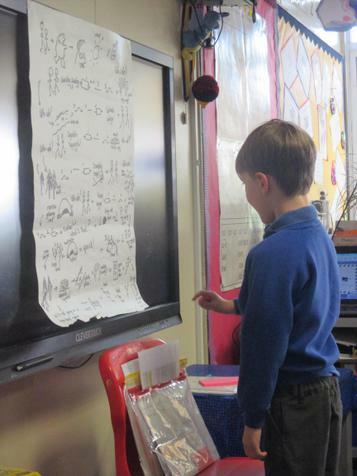 Some of us will learn to use a blank number line to solve calculations that include just whole too. 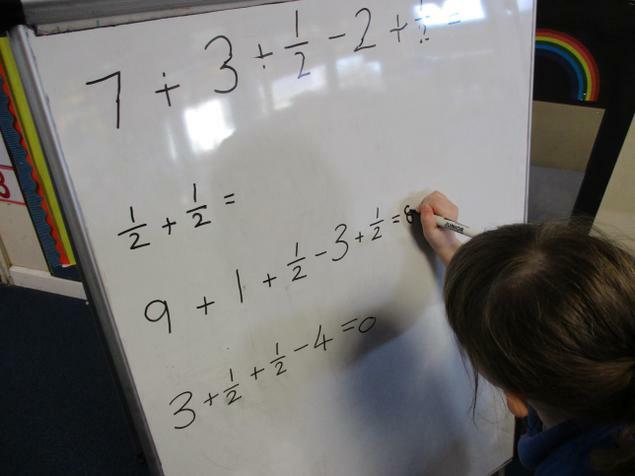 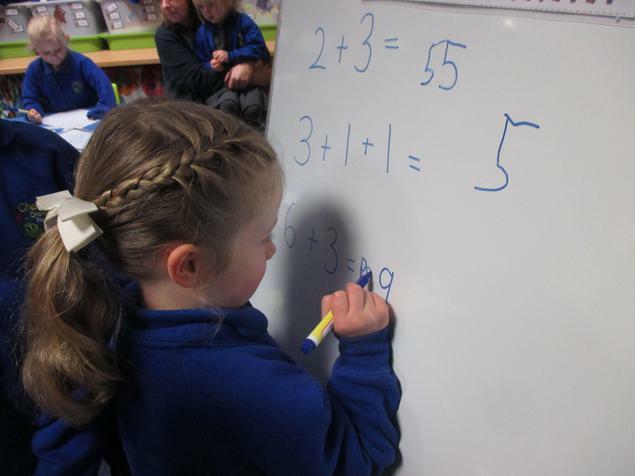 We will also learn how to write and recognise a quarter (1/4) as well as solve addition calculations that contain quarters. 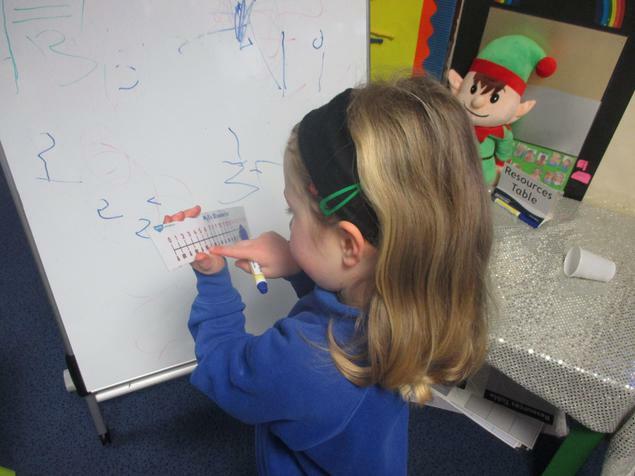 We will continue to practice reading and writing the numerals 0-20, putting them into order and match them to the appropriate quantities. 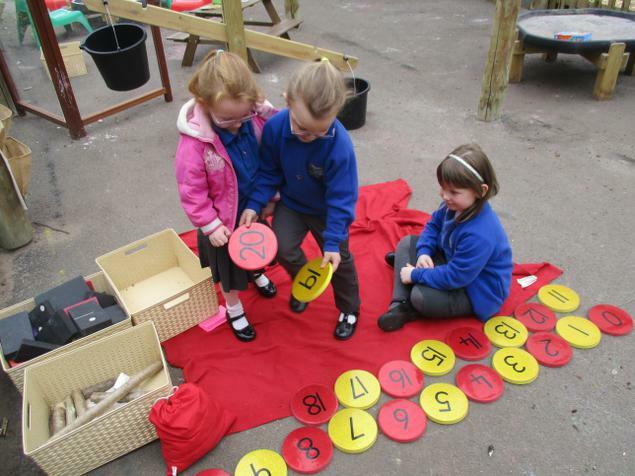 We will learn to how to read the numerals to 20 in both English and Maths language to help to develop our understanding of place value. 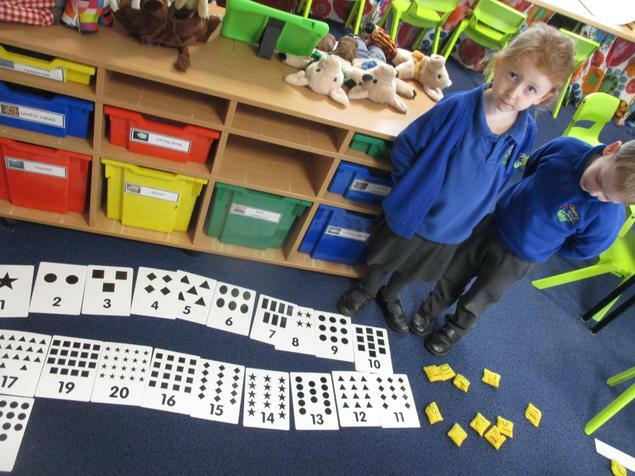 We will continue to develop our knowledge of number by thinking about the numbers that are one more, one less or double a given number. 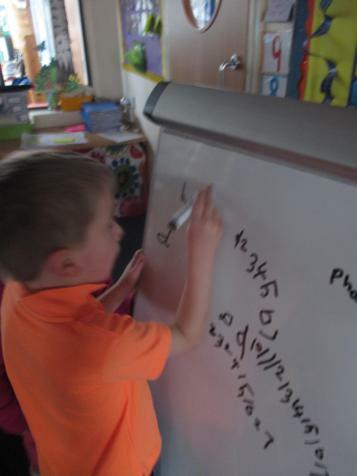 Some of us will begin to develop our fluency further by thinking about the numbers that are before, after or in between given numbers. 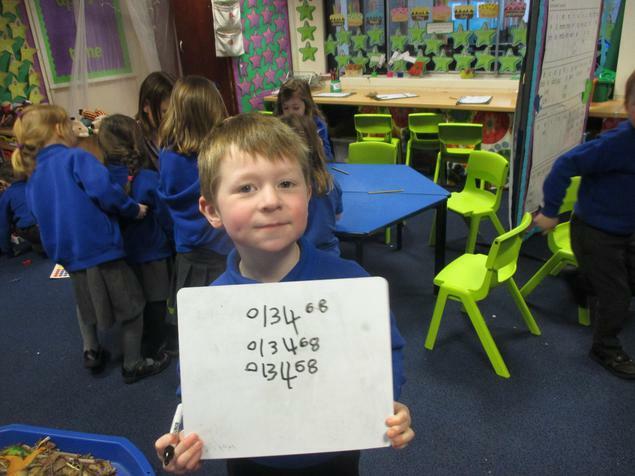 A few of use will begin to learn the number bonds to 5. 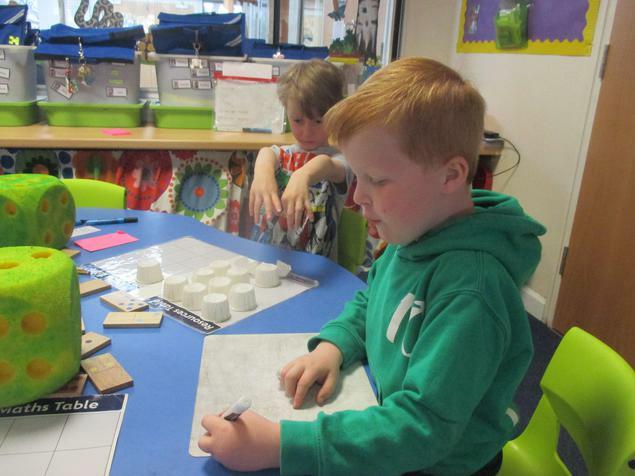 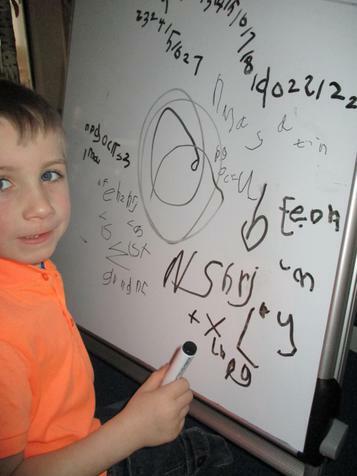 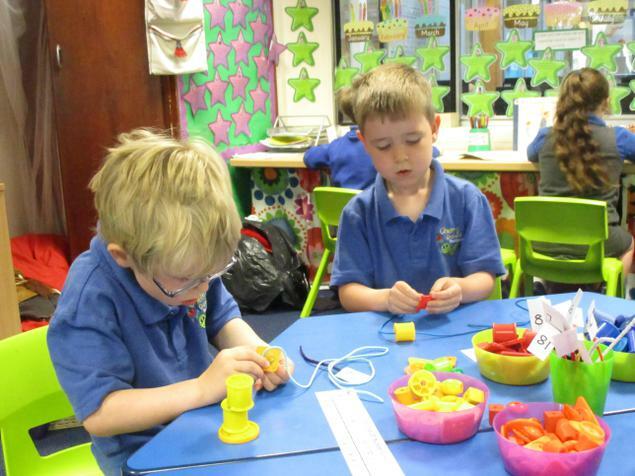 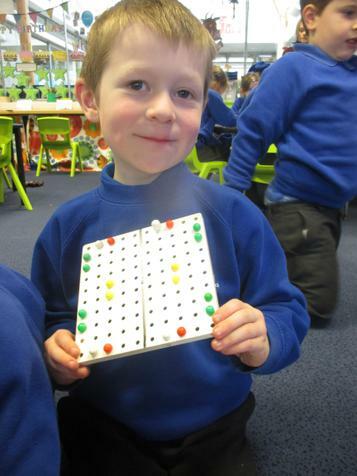 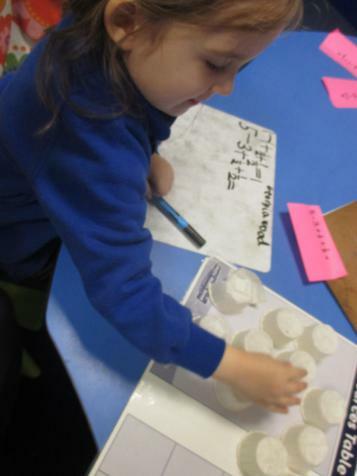 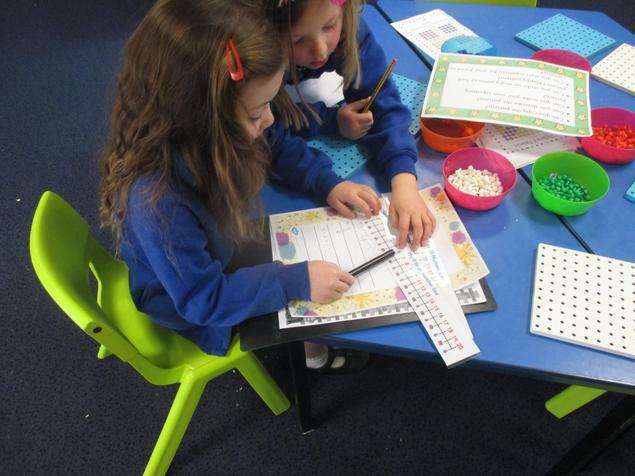 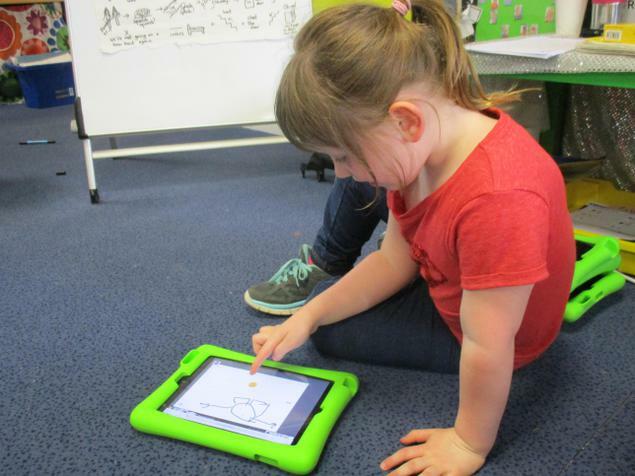 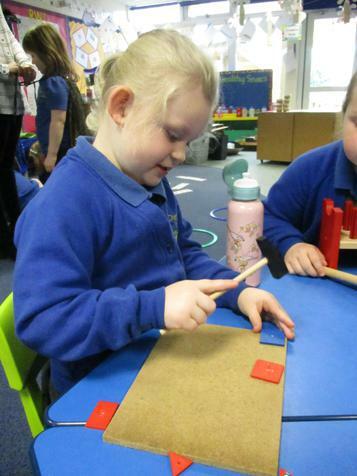 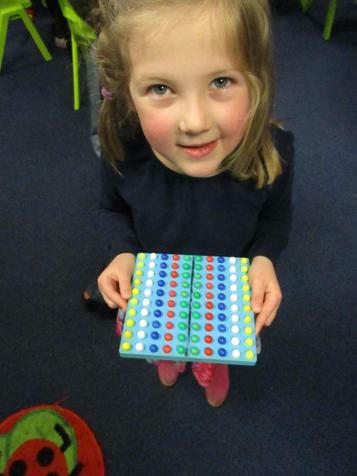 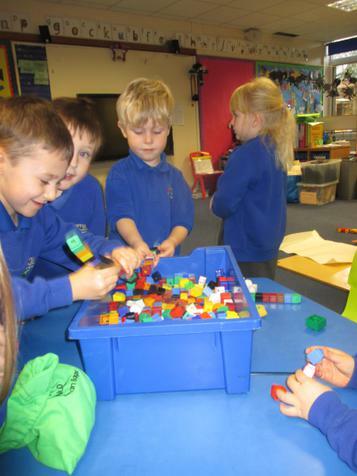 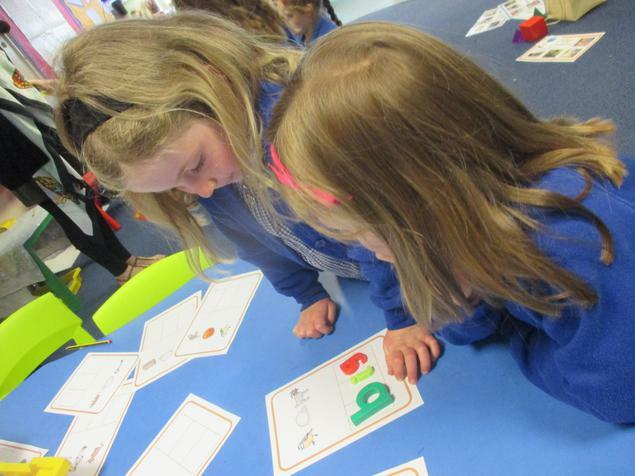 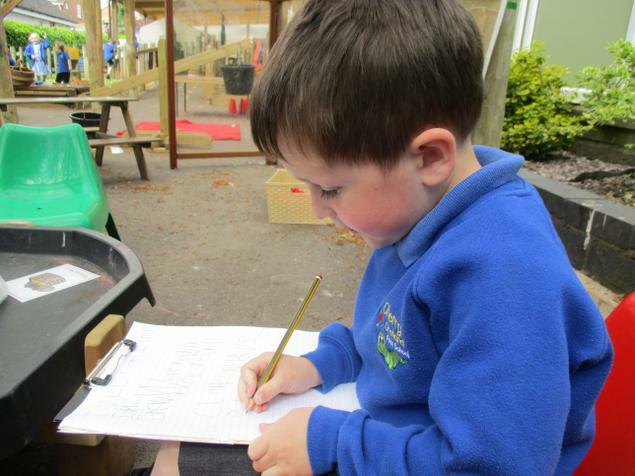 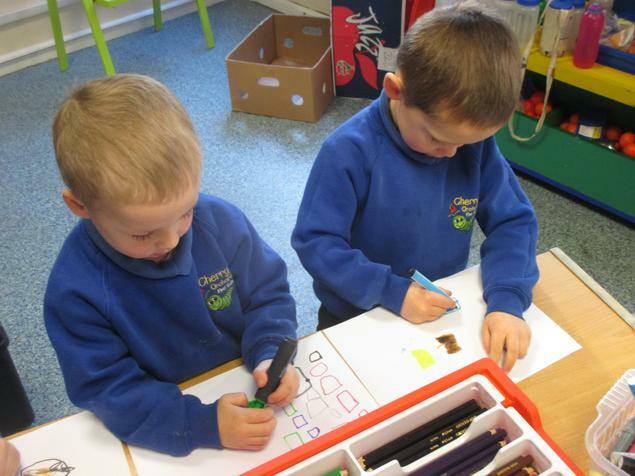 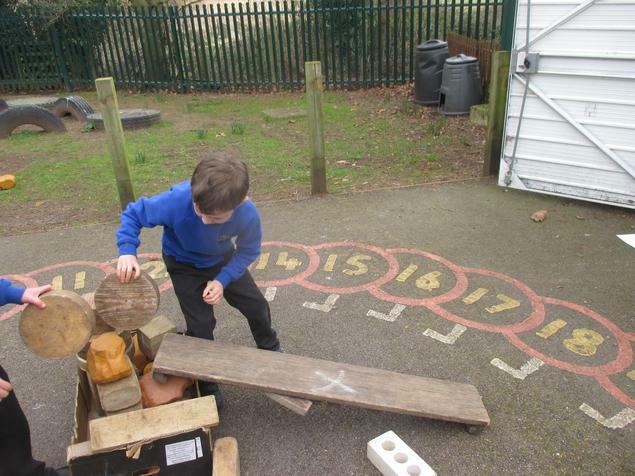 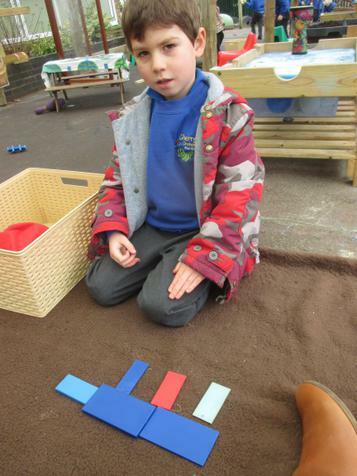 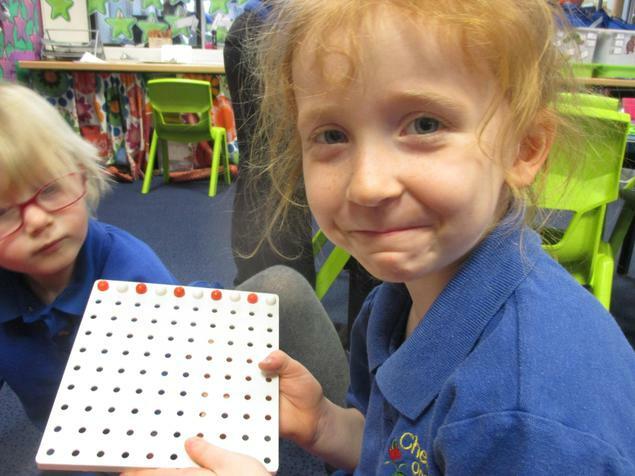 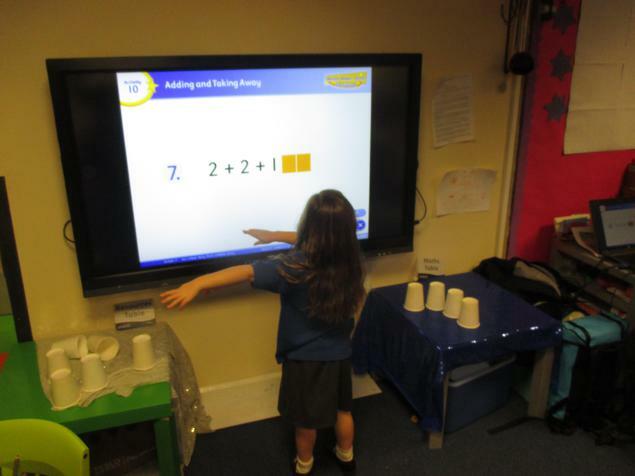 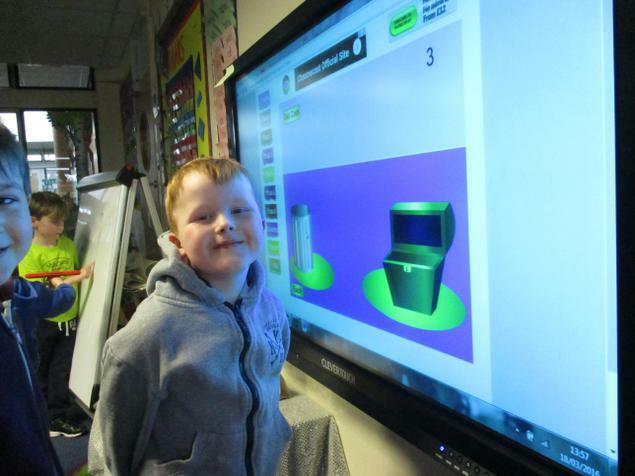 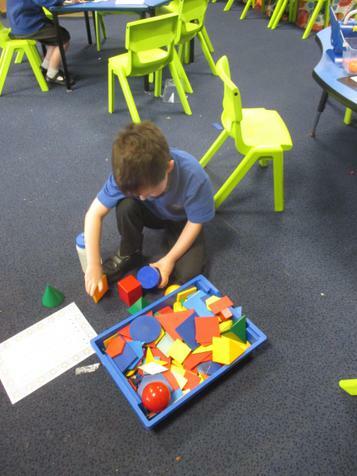 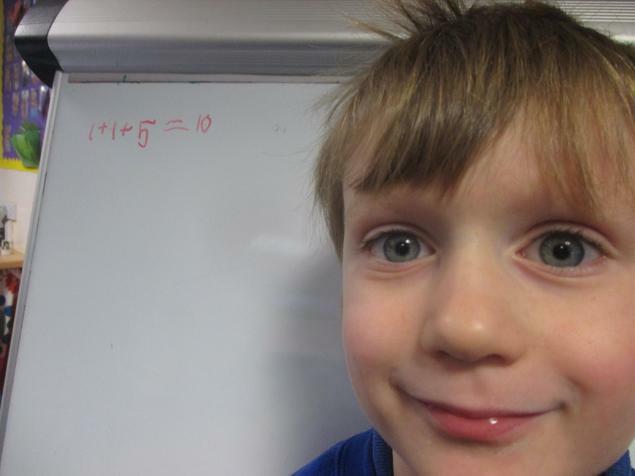 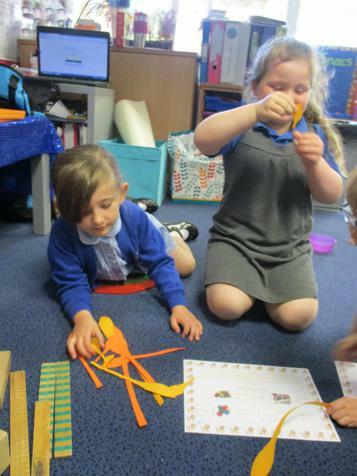 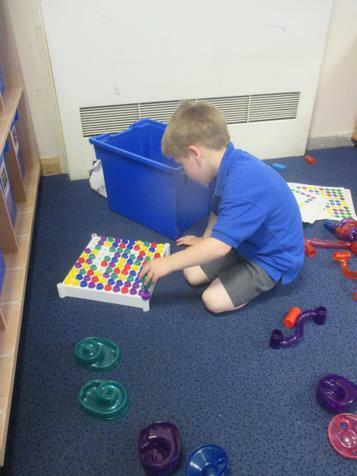 See our maths corner page to watch the children's 'how to' guides. 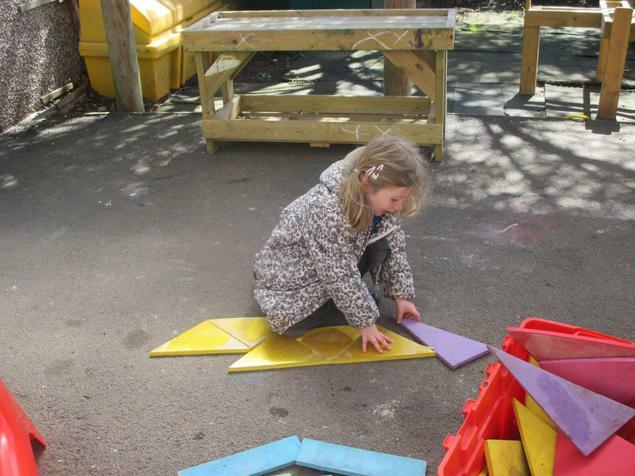 This half term we will consolidate our knowledge of 2d and 3d shape names and properties and we will look for these shapes in the environment. 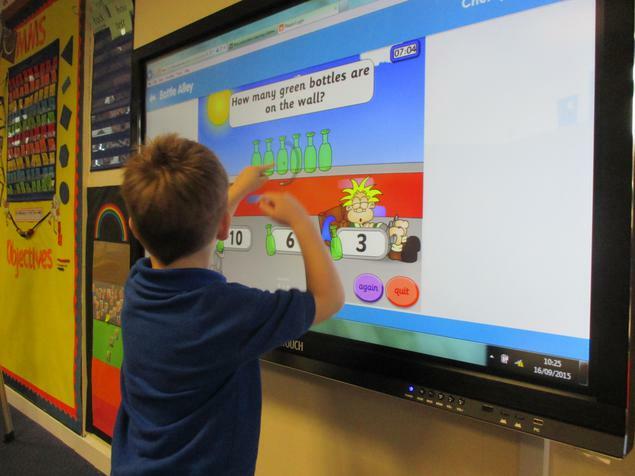 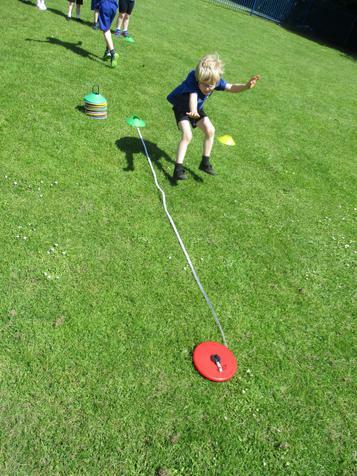 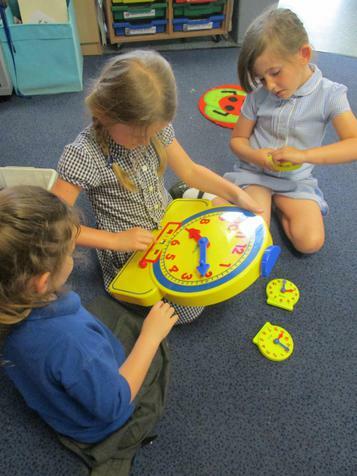 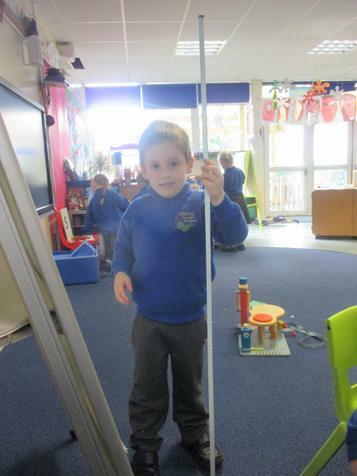 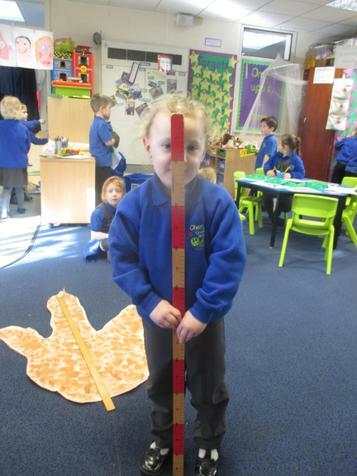 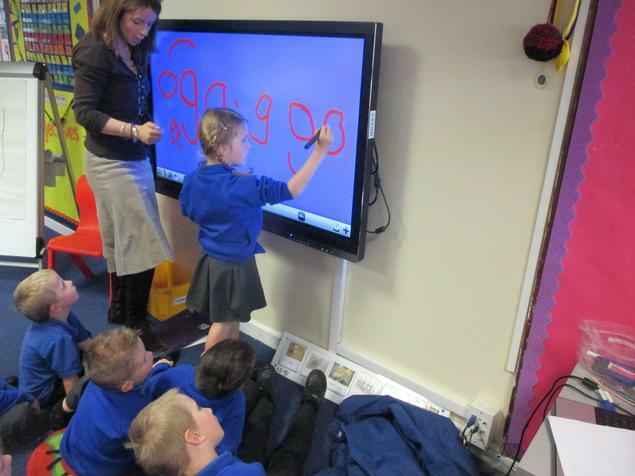 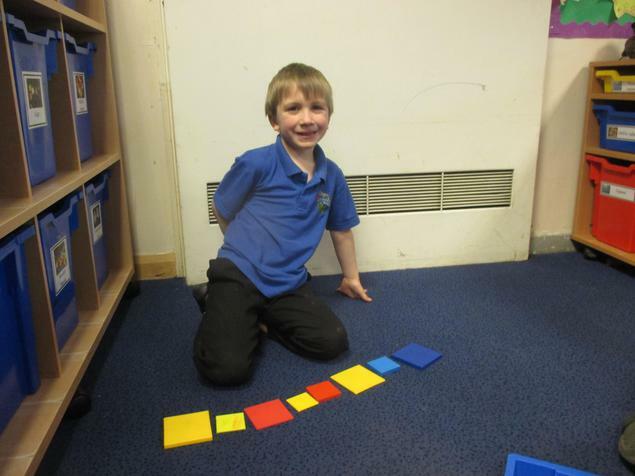 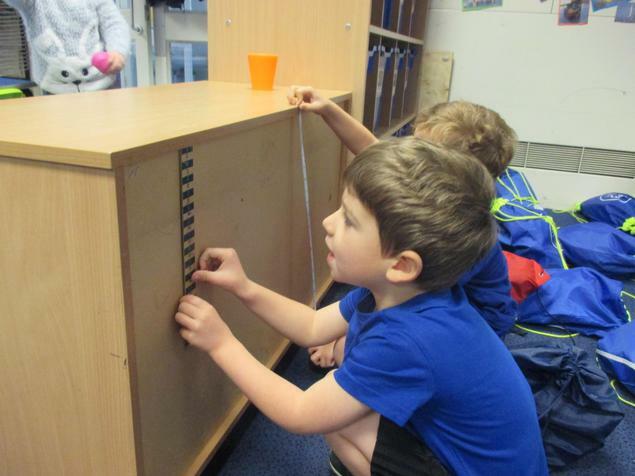 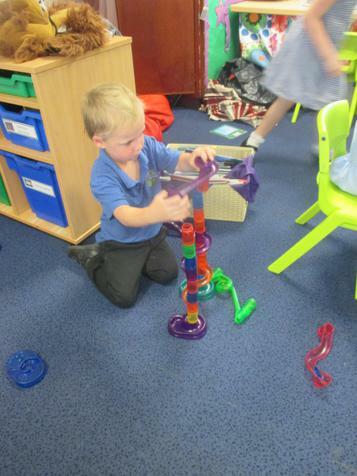 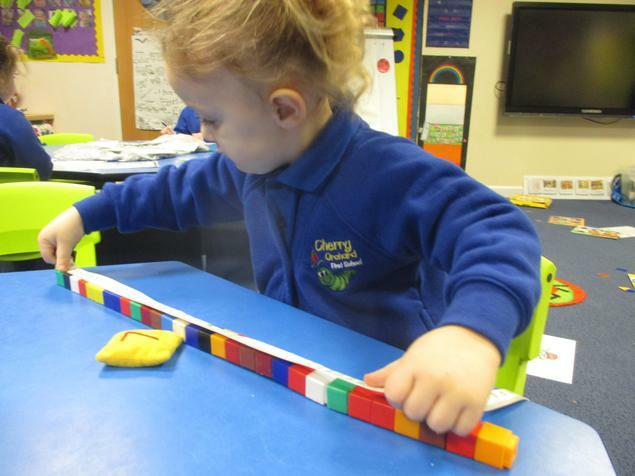 We will also develop our understanding of time by learning how to measure a minute and to tell 'o'clock' times. 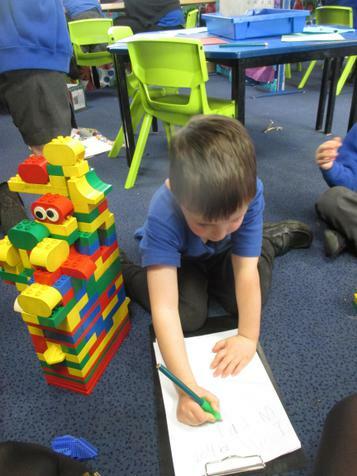 We will also begin to learn about data handling by collecting information from our peers and representing it in a block graph. 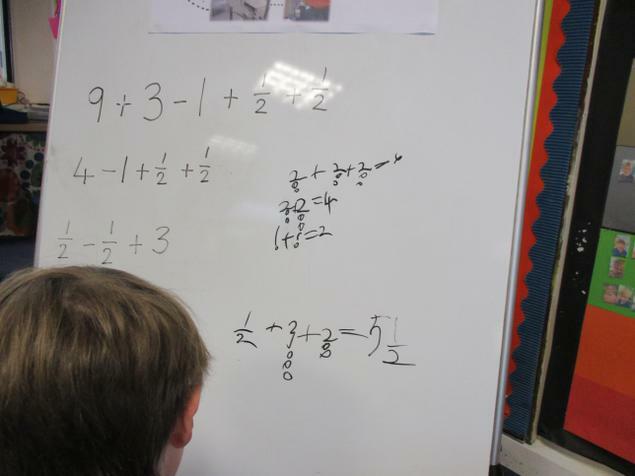 Here is an overview of all of the maths objectives that we will work towards throughout the year. 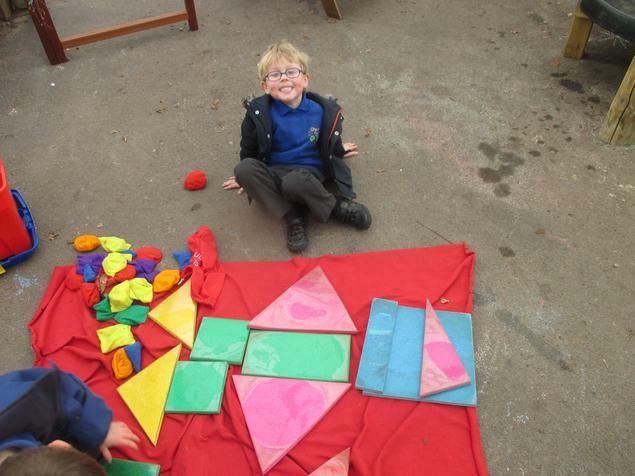 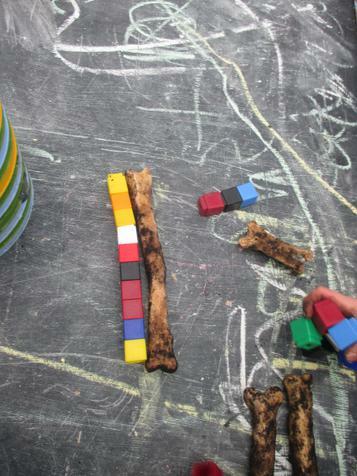 They are arranged into six blocks, one for each half term. 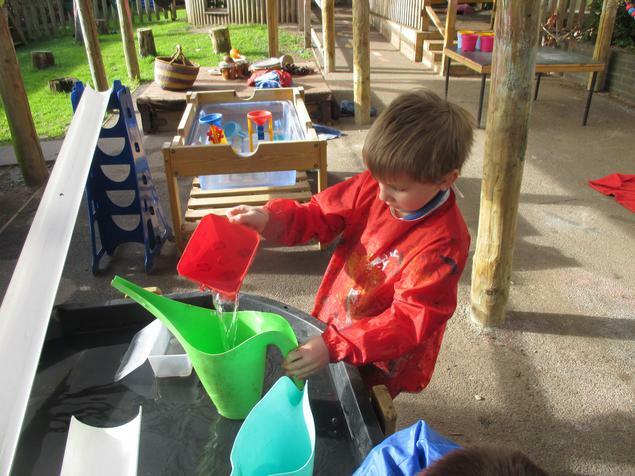 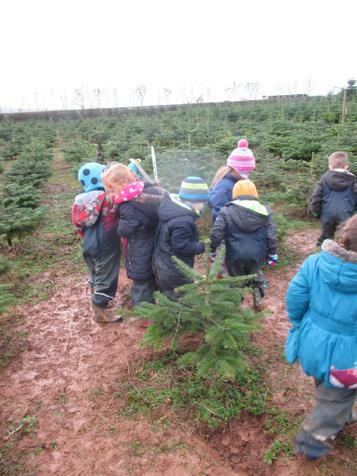 Learning doesn't just happen at school! 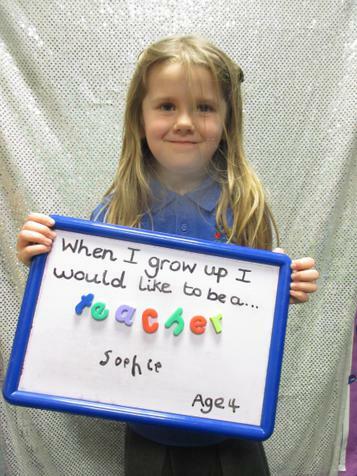 You are wonderful teachers at home too. 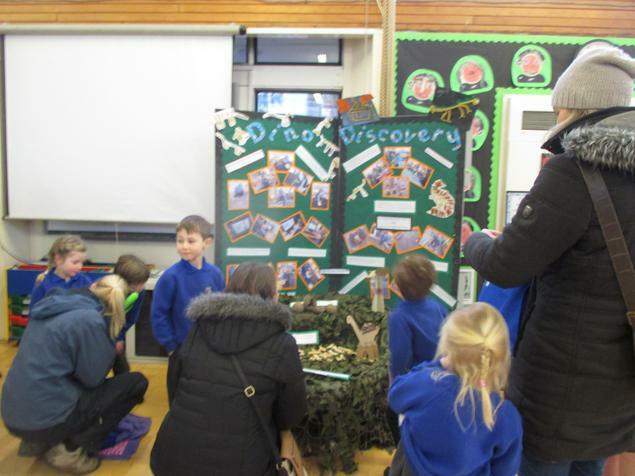 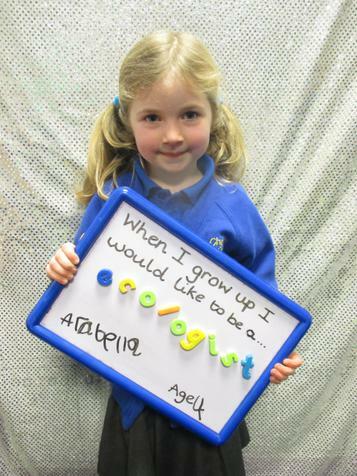 If we do amazing things outside of school, Miss Robinson and the Early Years team want to know! 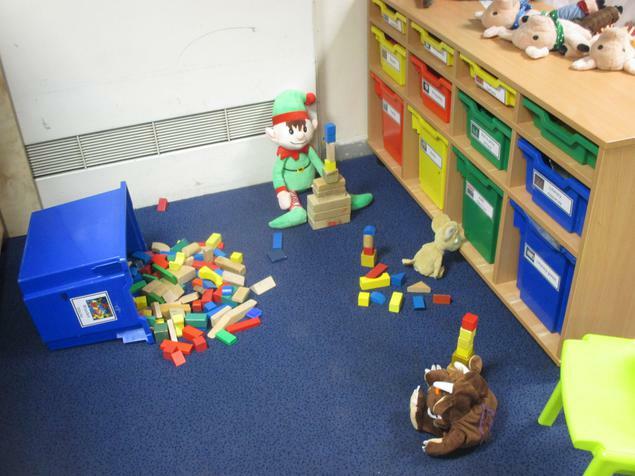 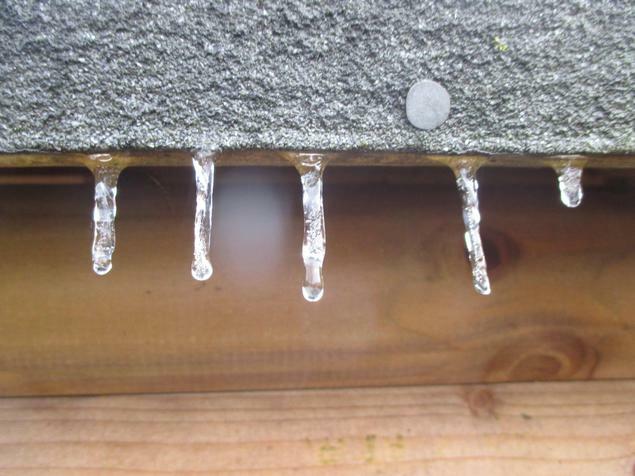 Please bring in any work or speak to a member of the team in the morning about it. 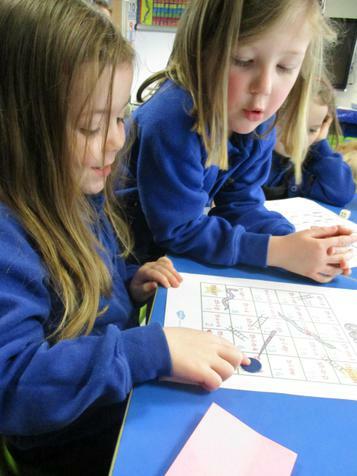 We have our "Busy Bees" board in the classroom to help you keep us up to date. 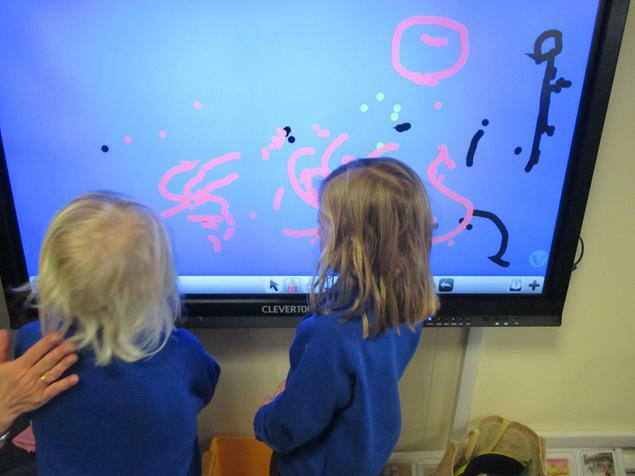 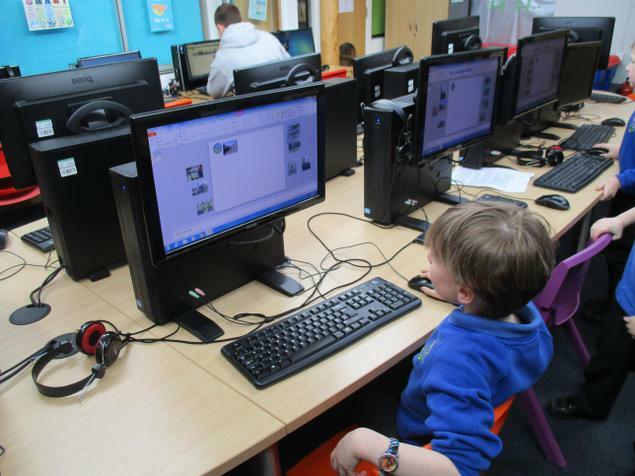 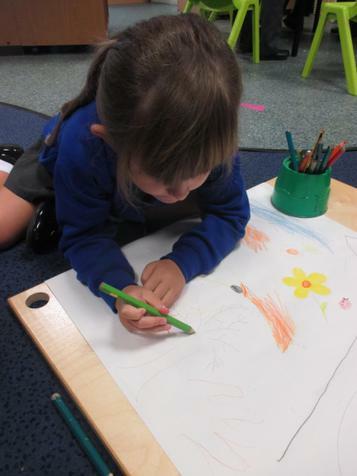 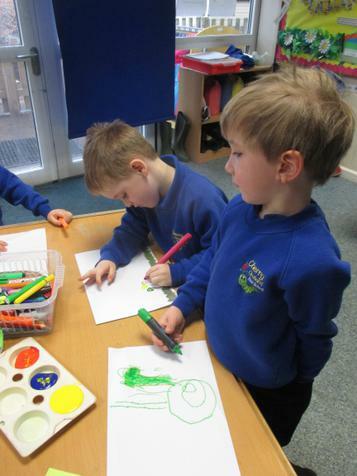 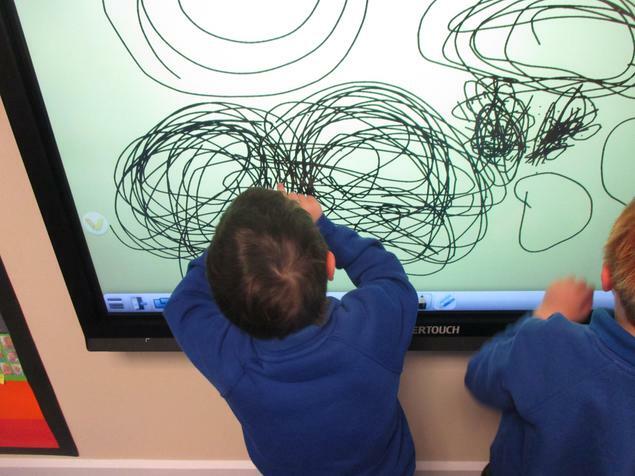 We can put all of our wonderful work on from home on here before sharing it with the class during show and tell. 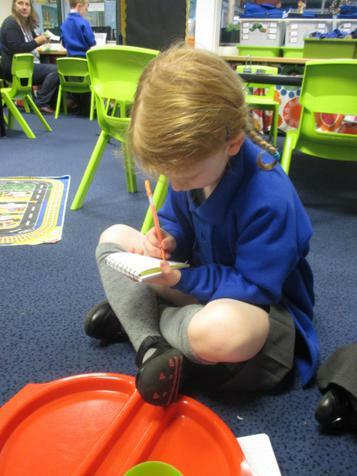 It will even go into our learning journals. 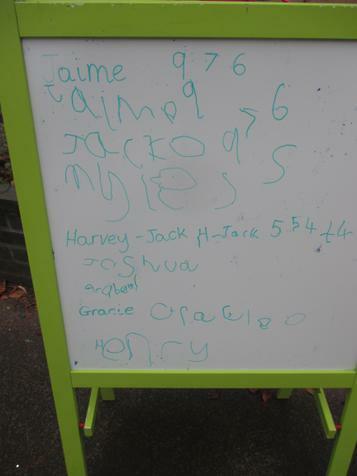 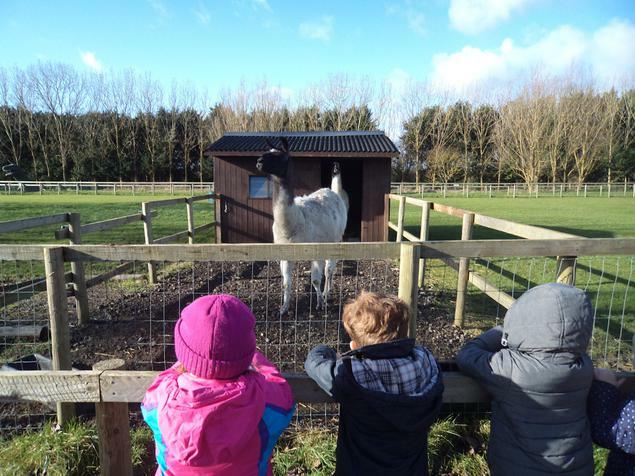 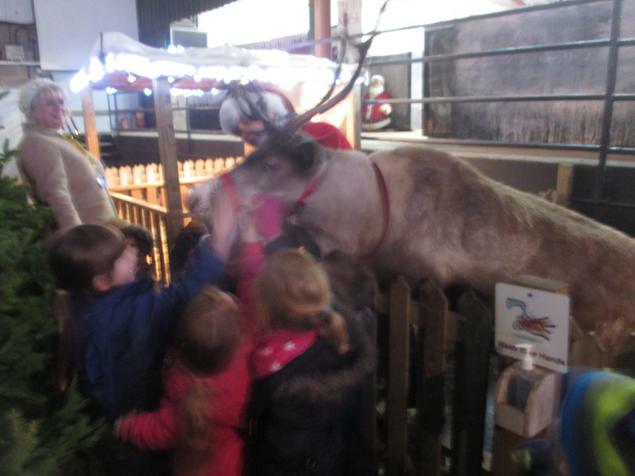 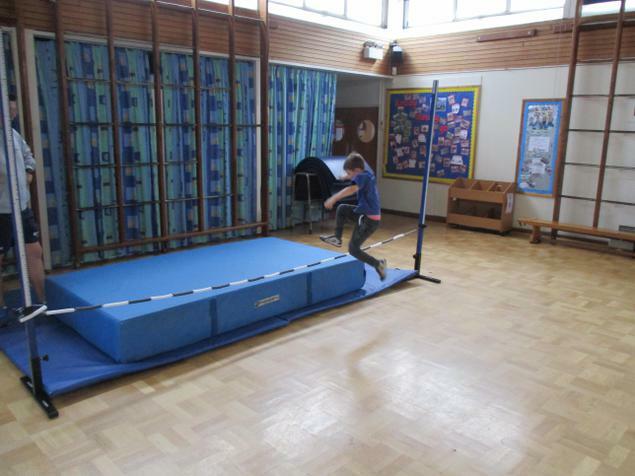 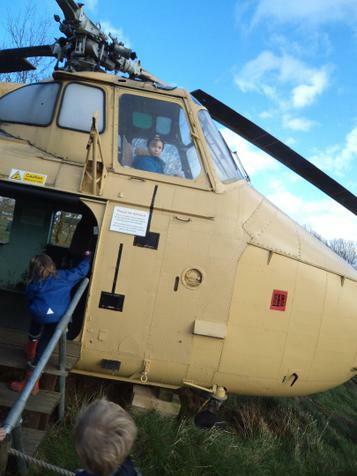 Any exciting experience can be shared on this board too; we love to see photographs from adventures or activities. 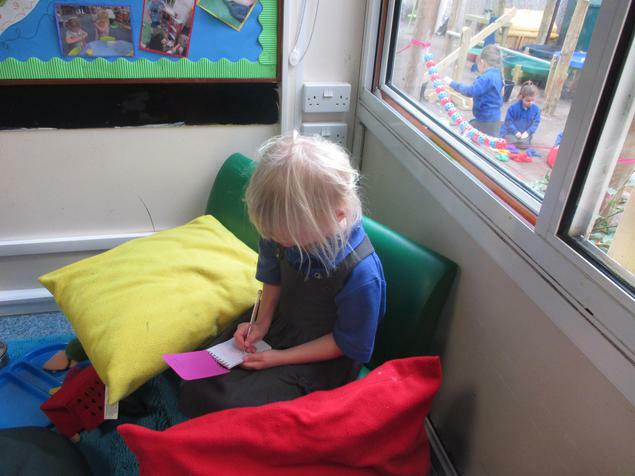 A scribbled note sharing an achievement is perfect too! 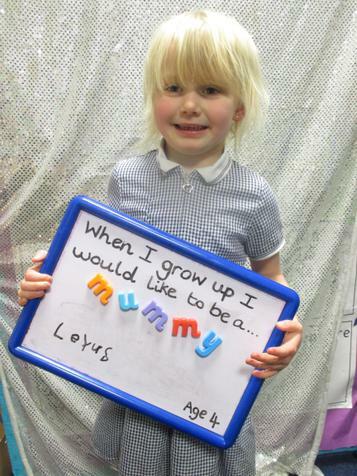 There are cards on the board for you to write your proud parent moments on. 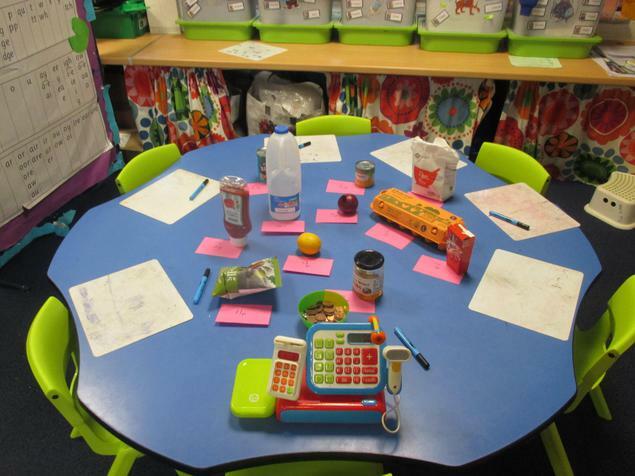 This year Miss Robinson will also send you a weekly challenge to give you a few extra ideas of how you could support your child's learning at home. 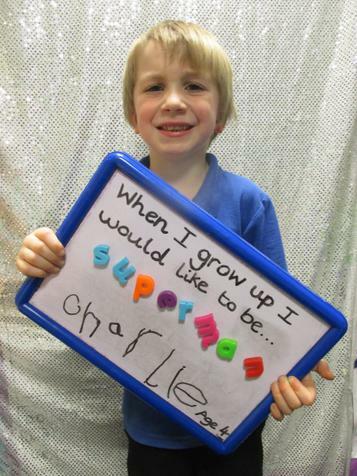 Thank you for your all of your support so far! 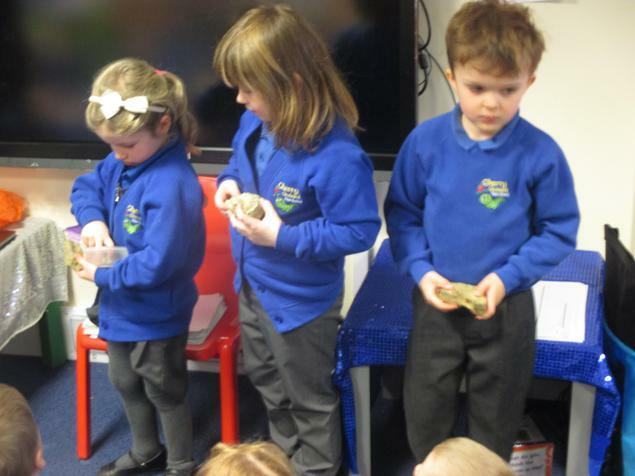 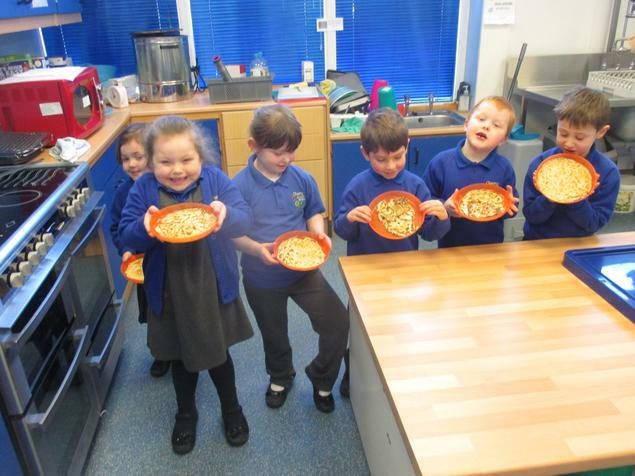 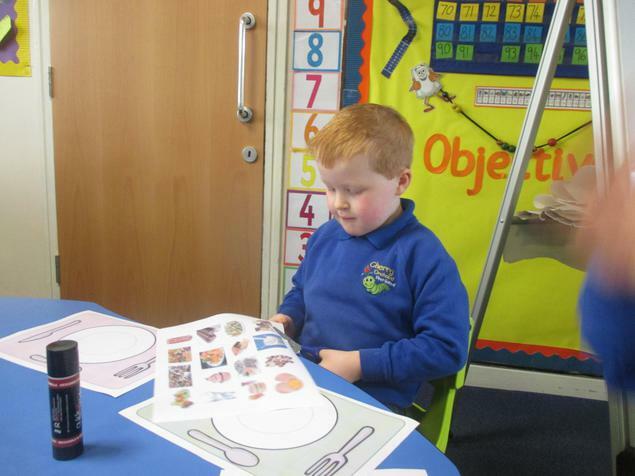 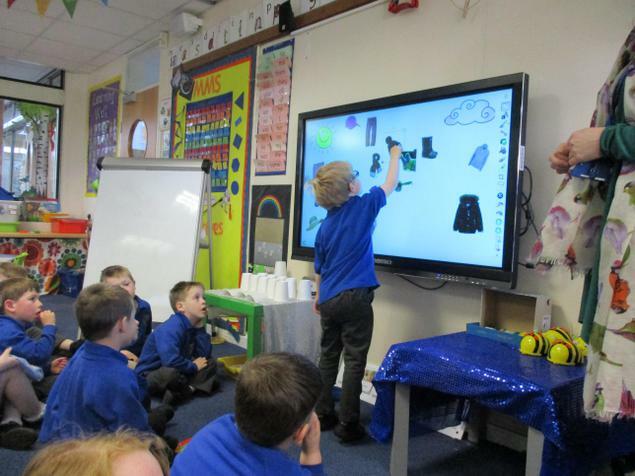 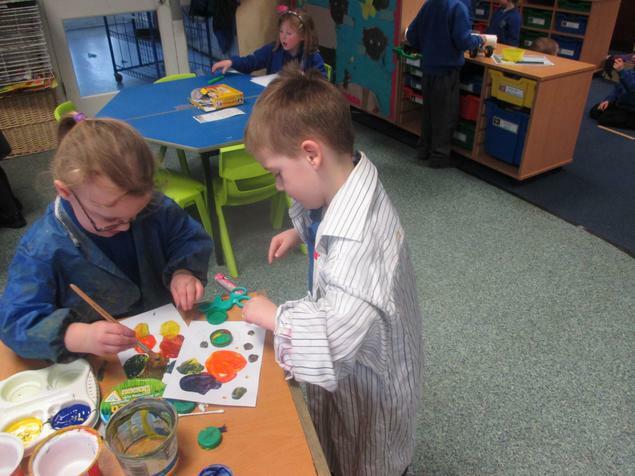 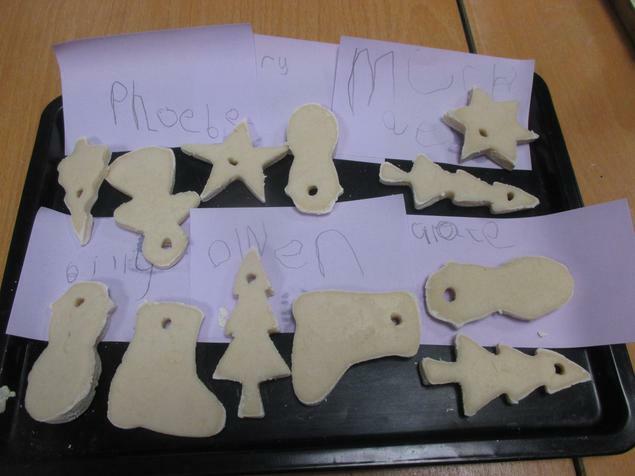 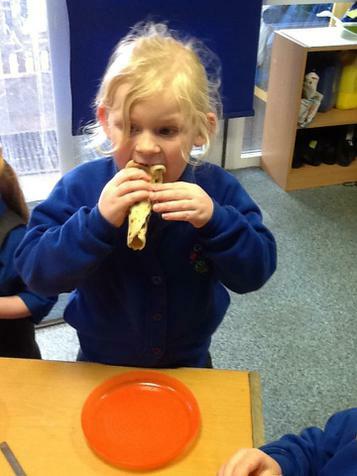 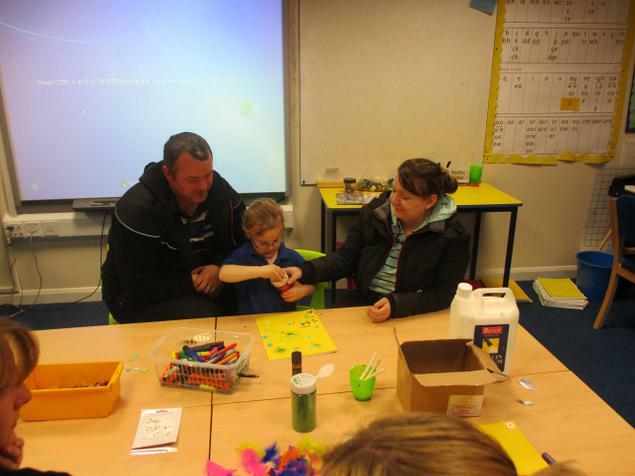 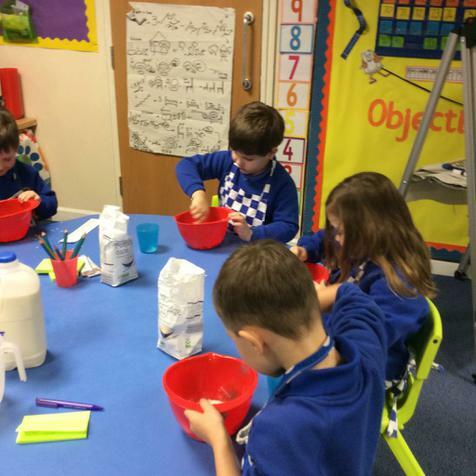 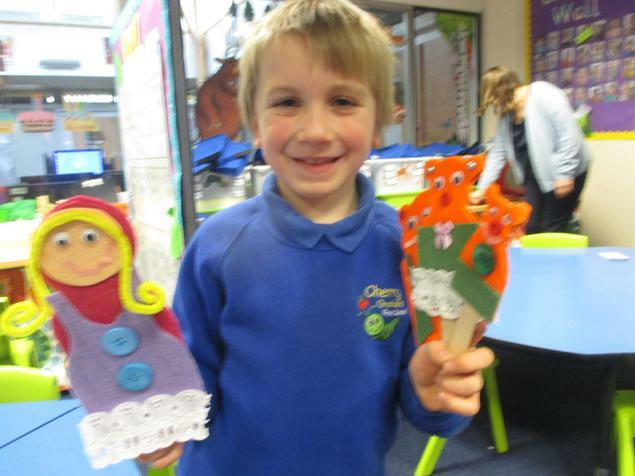 The children have really enjoyed sharing their work and experiences with the class. 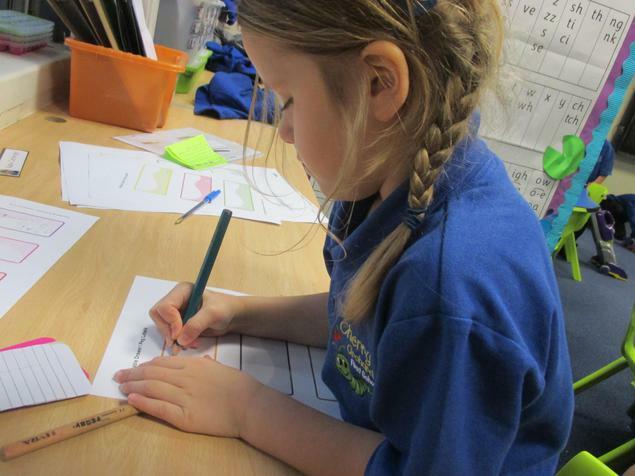 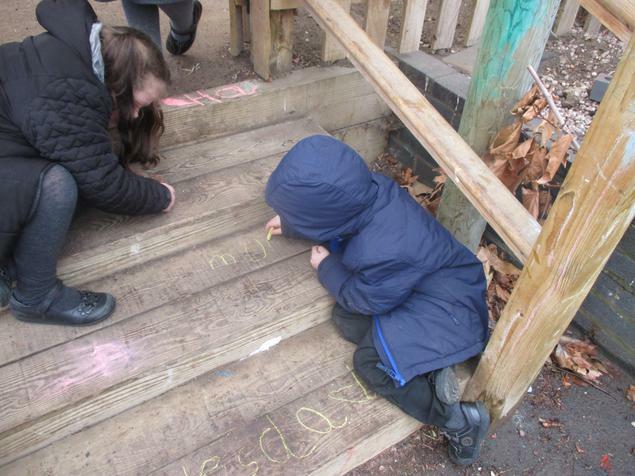 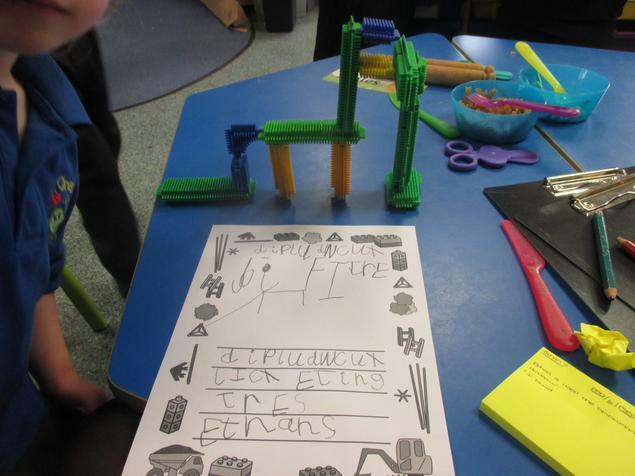 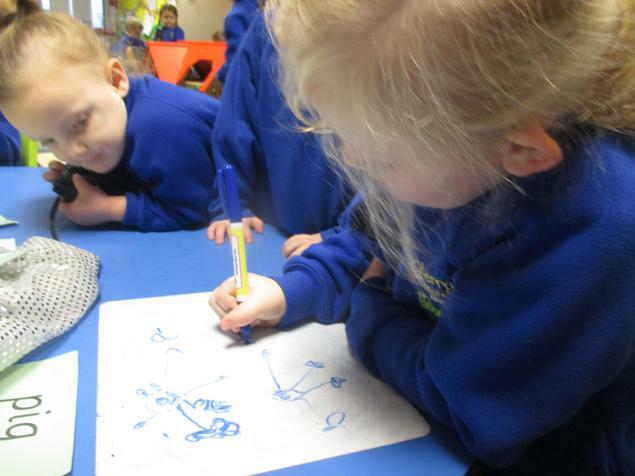 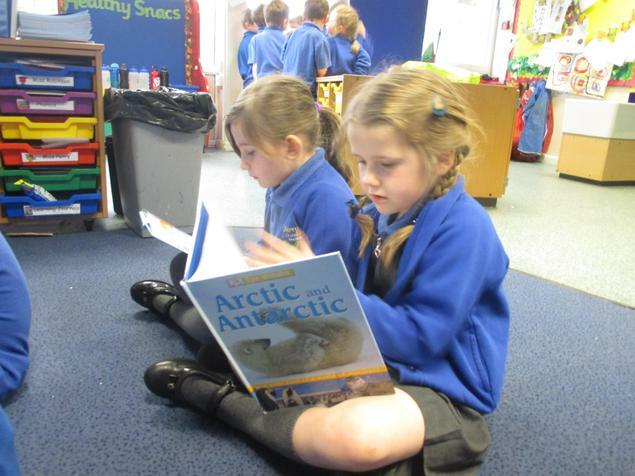 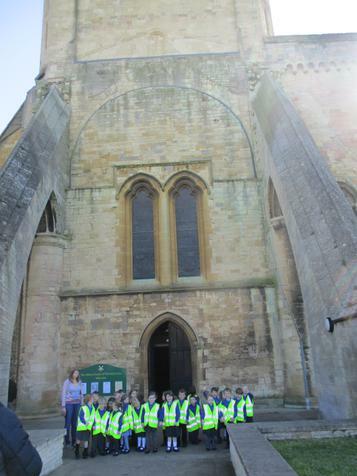 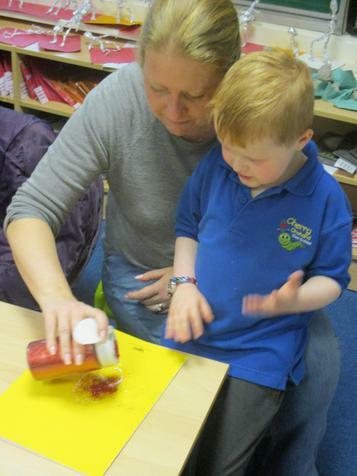 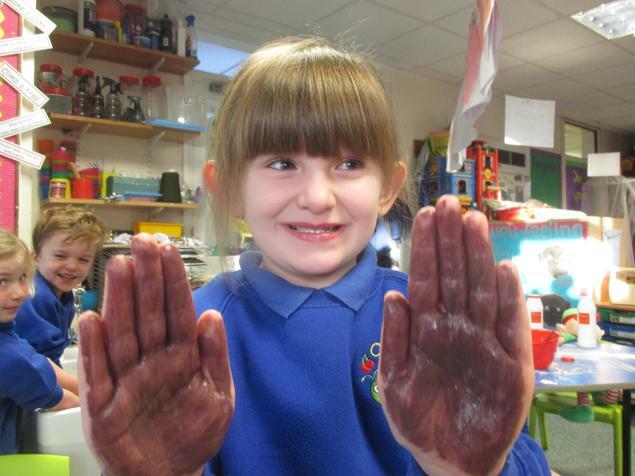 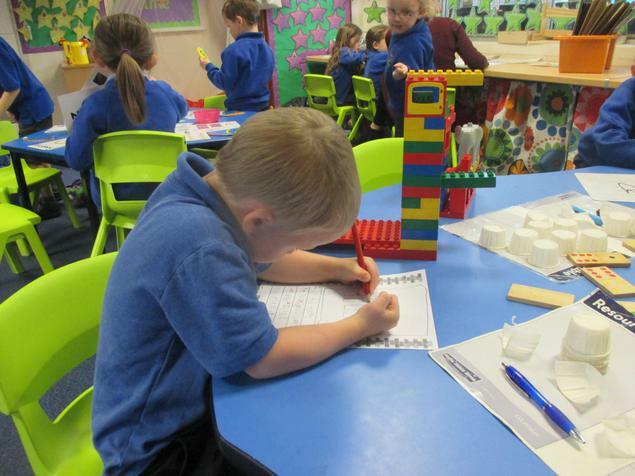 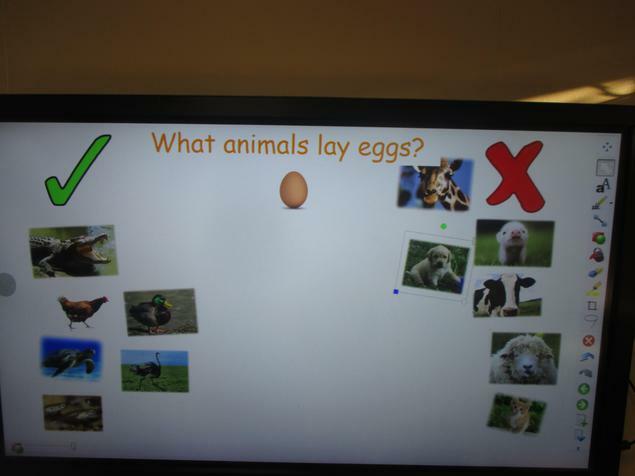 It's been wonderful to see lots of children keen to carry on our topic learning at home.